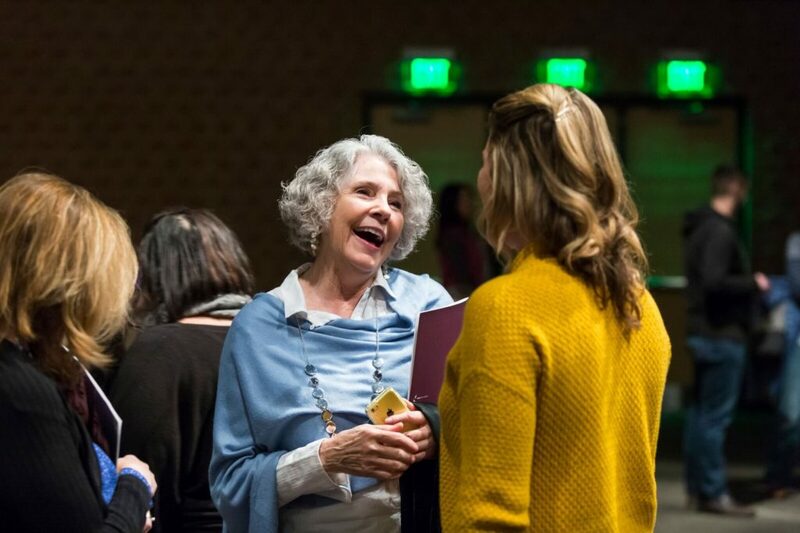 Keep up with Bester Community of Hope and neighborhood gatherings in a variety of ways! Find news and media here regarding community activities in your area, or check out one of our social media feeds for more updates. Interested in writing an article for the “Citizen” blog or sharing a noteworthy news story or activity on our platform? Contact/Forward to us here: connect@besterhope.org to get published. 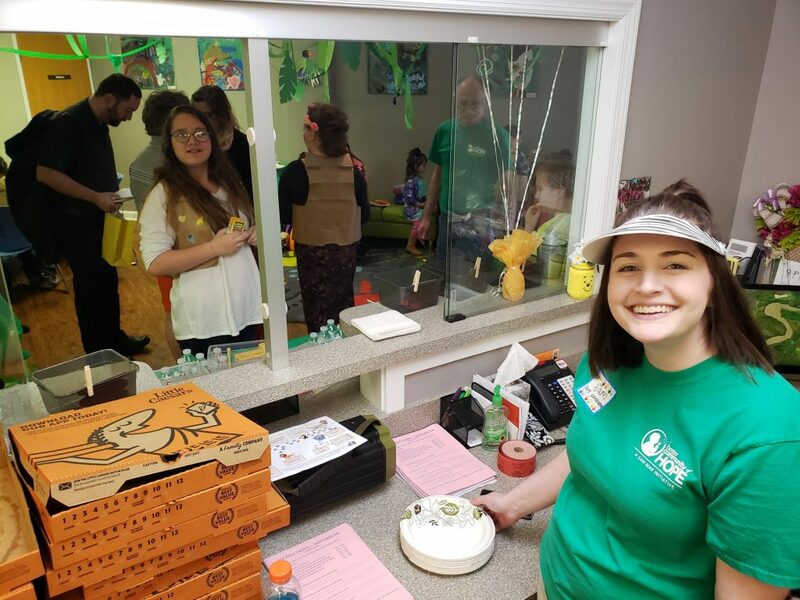 Pouring rain didn’t stop countless families from attending Family Day on this Good Friday at the new Bester Community of Hope offices in Hagerstown, Maryland. 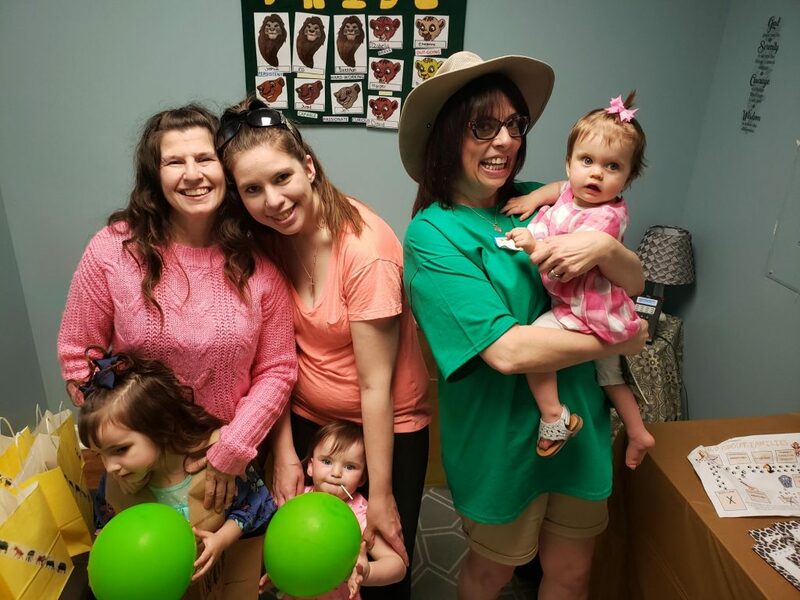 This year’s theme “Wild About Families” transformed the community office into a jungle of activities centered around family photographs and activities about thriving families. 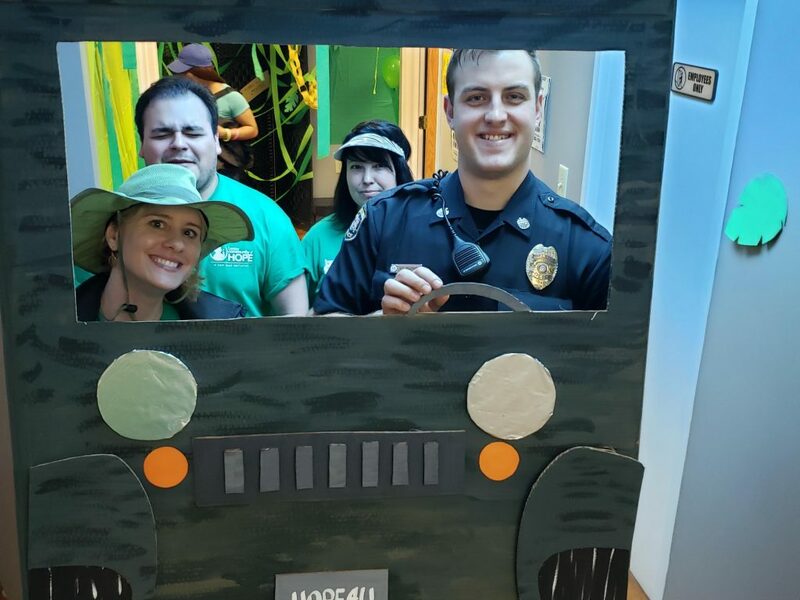 “Our goal every year is to have fun, make connections and celebrate all the things that make families strong by promoting the protective factors,” explained Bester Community of Hope Director Jennifer Younker. 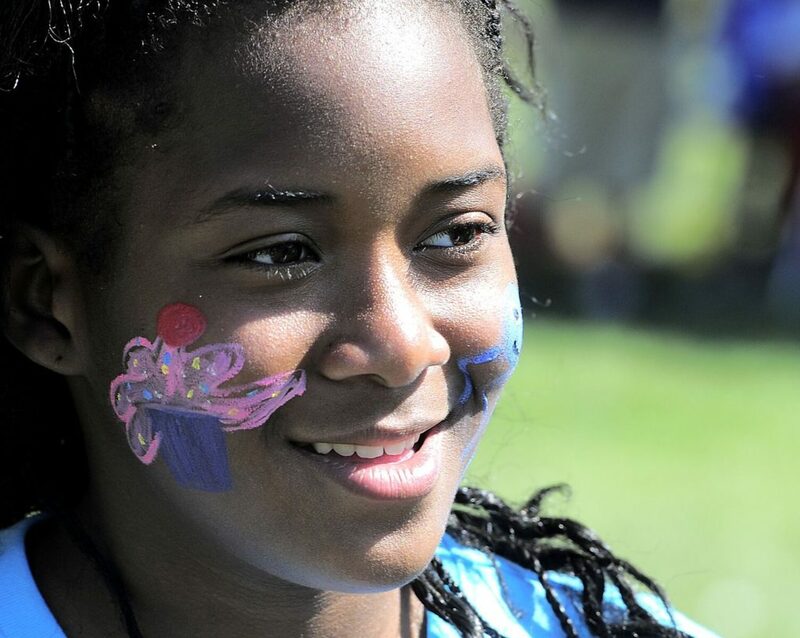 The protective factors encompass five priorities for families: social & emotional competence of children, concrete supports in times of need, social connections, parental resilience and knowledge of parenting & child development. 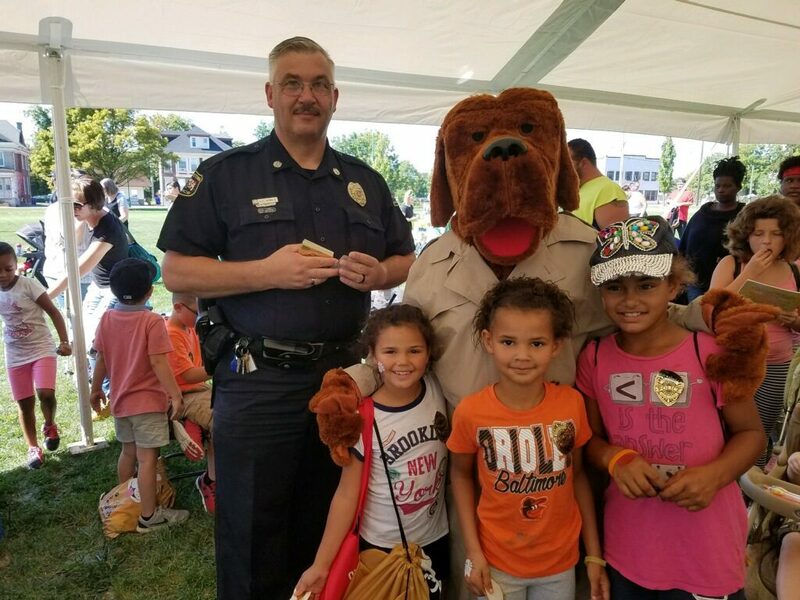 Bester Community of Hope and activities like Family Day are made possible by the generosity of our core partners: the Washington County Department of Social Services, the Alice Virginia & David W. Fletcher Foundation and Casey Family Programs. 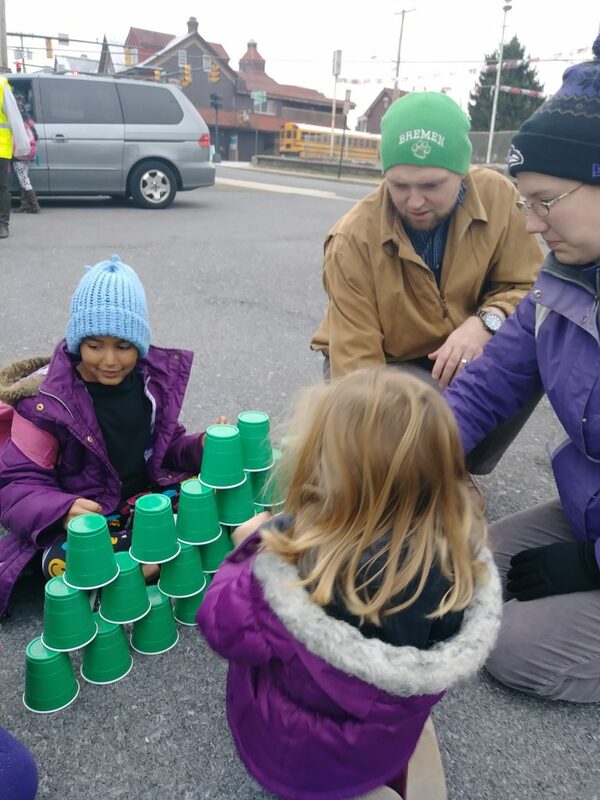 To learn more about how you can get involved in the work to improve well-being for families, school and neighborhoods in the South End of Hagerstown, Maryland, get in touch at connect@besterhope.org or 240-513-6370. 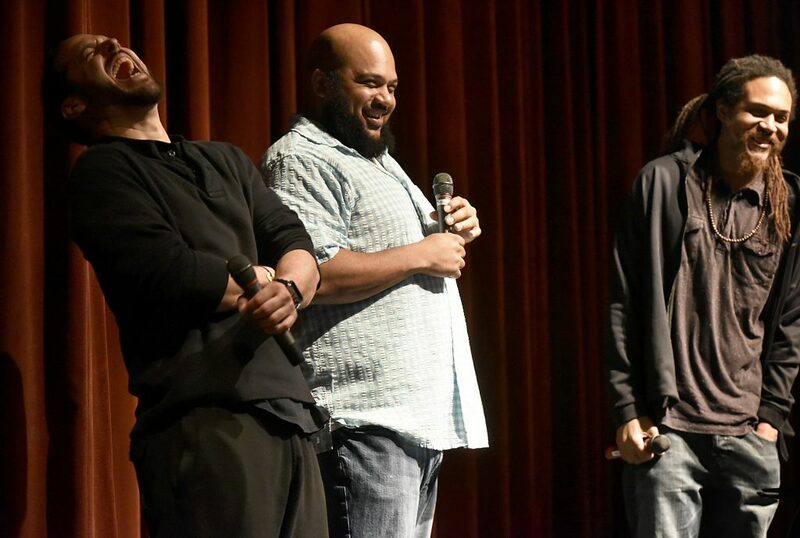 Brothers Ali and Atman Smith along with Andres Gonzalez came together to share their work from the Holistic Life Foundation in Baltimore City, a comprehensive program focused on teaching mindfulness practices to communities as a tool for both self-regulation and helping others. 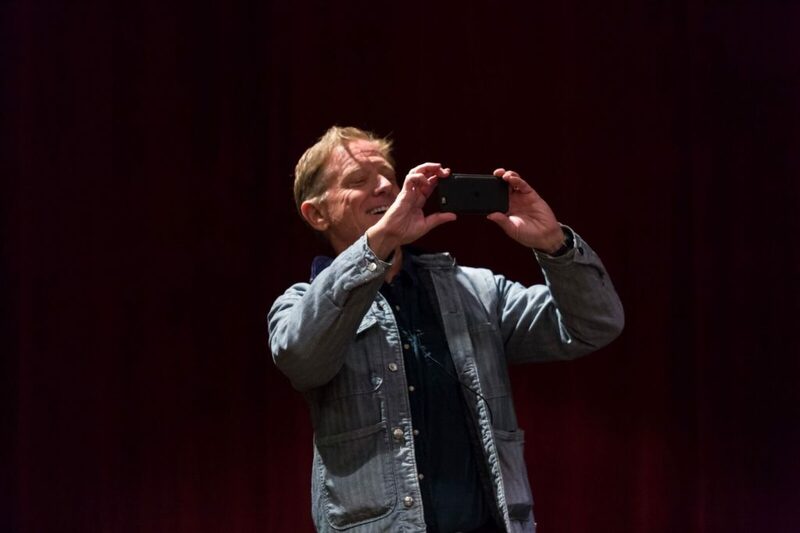 The trio took the time during the presentation to show the work in action, by leading audience members through a variety of breathing and mindfulness practices. On different occasions the audience fell silent as they were lead through different approaches, with the hope that this first hand practice experience would be useful tools for both professionals and those served. Noteworthy contributors also included longtime San Mar psychiatrist Dr. Ira Lourie, a thought leader in developing effective systems of care. 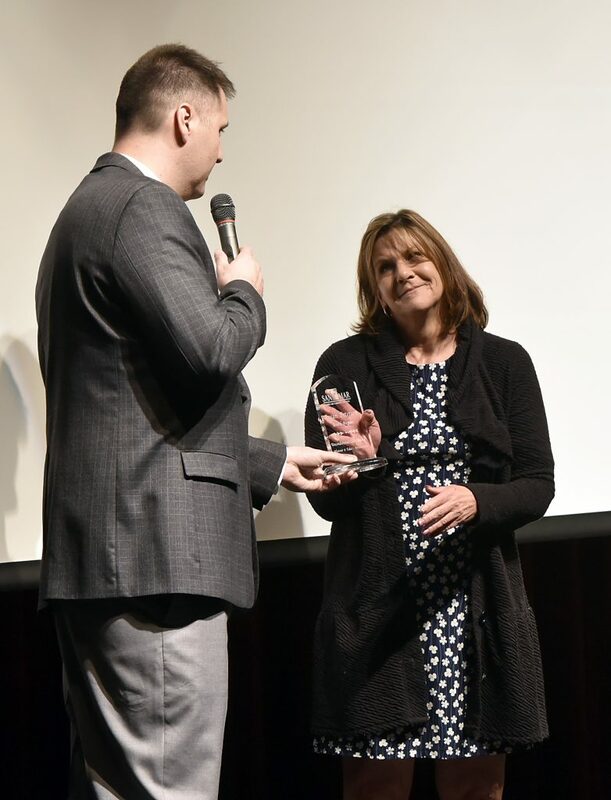 San Mar Family & Community Services CEO Keith Fanjoy also used the occasion to deliver the 2019 Jim Casey Building Communities of Hope award to the Community Free Clinic of Washington County, as well as recognize long-time San Mar board member Susan Peterson for her dedicated service. 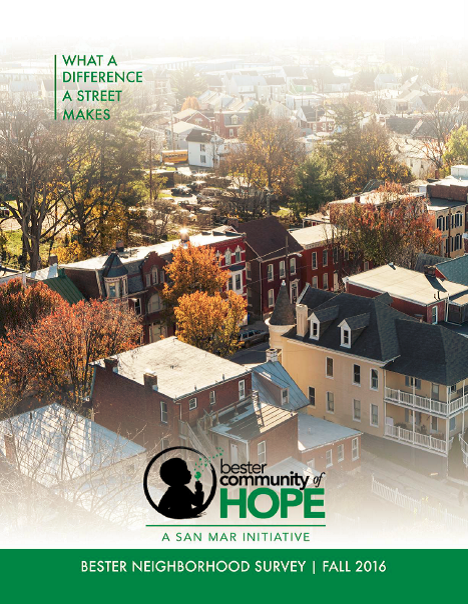 The Bester Community of Hope initiative is made possible due to a significant investment of resources from the Washington County Department of Social Services and the Maryland Department of Human Services, the Alice Virginia and David W. Fletcher Foundation and Casey Family Programs, along with a network of active partners. 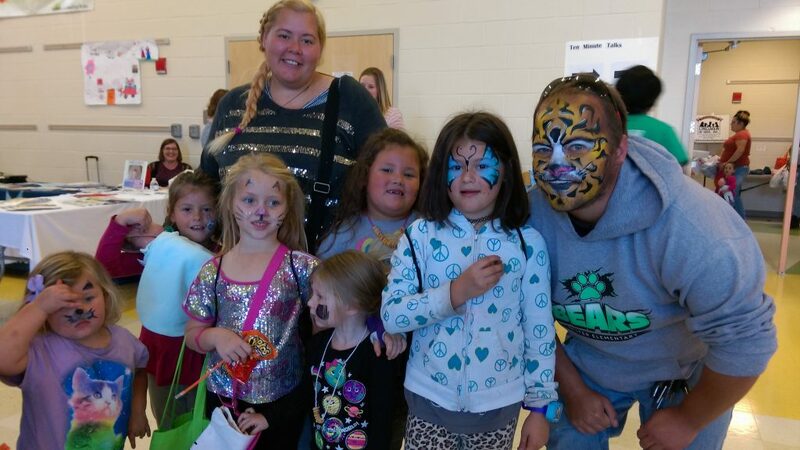 Babypalooza 2018 was the place to be for young families in Washington County on Saturday, with close to 800 individuals entering Bester Elementary School on a cool autumn day, close to four times more attendees than the same event in 2017. 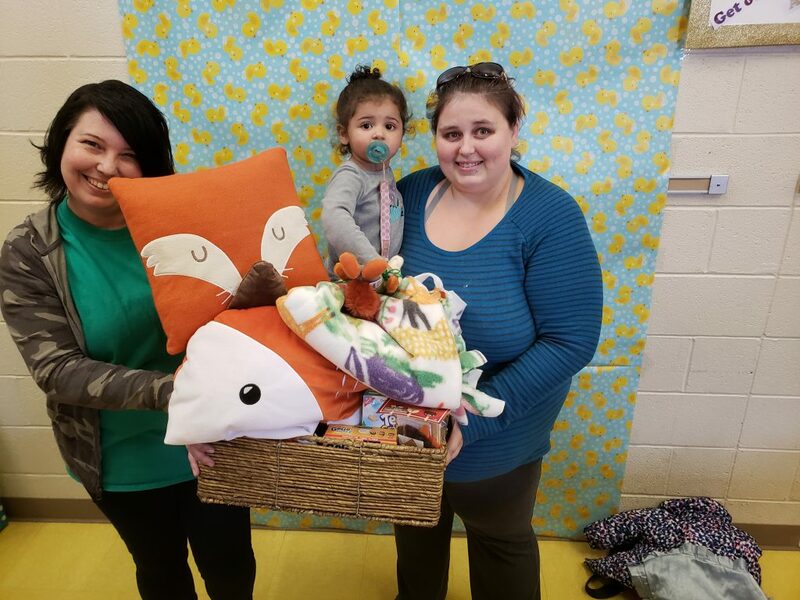 Now in it’s third year, Babypalooza was created as a community baby shower to support expectant parents as well as young families with children from newborn to five, helping to develop community connections and obtain supportive resources. 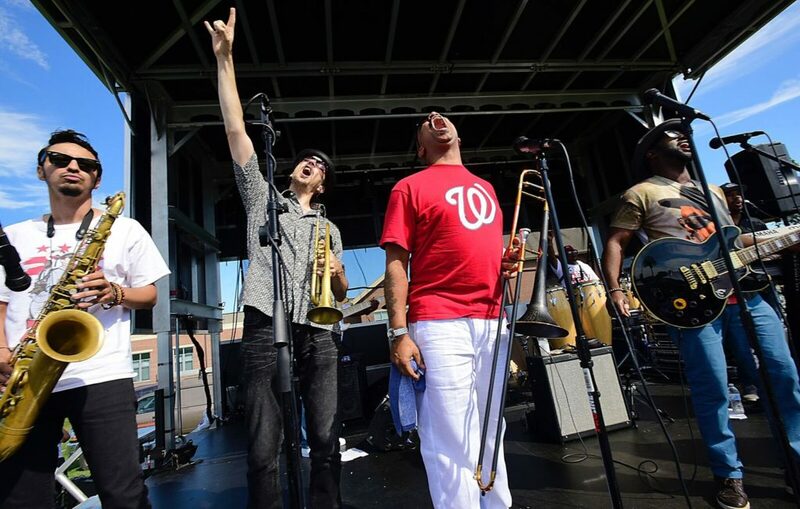 Headlined by musical act The Soul Rebels from New Orleans, and The Chuck Brown Band from Washington D.C. performing at the Peter Buys Band Shell, there was a constant stream of eclectic music for audiences to enjoy “I think of one of the great things about this event was the diversity and the togetherness was truly beautiful,” explained Soul Rebels touring manager Anderson Ireland. 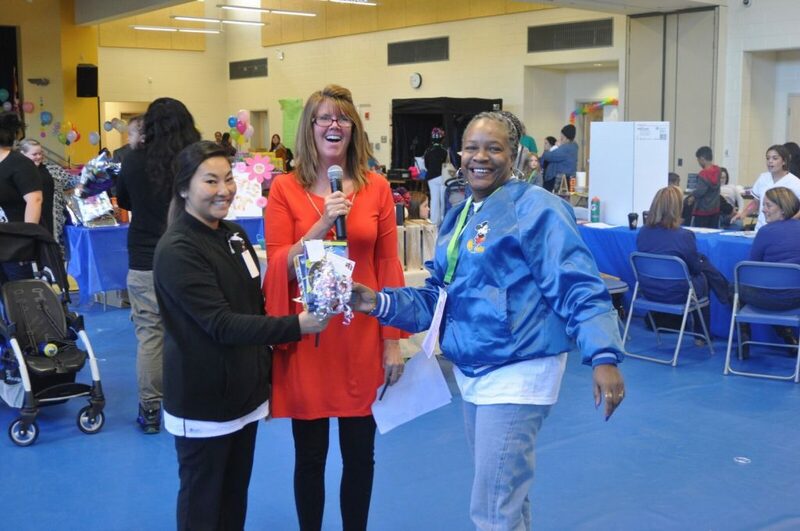 Almost forty community resource vendors were present sharing various information on resources available to the public that ranged from social services, health and neighborhood coalitions of community residents. 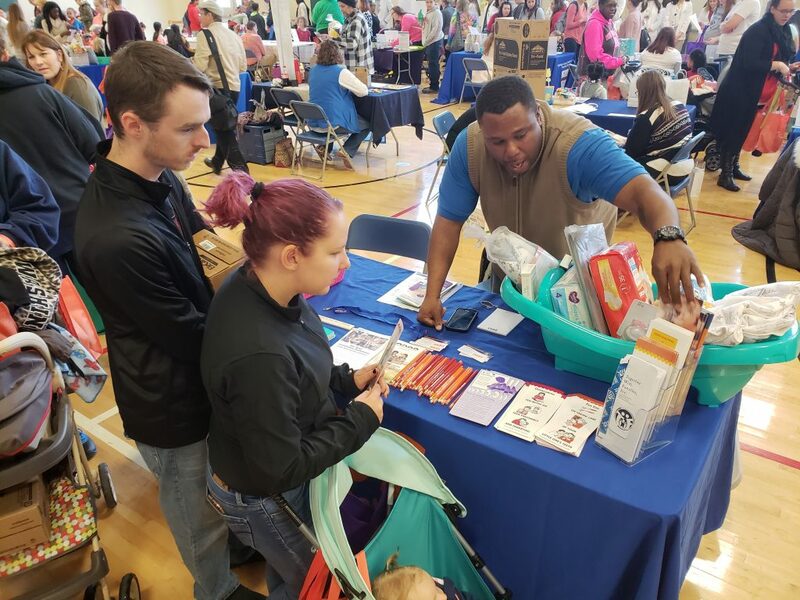 Anthony Bostic is an active resident in his neighborhood through a variety of personal and professional affiliations, and he was onsite providing resident’s information regarding the program Dad’s Connection as a part of the Washington County Department of Social Services Family Center. “This is the best one yet. It’s the right place, the right lay out. 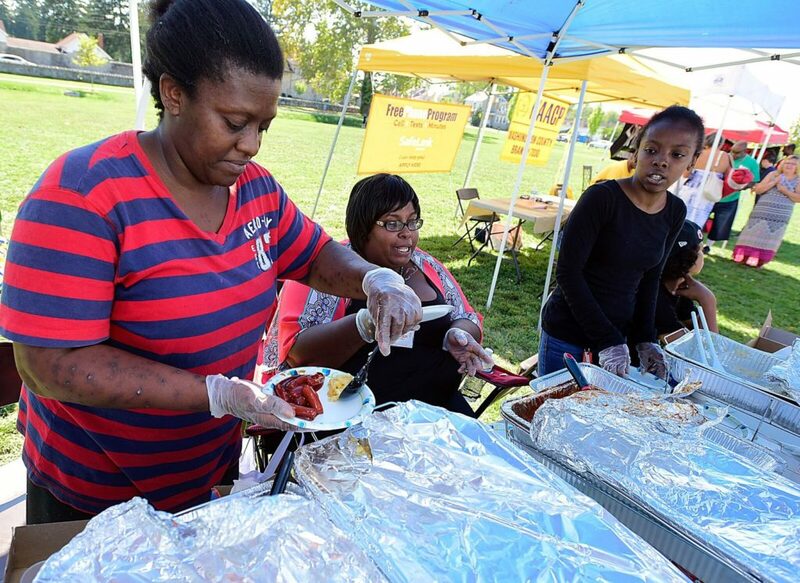 You guys took over City Park!” Community organization “It’s a Blessing to be a Blessing” prepared and served a free meal to close to 1000 people. 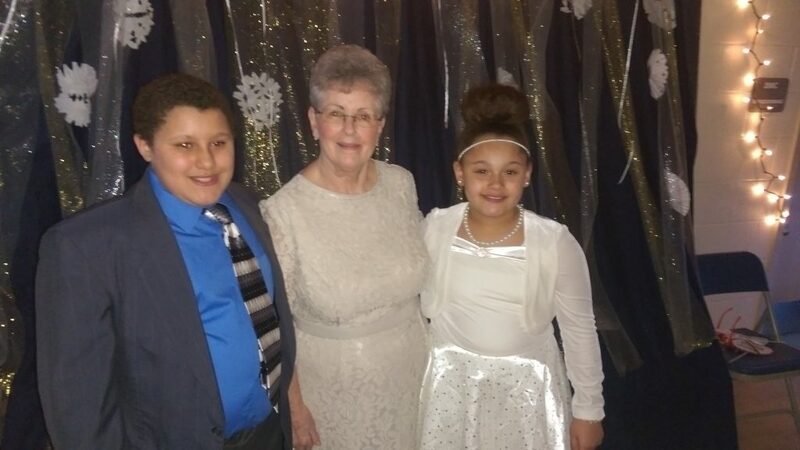 Director Dierdre Norris, Hagerstown’s own version of Bea Gaddy, brought her mission of love and support to the event for the second straight year to the delight of those eating her prepared tasting plates. 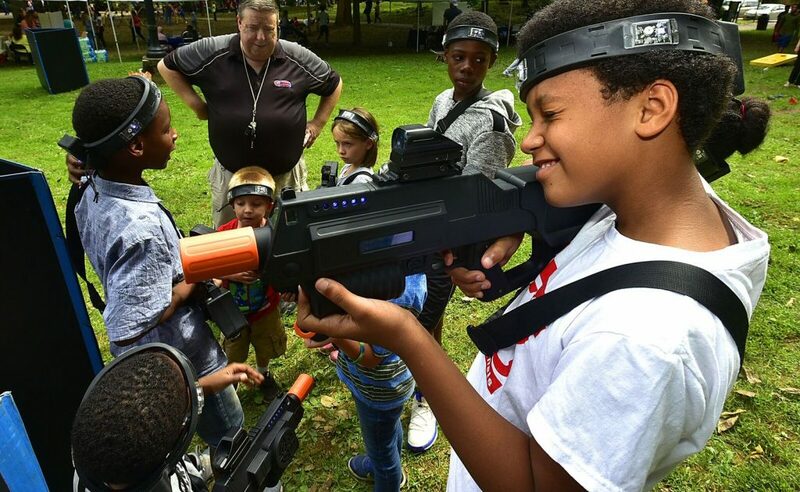 Bester Community of Hope staff and South Hagerstown High School volunteers manned a variety of carnival games including a dunk tank, sledgehammer, speed pitch and a very popular laser tag course. 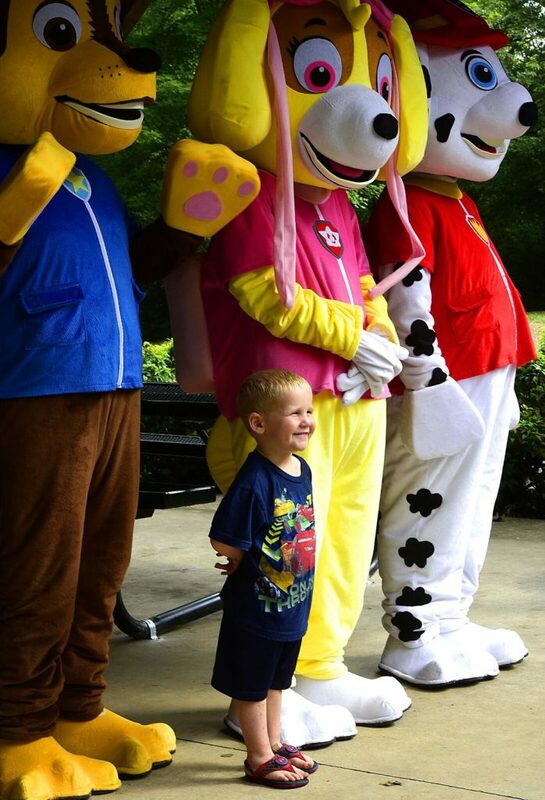 “I liked playing the games,” Jaydin explained, while his mother Amber continued by saying the best part was, “Spending time with my family.” Nearby, members of Old Line Garrison 501st Legion volunteered two Star Wars Stormtroopers, and combined with a meet and greet with members of the Paw Patrol, kids and adults alike were star struck! 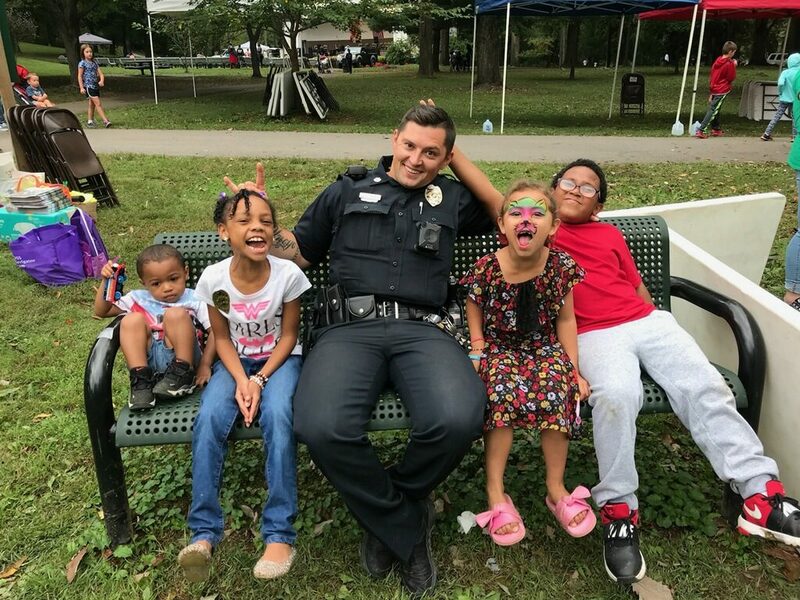 Hagerstown Police Department community resource officer Mark Morris explained, “This is a nice event because there was a lot of opportunity for people to come out and see what is available to them. 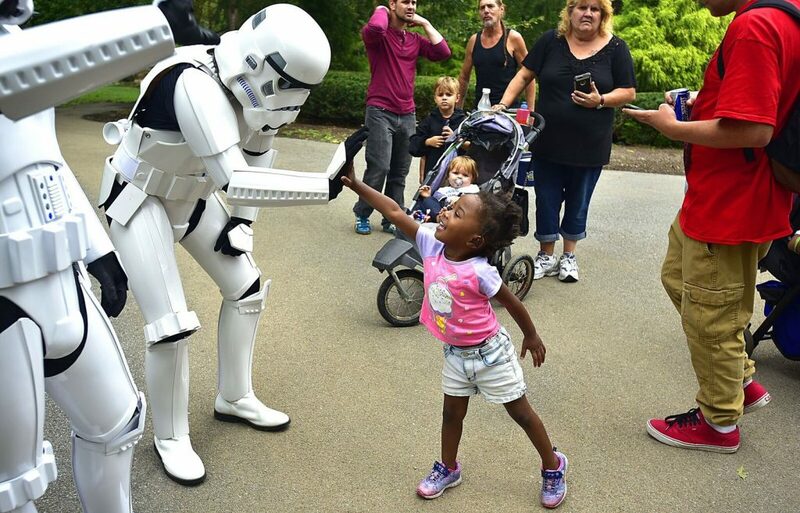 And I got to take pictures with Storm Troopers! 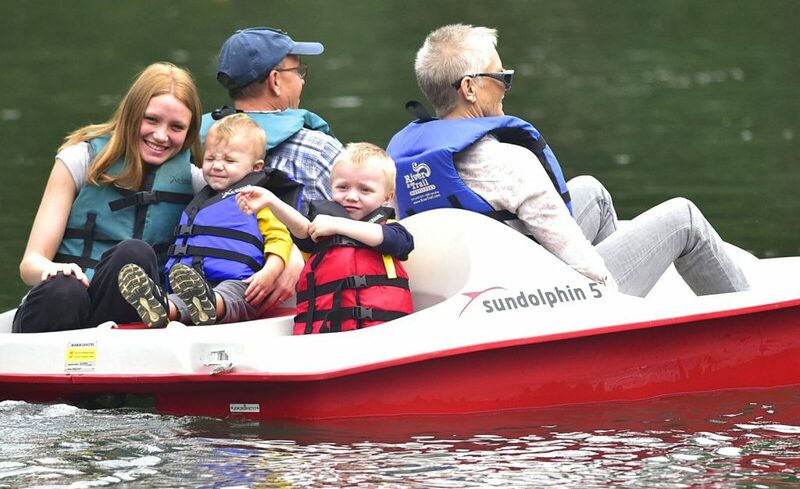 Doesn’t get much better than that!” The event covered a large area of City Park, including allowing free access to the City Park Train museum with barrel rides, as well as free paddleboat rides on the City Park Lake facilitated by River & Trail Outfitters. Join us as we Celebrate Neighborhood Life! 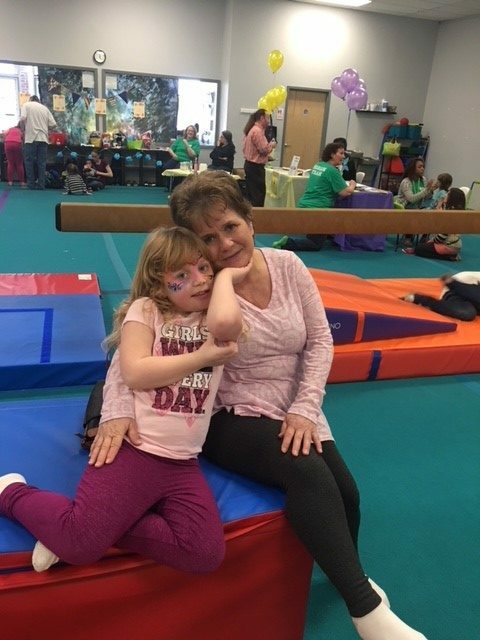 On Friday Bester Community of Hope hosted the 2nd Annual “Family Day”, a celebration of all the characteristics of strong and resilient families. 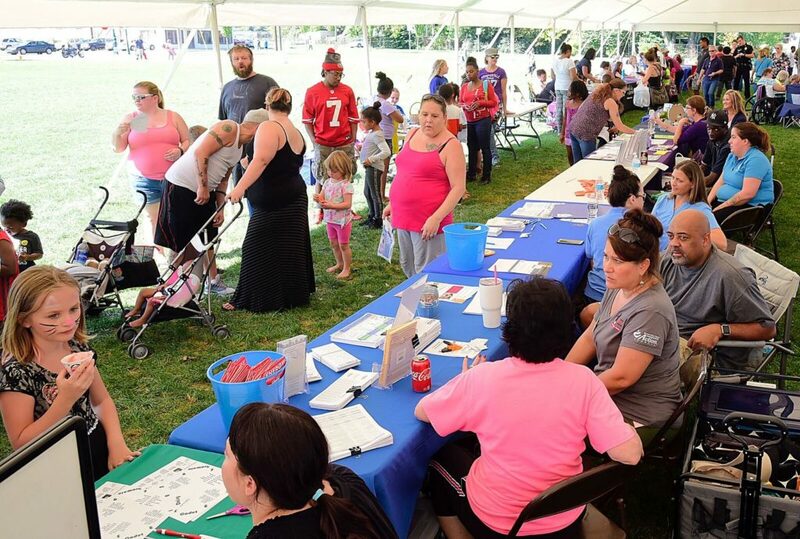 Exactly one hundred friends from the neighborhood who preregistered participated in the event from 1-6 p.m., which took place at the Pediatric Movement Center. 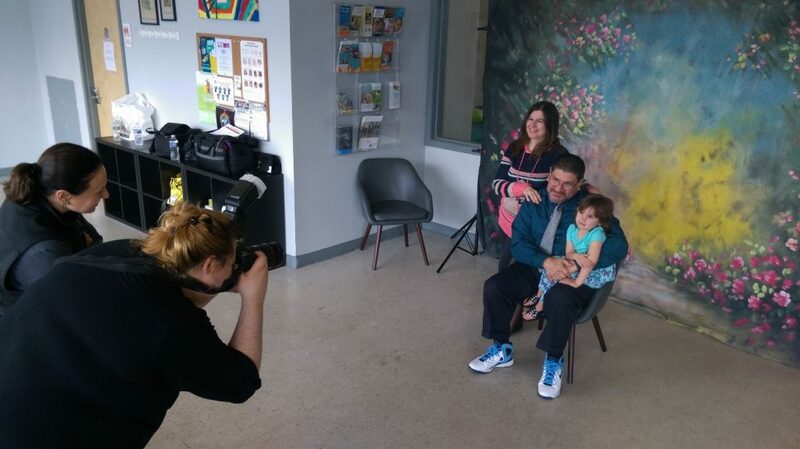 The main attraction of the day was free professional family photographs donated by our trusted partner Crystal Lenz Photography. 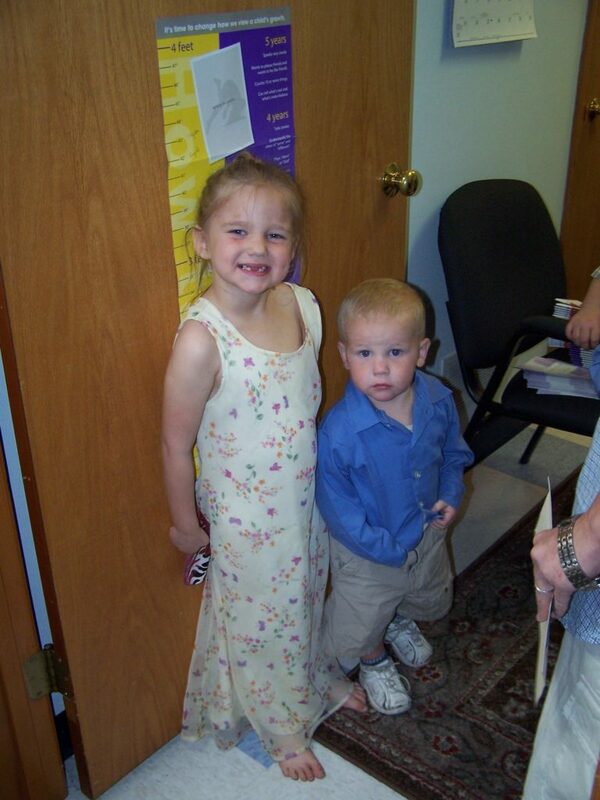 Families came dressed for the Easter season and together captured memories of a special moment in time. Photographer Lanie Kinze explained “I feel genuinely driven to do something for the community. 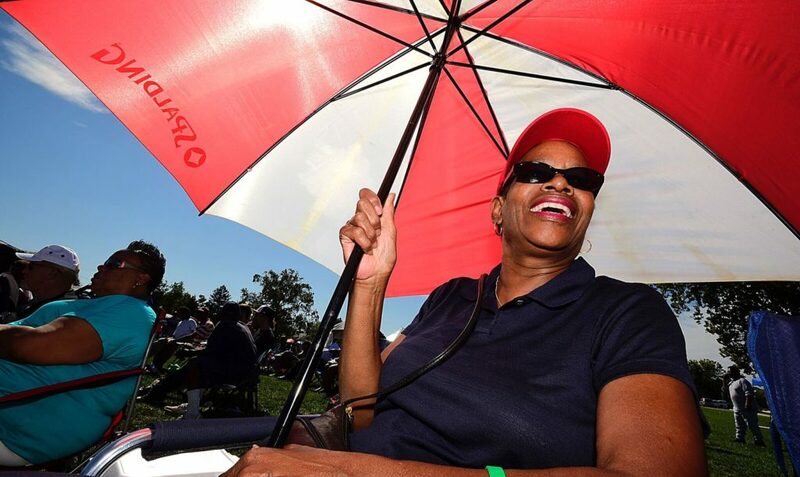 I am able, so I do.” Over the years Crystal Lenz has been a tremendous supporter of various San Mar programs. Photographer Sara Smoot explained, “We do it because of how happy people look and the fact that it captures a moment they can look back on of a happy day. 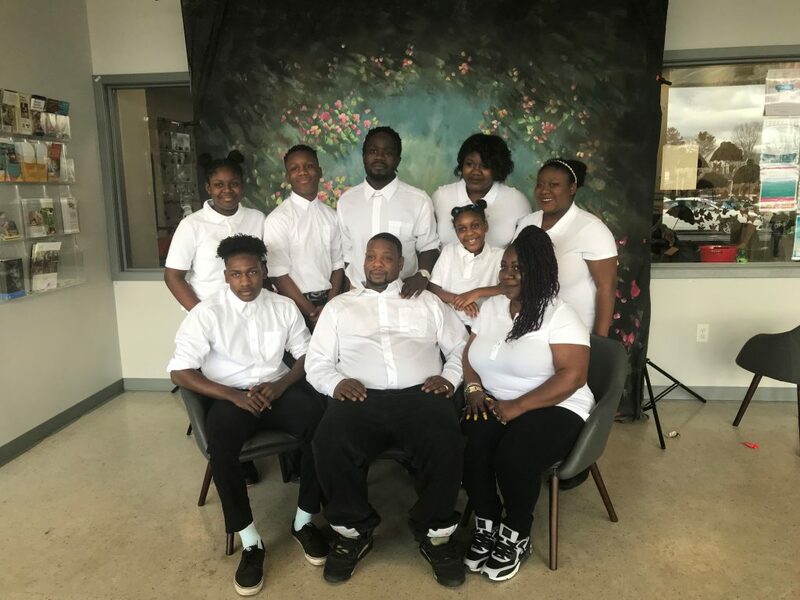 It blesses me to bless them.” The photographs taken of all participants on Easter weekend will be ready for delivery to families by Mother’s Day weekend. 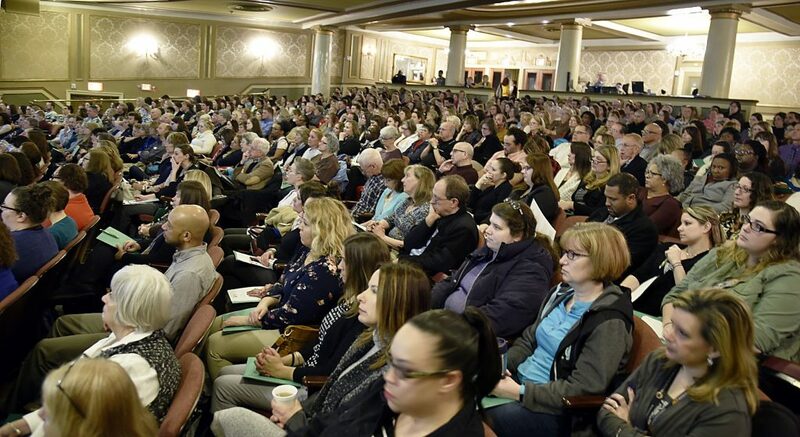 The focus of the event was to educate families around the protective factors framework, which identifies the five key areas that help to make families strong and positioned for success: Social Connections, Parental Resilience, Knowledge of Parenting & Child Development, Concrete Support in Times of Need and Social & Emotional Competence of Children. 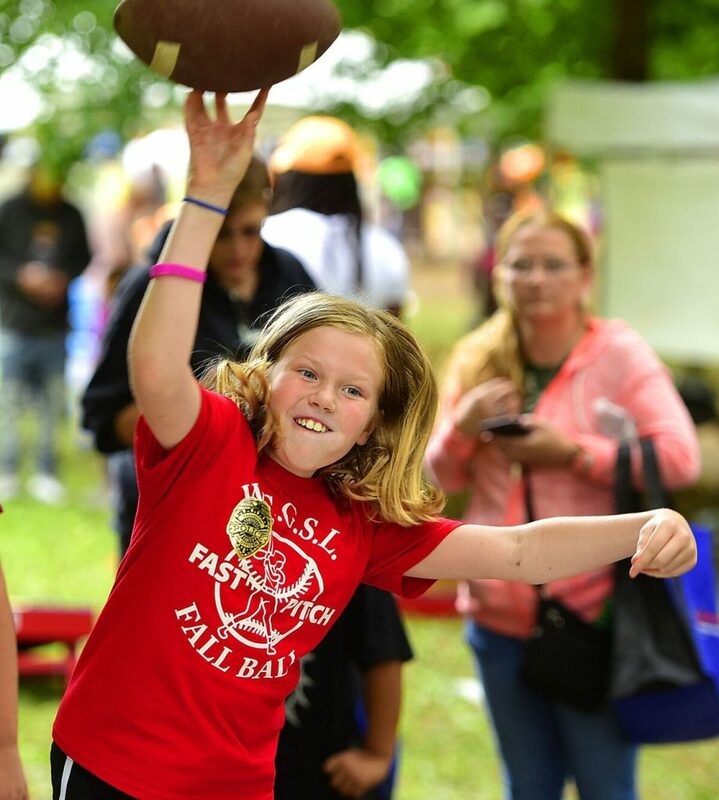 “It was an amazing community outreach event, and there a lot smiling faces,” said Danielle Maught of the Pediatric Movement Center. 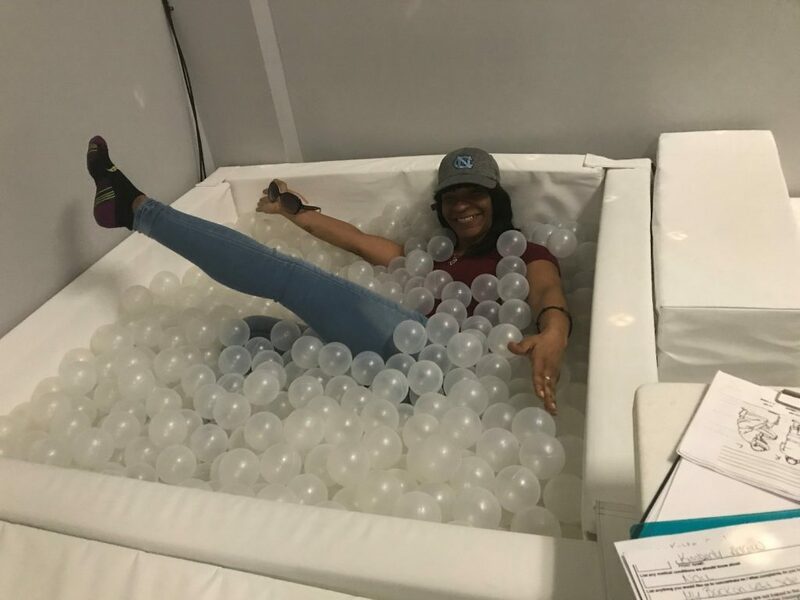 The space allowed children to be stimulated by endless play opportunities while parents could take advantage of their own opportunities in the adjoining rooms. Have no doubt, children slept well after their time playing, because the kinetic energy in the building was tangible. To address concrete supports in times of need, various community partners brought interesting activities: The Jack E. Barr Center for Well Being brought face painting and mental health resources, Soul Haven helped families learn to make homemade baby wipes, It’s a Blessing to be a Blessing used grocery store ads and recipe books to teach about healthy eating on a budget, and BCOH offered a take home basket of supplies to strengthen families. 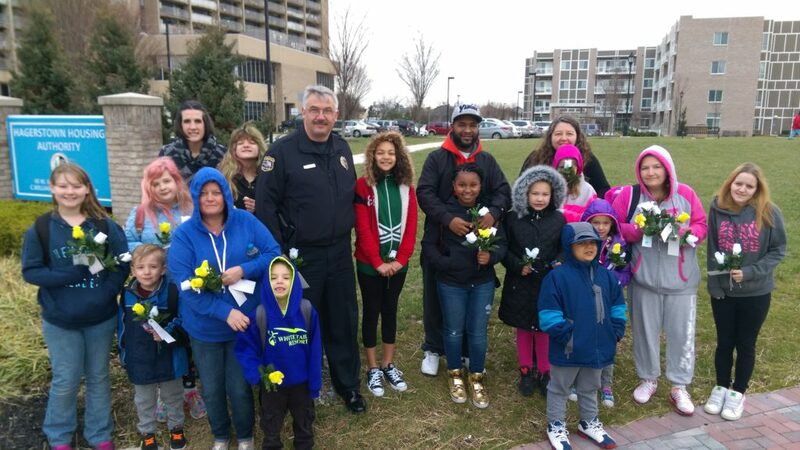 Other community partners who helped make today a reality included Heads UP, Walgreens, Community Depot, and our dedicated friend Desi and her family from Box of Balloons. 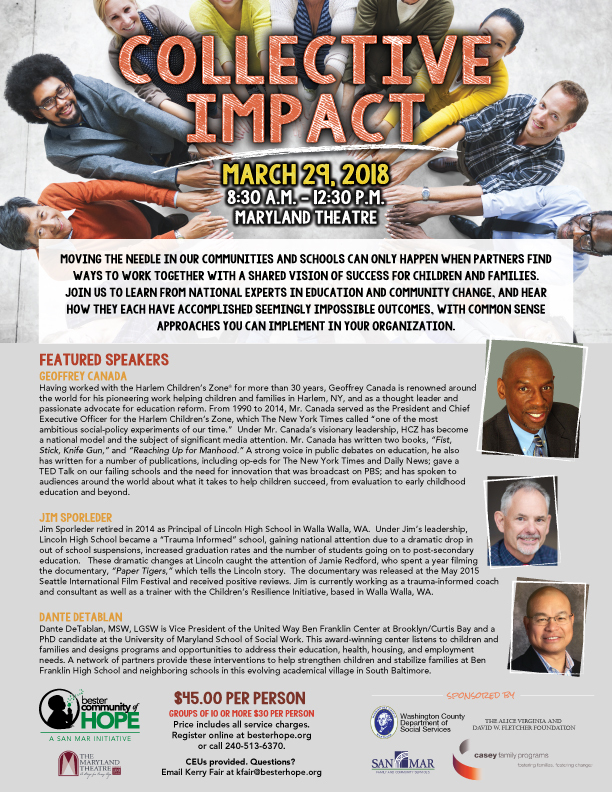 A broad coalition of 650 community stakeholders came together today to learn from national speakers at “Collective Impact” at the Maryland Theatre. 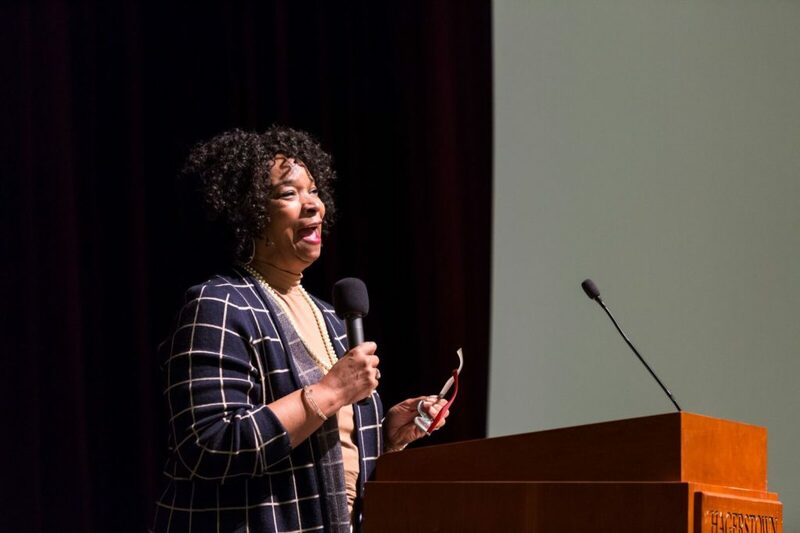 Hosted by Bester Community of Hope, a San Mar Initiative, this event was the fifth installment in a series of trainings focused on beliefs and strategies for social progress within families, schools and neighborhoods. 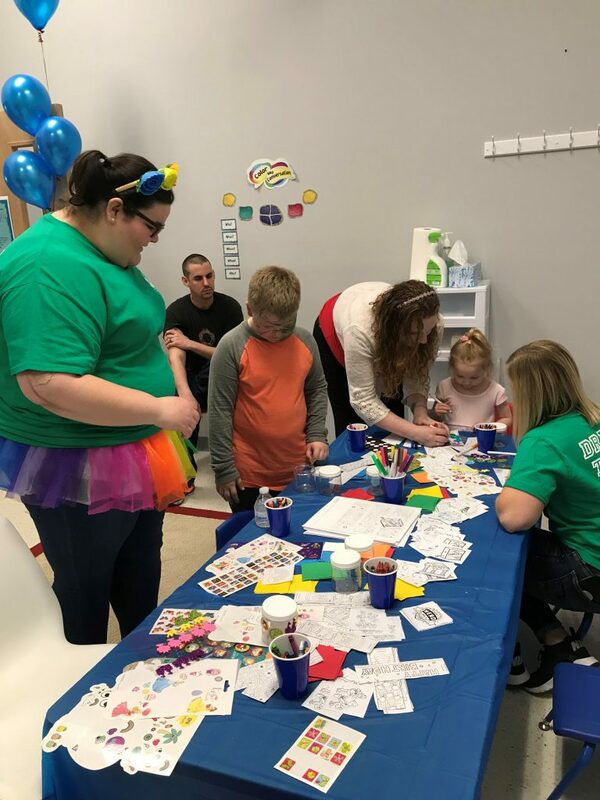 Targeted grant funding from the Community Foundation of Washington County, Washington County Department of Social Services and Casey Family Programs made this event a reality. 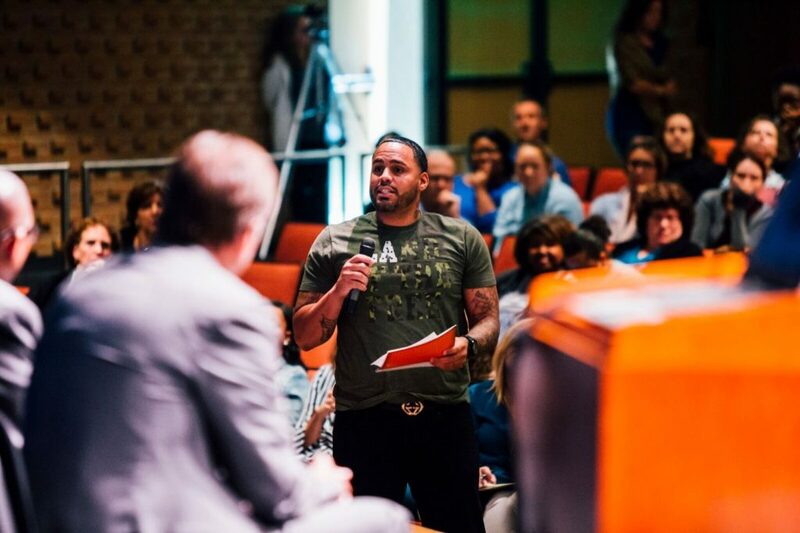 Dante DeTablan, Vice President of the United Way of Central Maryland at the Ben Franklin Center for Community Schools, shared his personal parenting journey prior to becoming a Community School Coordinator in Baltimore City. He then explained how this process not only gave him empathy for populations being served but instilled in him a bold vision for where the community could go. He found that there was great pessimism and trauma in the area, with one longtime leader saying, “Dante, don’t raise my expectations.” But since that time milestones have included the mobilization of 80 community partners to support the school and neighborhood, “and our job is to be air traffic controllers.” Today, Ben Franklin High School continues to make significant progress by focusing on relationships. 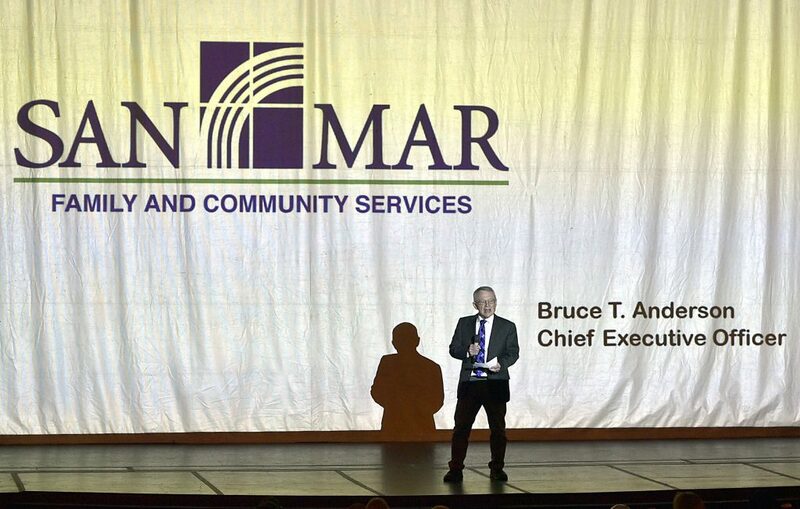 Retiring Chief Executive Officer Bruce T. Anderson of San Mar Family & Community Services opened the day by sharing lessons from his 33 years as the leader of the social services organization. “I have often said that I can’t change a person, but I can create an environment where they want to change. I was wrong. The research says that for the kids we serve it takes just one caring adult to change their brain structure.” Anderson also introduced BCOH Director Keith Fanjoy who will begin the role of San Mar CEO on April 2nd. 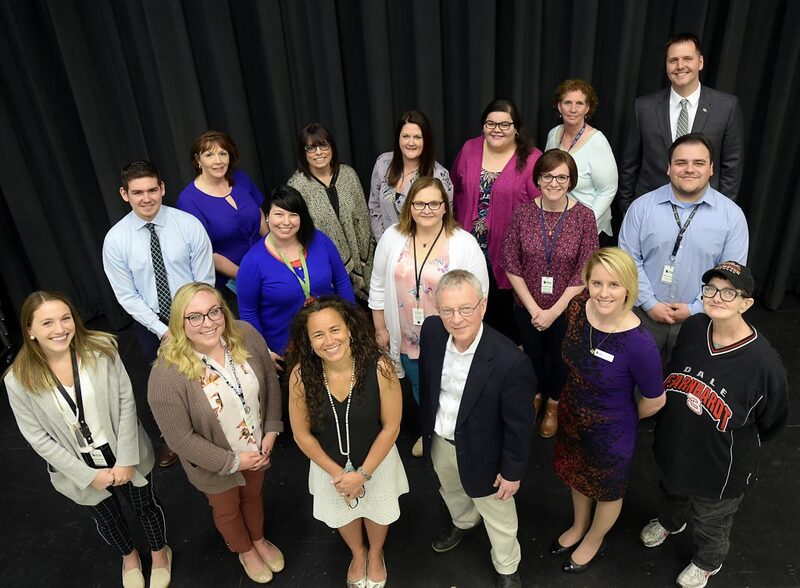 Other special guests included: Steven McAdams of the Governor’s Office on Community Initiatives; Washington County Teacher of the Year Carolyn Holcomb and Tim Morrow, Principal of Antietam Academy and Strong Schools Maryland. 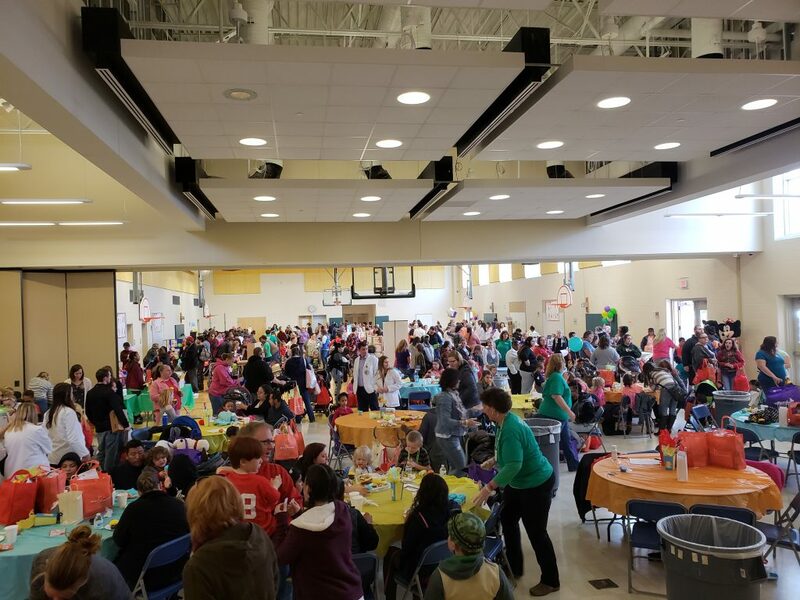 Special memories that will last a lifetime were created tonight as close to 400 students and parents attended the “Healthy New Year” celebration at Bester Elementary. The Bester Wellness Committee comprised of school teachers and Bester Community of Hope partnered to create a unique dance event celebrating strong families and healthy resolutions. 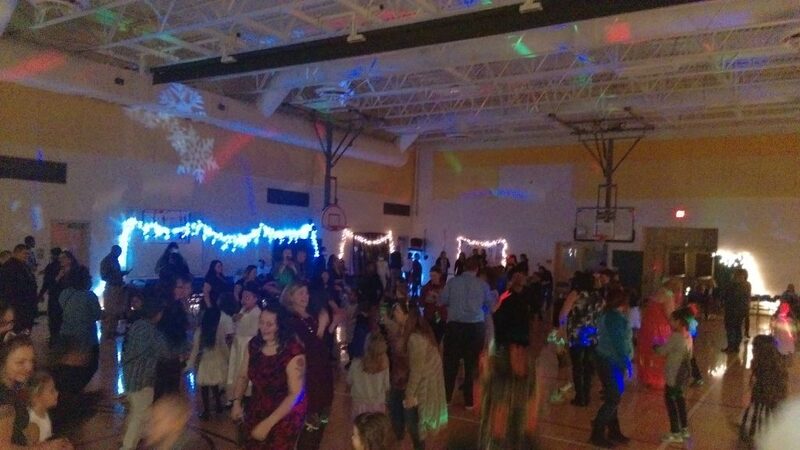 Teachers worked together and the gymnasium and cafeteria was transformed into a winter wonderland with lights and music, and children and their parents wore the best attire for a special night out. 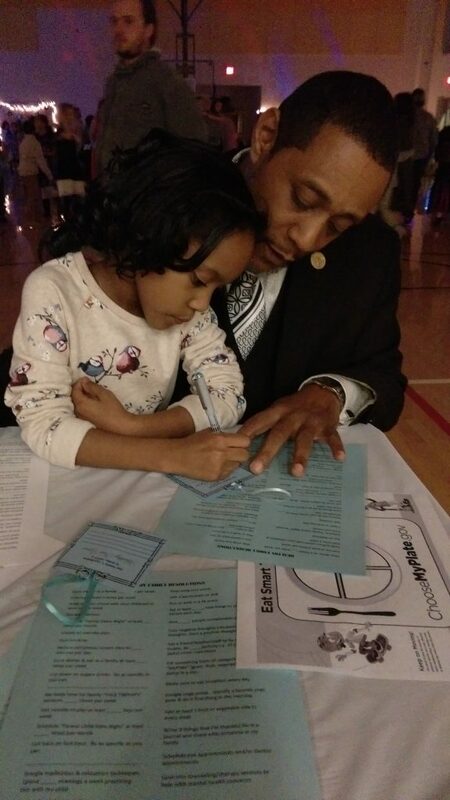 There was also a table where students filled out healthy resolution cards to hang on a tree at school, which allowed for conversations with their family about their goals for 2018. Jamal wrote, “Turn negative thoughts into positive thoughts” while another young person wrote,” Eat less junk and work out!” Ornella and her mom committed to “Schedule a date night at least once a month” and Kylee echoed those thoughts saying we need to, “Eat as a family three times a week.” A selfie station nearby allowed families to take pictures together with decorative backgrounds and capture the moment together while celebrating their time together. 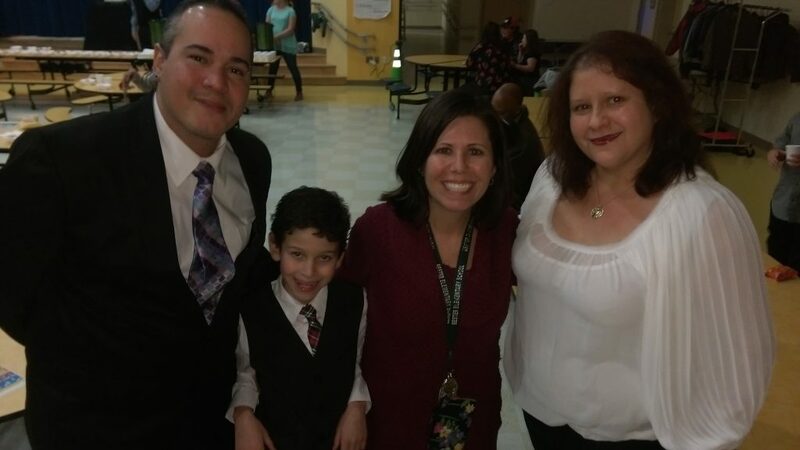 Guidance counselor Linda Silver commented, “I appreciated and loved seeing so many parents as they helped to celebrate their children. 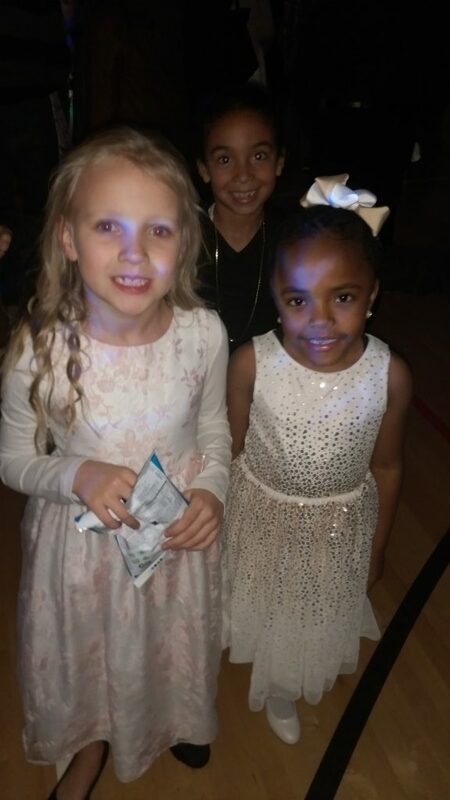 Both the students and parents alike were so dressed up and enjoyed themselves a great deal!” The dance floor was packed the entire evening, as kids, teachers and parents danced together, a stark change to their typical daytime interactions, even forming an extended conga line. Bester Assistant Principal Donald Ansel beamed at the end of the night sharing, “I’m very proud of our school, students and staff. 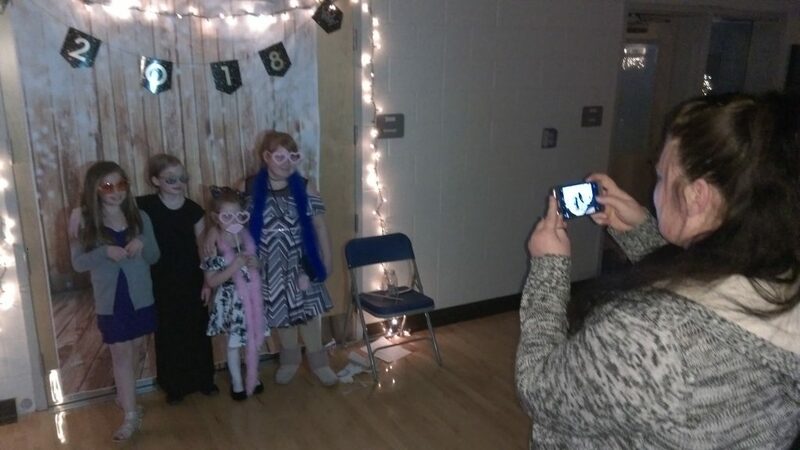 This is what this community and school is all about.” At the end of the evening, all attendees gathered in the center of the dance floor and counted down to a symbolic new year one more time, and committed to new beginnings and promises for a brighter tomorrow with their family by their side. 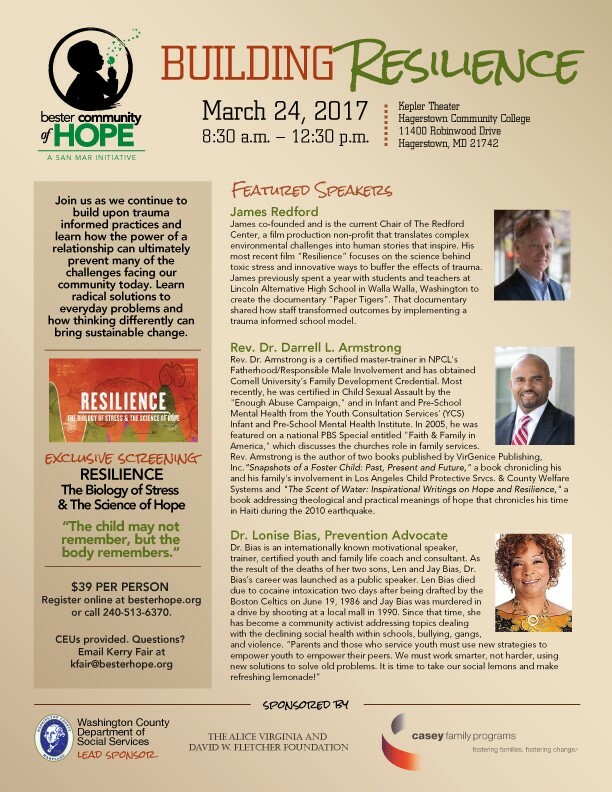 Register today for “Collective Impact”! 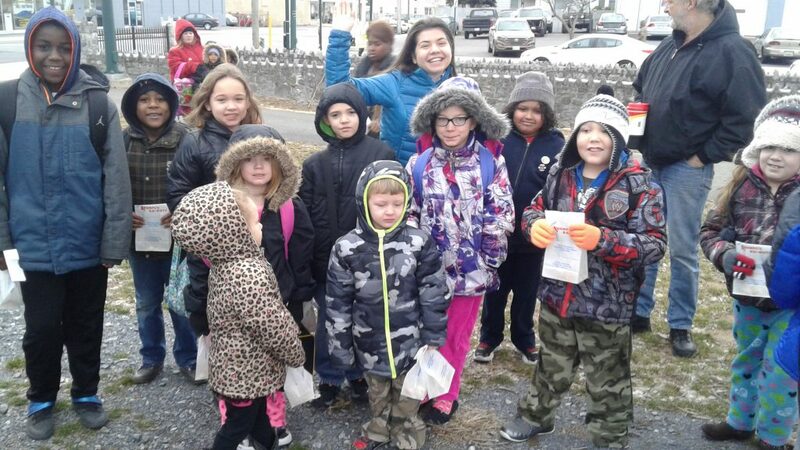 With the arrival of winter, the month of December saw a significant change in temperatures during the Walking School Bus, especially on December 13th when the wind chill hovered around zero degrees. 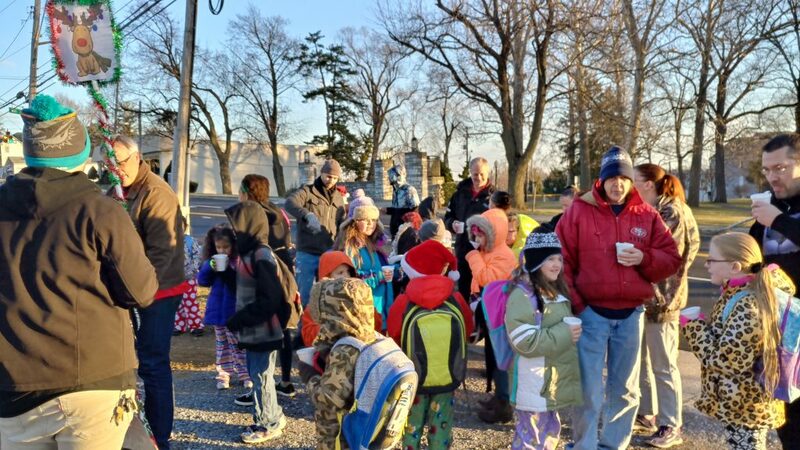 Fortunately, it was the same date that we distributed hand warmers as well as new hats and mittens to all participants, made possible thanks to grant funding and local donations from the Young family and handmade offerings from The Quilt Shop at Traditions at White Swan. 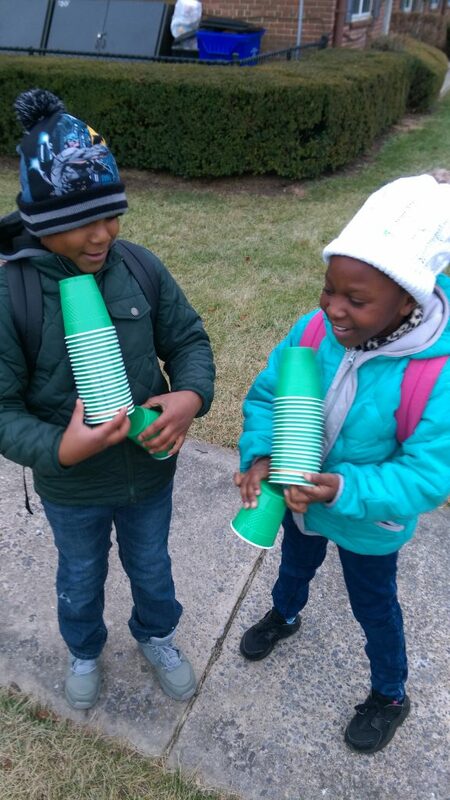 As we arrived at the school entrance several other kids were huddled up and shivering in the cold so kids turned to the neighborhood ambassadors and asked, “Do you have more?” Luckily there was an abundance so all who needed them were able to receive them. Throughout the month of December kids couldn’t contain their excitement for the upcoming holiday and the activities reflected the season with a Christmas tree cup stacking speed challenge and Cookie Face, where you place a Christmas cookie on your forehead and attempt to eat it hands free! 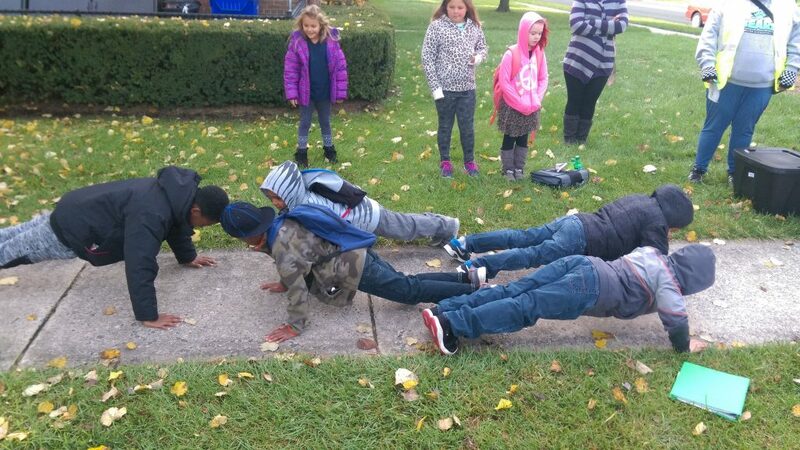 One of the kids at Frederick Manor shouted, “This is hard! 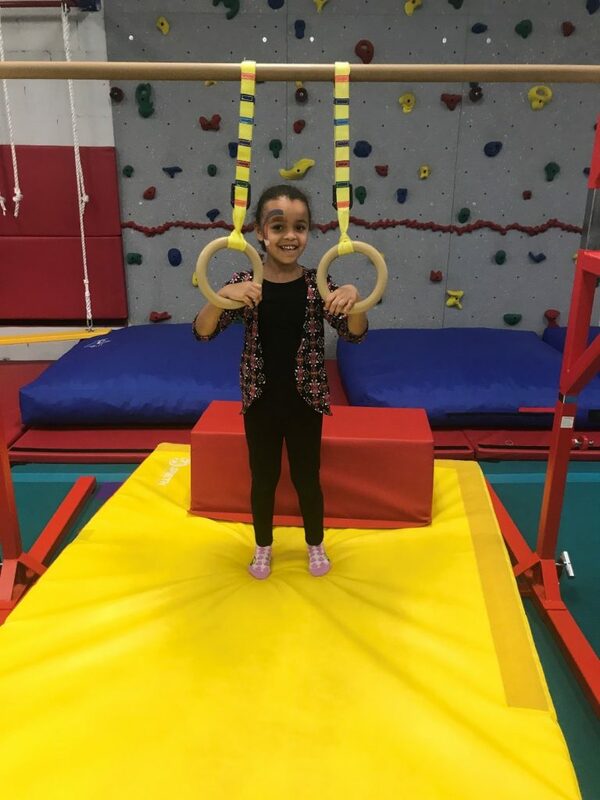 You try it!” This month we had four raffle prize winners of select sporting goods items to encourage healthy play: Kaydence Plummer, Ayden Robey, Josiah Davis and Maleana McDaniel. Way to go! Next month we’re excited to be able to give away two new fitness trackers and have activities themed around the 2018 Winter Olympics in Pyeongchang, the more you walk the more chances to win on the Walking School Bus! 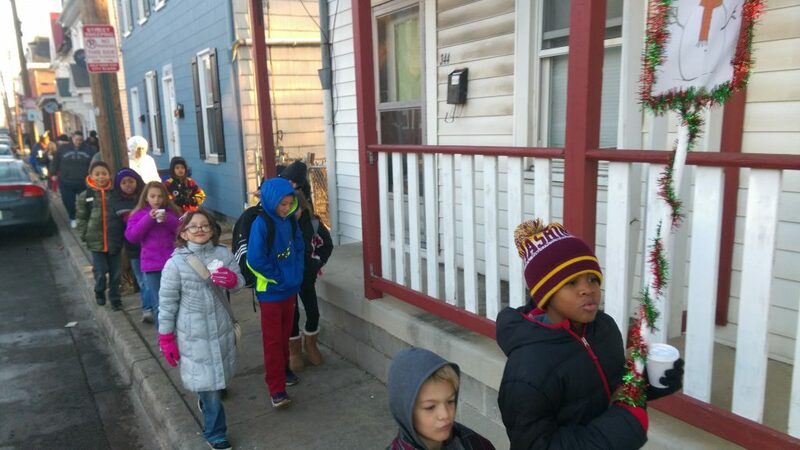 The Walking School Bus is a monthly parent-led effort managed by Bester Community of Hope (BCOH) and sponsored by a generous grant funded by the Washington County Health Department. 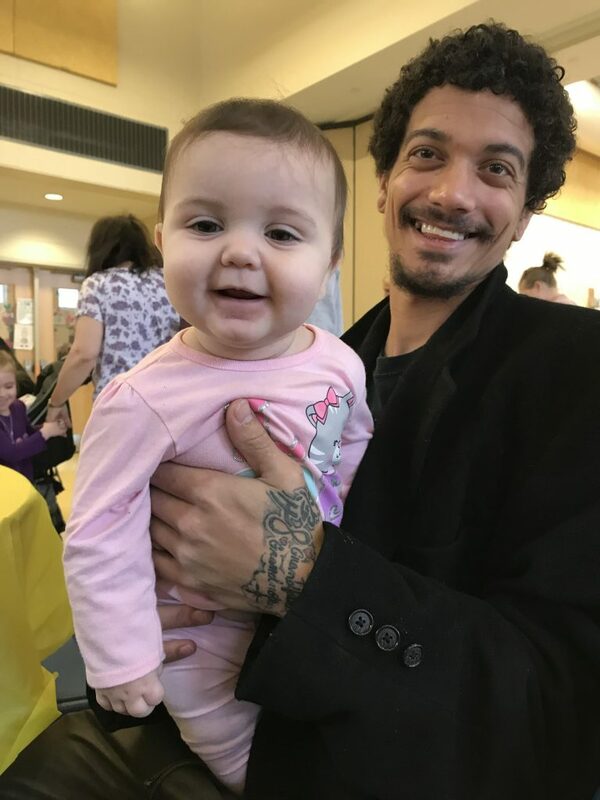 BCOH is an initiative of San Mar Family & Community Services and is possible due to the generosity of many partners, including the Fletcher Foundation, the Washington County Department of Social Services and Casey Family Programs. 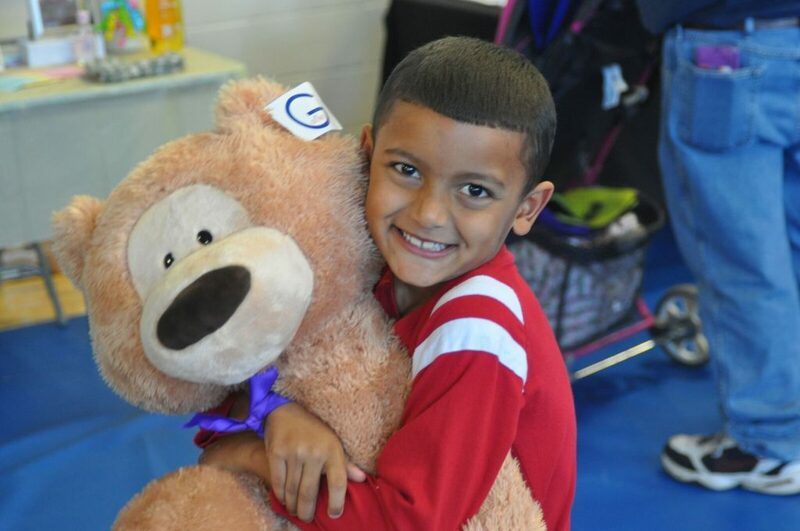 If you have interest in helping, we’d still like to hear from you and find ways we can partner to help kids and families get connected! Email us at connect@besterhope.org or call 240-513-6370! 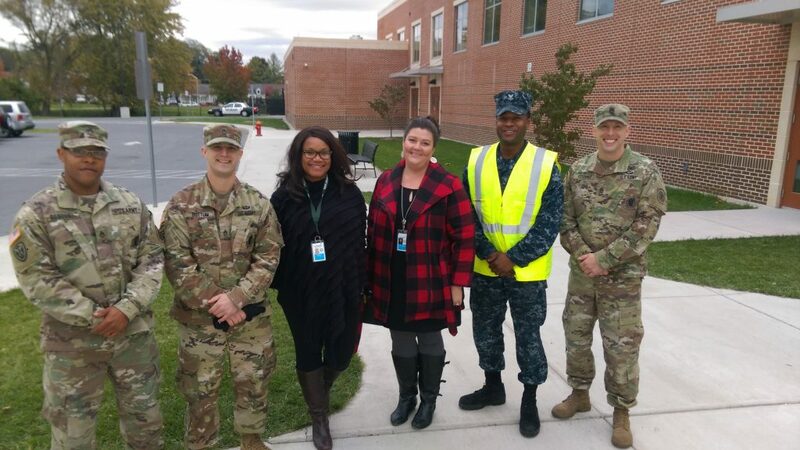 During the month of November, students catching a ride on the Bester Elementary Walking School Bus celebrated the contributions of the local military with members of the Armed Forces Recruiting Center in Hagerstown. 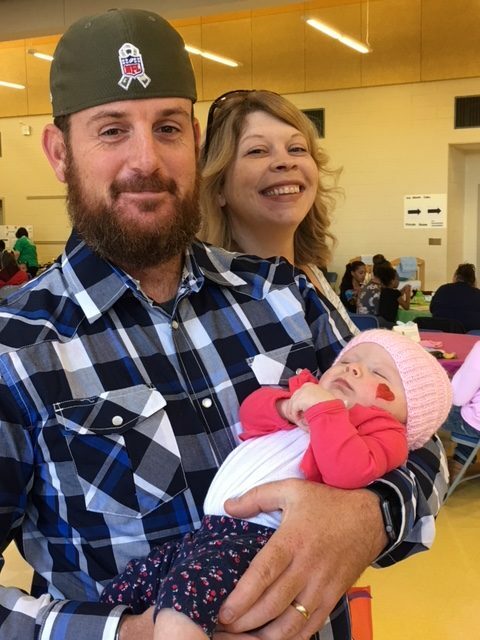 They were able to not only build relationships with local service members but in the weeks that followed there were a variety of themed activities such as decorating American flags and signing special gifts for the service members who had come to the monthly special event. 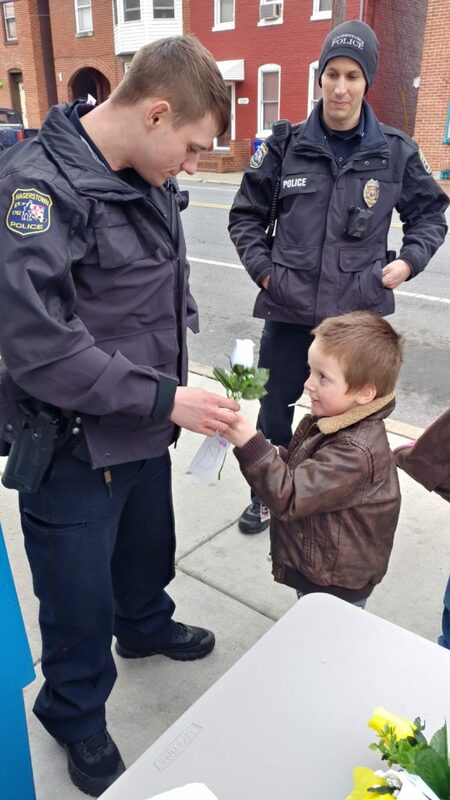 They also decorated stars for a flag, one to give to the military, and another for them to give to a local hero in their school, family or community. The more you walk the more you can win on the Walking School bus, with signature prizes announced each month through a raffle. On average we have between 60-80 participants joining us on the journey each week, compared to about 45-50 only once a month last year. 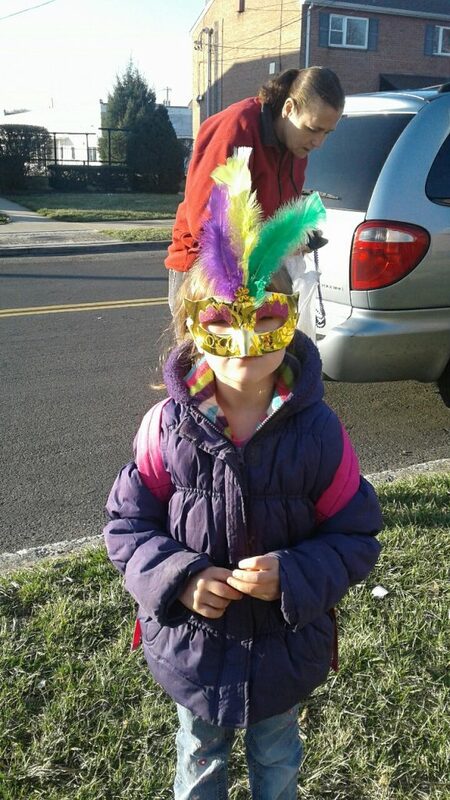 In October, we gave away two brand new pairs of shoes, one to Kamden Falls and the other to Gracie Minnick. Next month will be themed around the holiday season and we will announce four prizes of select sporting goods items to encourage healthy play to raffle winners. 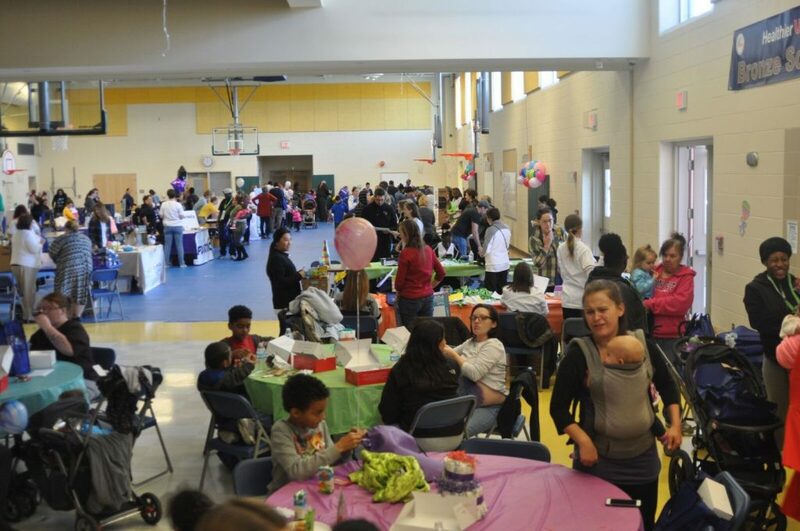 This past Saturday, close to 250 people filled Bester Elementary School to celebrate young families at Babypalooza 2017! 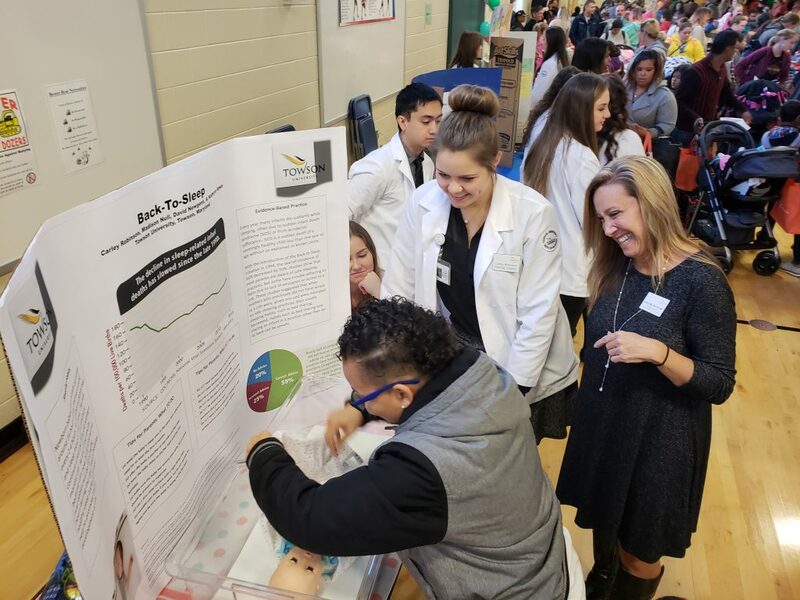 The event was planned by a committee comprised of staff from Bester Community of Hope, Early Childhood Advisory Council, Washington County Safe Kids, and the Towson University nursing program at USMH. 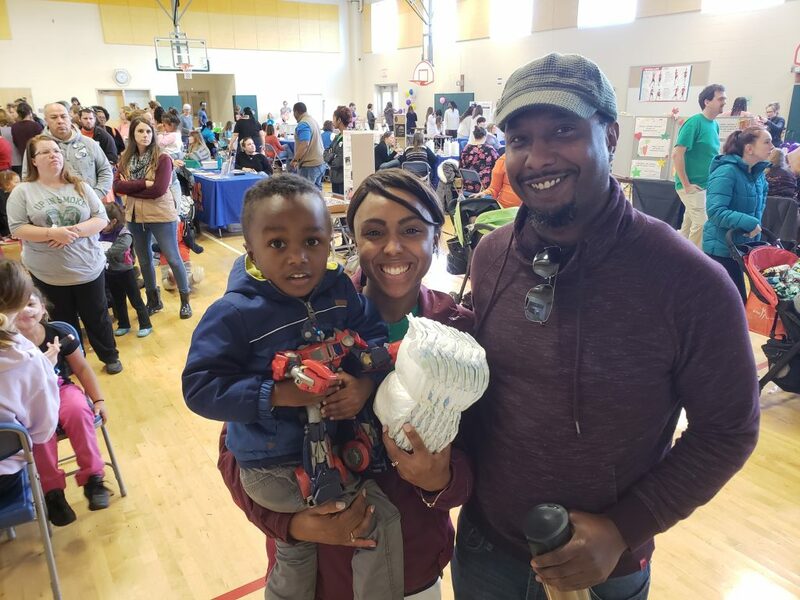 The focus was on supporting and celebrating families while providing information on parenting, child development and family living in the neighborhood. 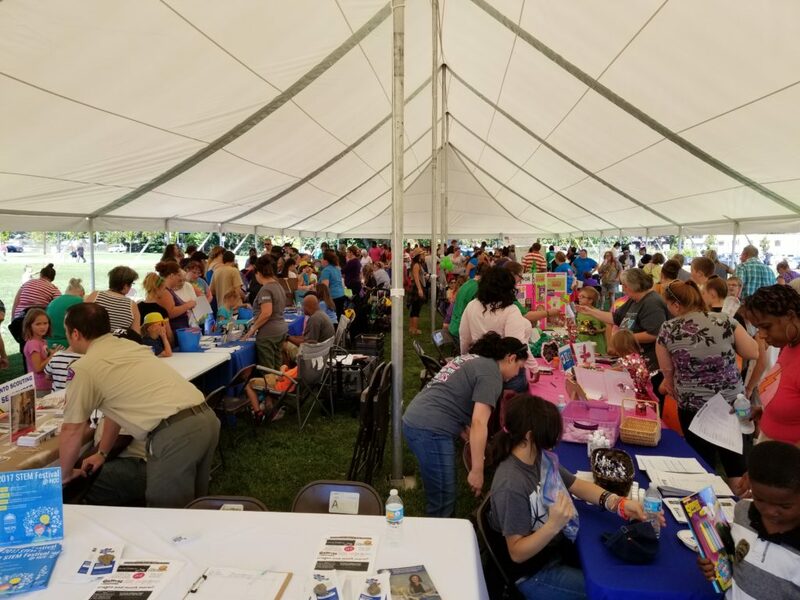 The event was possible due to ongoing financial support from the Washington County Department of Social Services and the Fletcher Foundation. 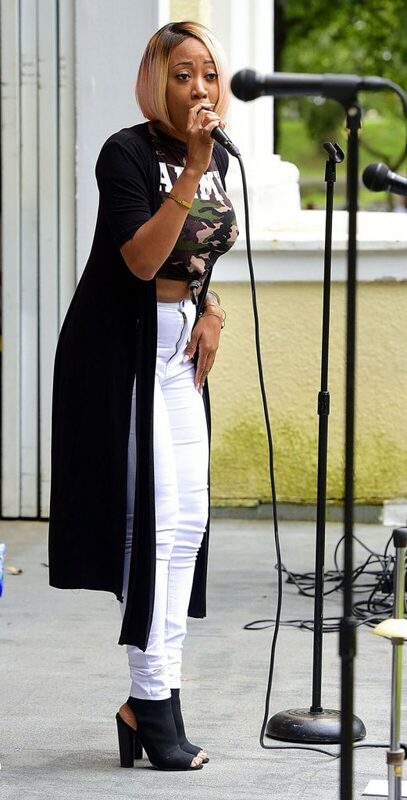 Special guest host for the event was WDVM news anchor Tasmin Mahfuz, who connected with kids and families and helped announce various door prizes for the event. 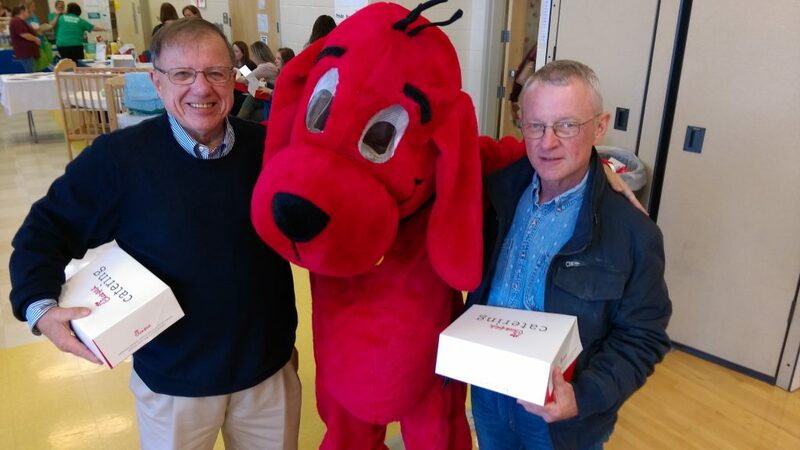 Tasmin shared that she “loved being around so many wonderful families and their cute kids!” Thanks to Scholastic, Clifford the Big Red Dog even made a special appearance during lunch, swooping down to meet and take photos with children who often stood back in stunned amazement. 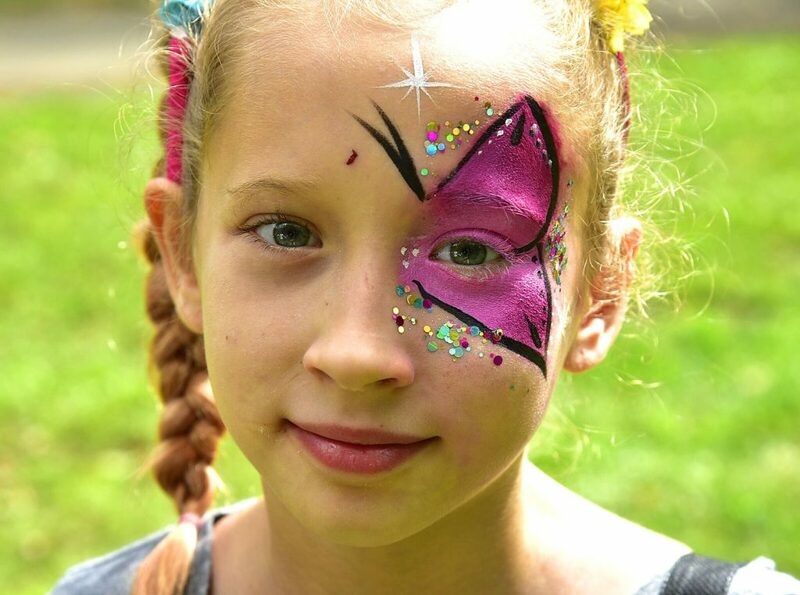 The Hagerstown Artists Group was doing intricate face painting as well as belly painting for expectant mothers. 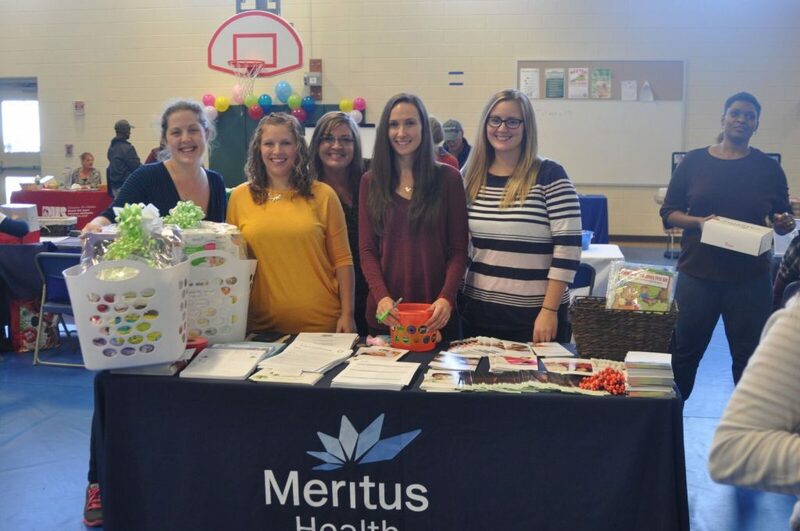 One mother getting her belly painted cried tears of joy when her name was drawn to receive a baby basket provided by Meritus Health. 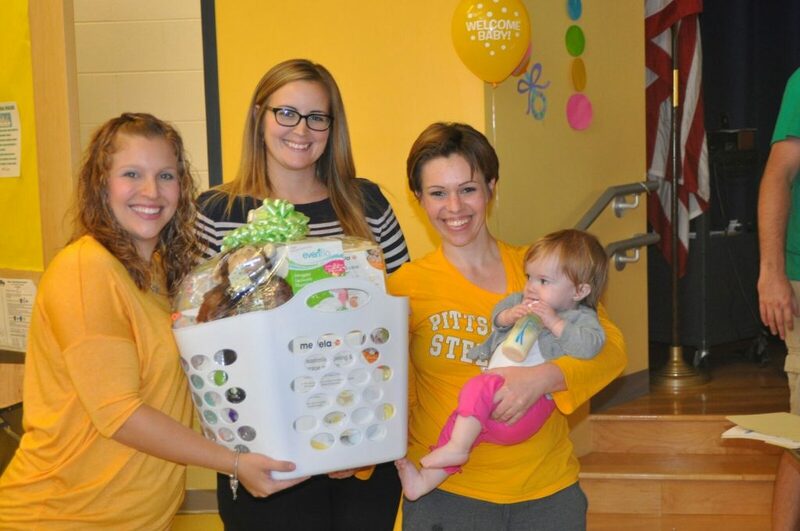 One mother with an elementary age student was at the event celebrating her expectant newborn. 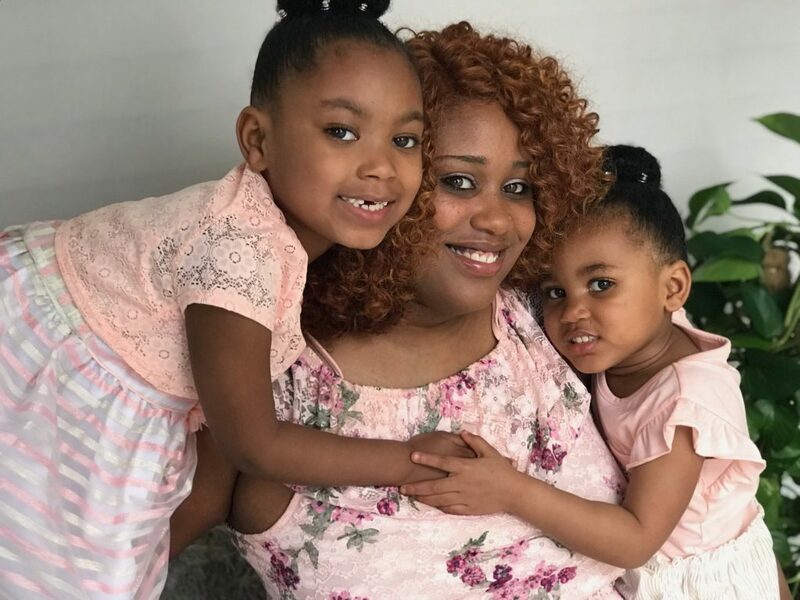 She related that she never expected to be pregnant at this point in her life and was in need of some additional support for her child that was due soon. 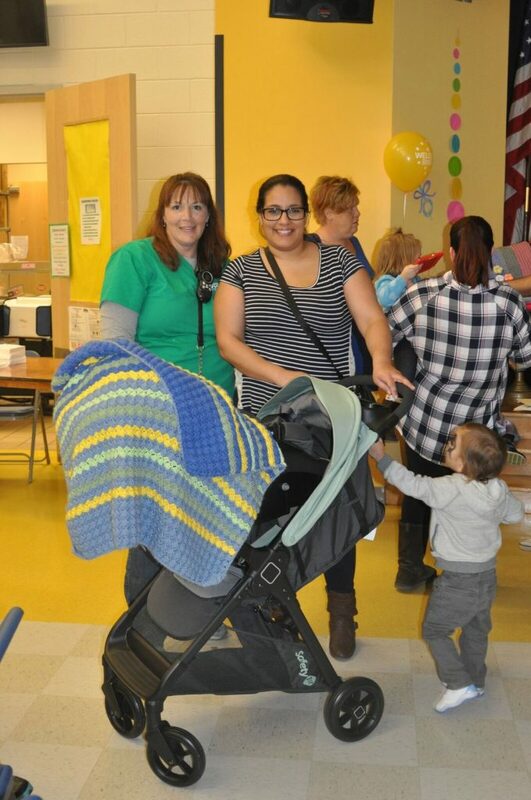 There was a donated stroller provided from a partner and the mother was emotional in sharing her gratitude; she was even able to bond with another parent at her table while eating lunch. 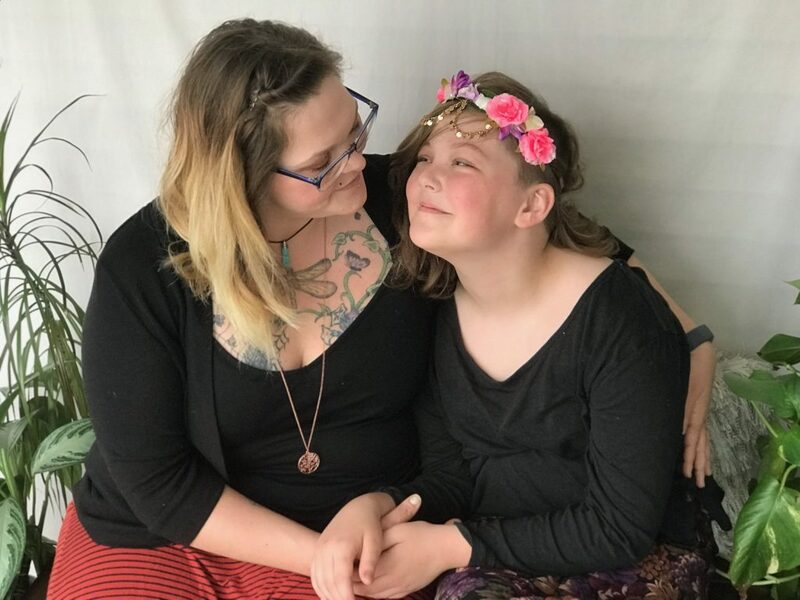 They were relieved to make a connection with each other and see that they aren’t alone in their unique parenting situations. 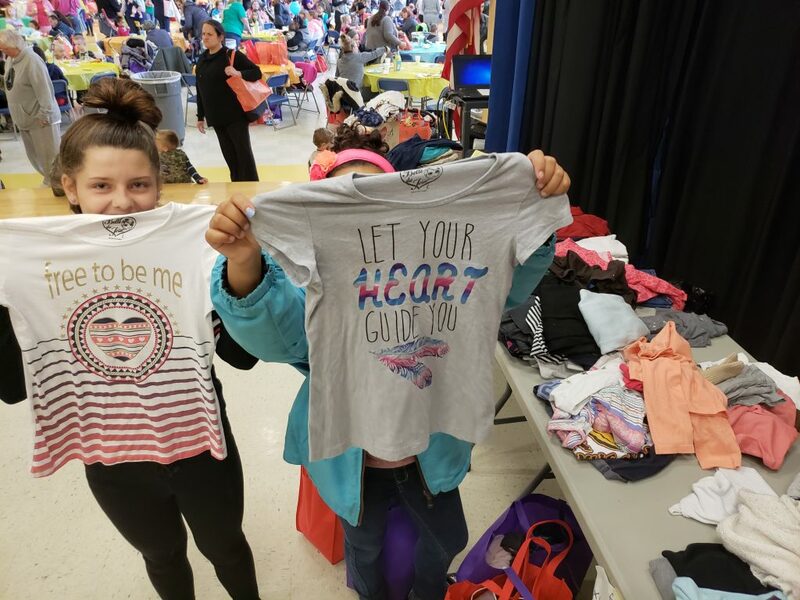 Two other parents were already connected on social media, both attended the event and brought in clothes for an exchange sponsored by Children In Need. They ended up trading items unaware that they were both in need of what the other had to offer. 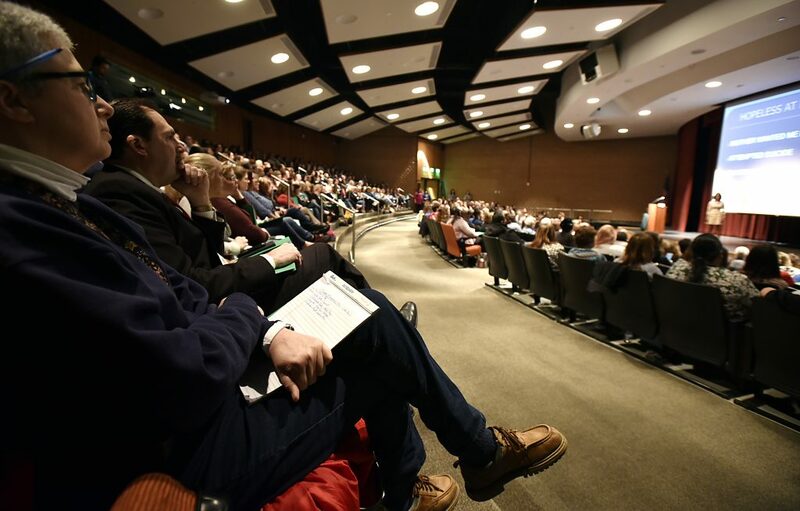 Many attendees were excited to find out about ways to address safety issues in the home. Several related that they were learning about safe sleep for the first time and others expressed surprise to find out that the batteries in some children’s books/toys could burn their children. “I thought it was an urban legend” said one parent. Electric outlet plugs, drawer latches, and other supplies were available to improve the child safety in the home. THANK YOU to each organization and partner who made this event a first class experience for families, we hope to see you again next year! 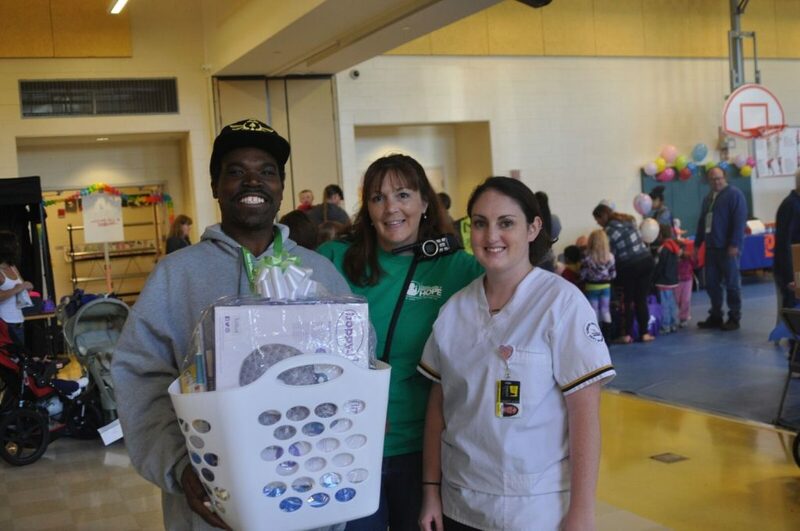 Several vendors were also donors of special door prizes along with other community partners including: Dr. Browns’; Shop N’ Save; San Mar Pajama project; Safe Kids; Southside Pediatrics; Hagerstown Artists Group; Community Free Clinic of Washington County; Hub at USMH; Chick Fil A; Family Healthcare; New Covenant Fellowship Independent Church ; Priority Partners; Birth to Five; Kids First Swim School; Pediatric Movement Center; Holly Luther; PNC Bank; the Knit Wits; Ready at Five; Otterbein United Methodist Church; Children in Need; Connie Connolly; Meritus Health; Mental Health Association – Healthy New Moms; Discovery Station; Frederick Pediatric Dentistry and Wells Fargo Bank. 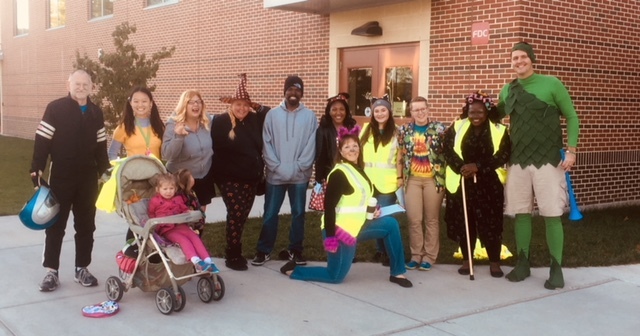 October is in the history books and with the school year in full swing for the children and families at Bester Elementary, that means the Walking School Bus is back! 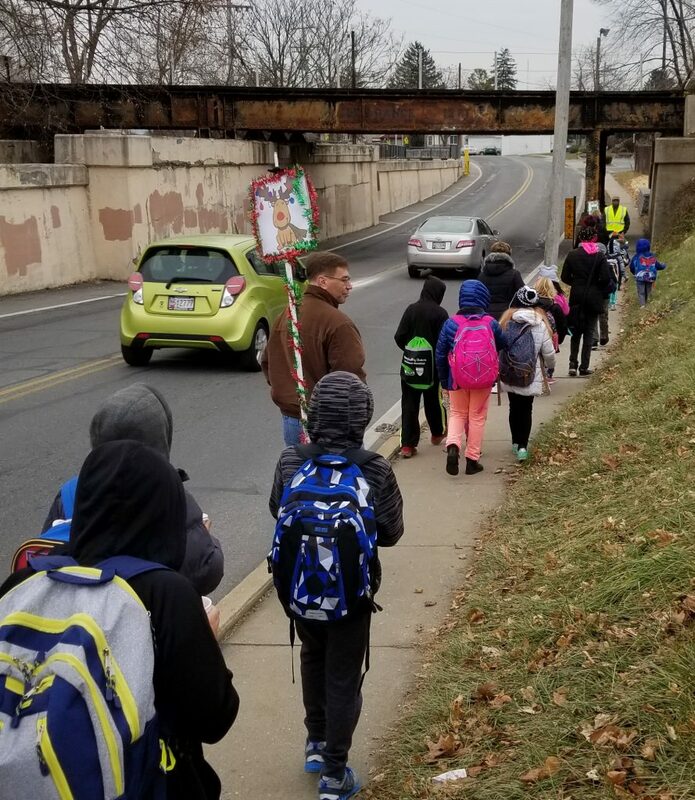 Bester Community of Hope has supported an expanded weekly effort to increase attendance, safety, health and social connections through a Walking School Bus initiative. 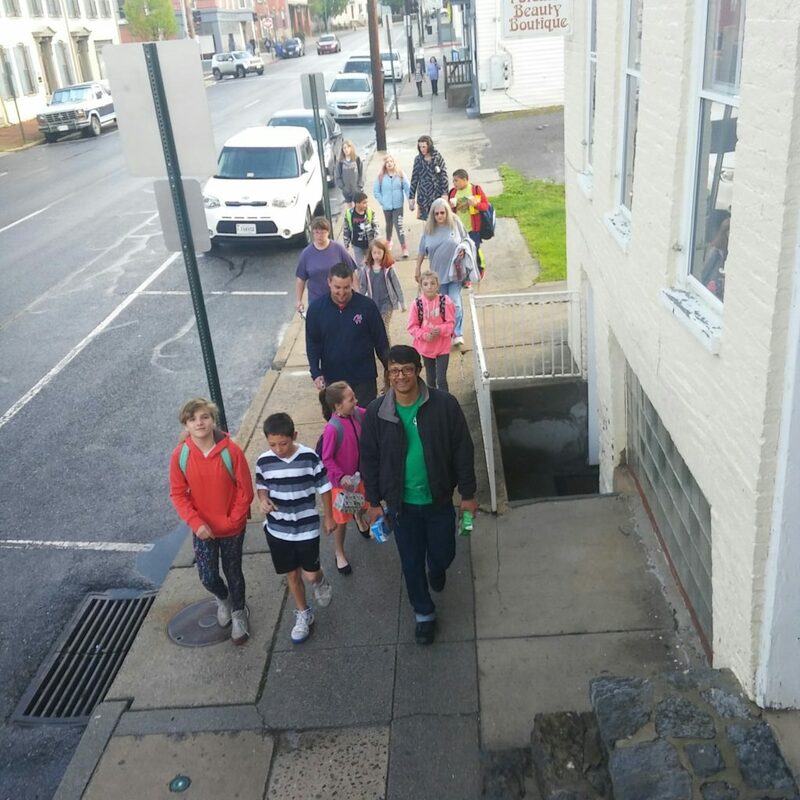 Through the generosity of a grant through the Washington County Health Department, the Walking School Bus has expanded to every Wednesday and now includes a team of neighborhood ambassadors, who are residents from the community. They support the effort at various locations on Wednesday mornings and the grant has allowed Bester Community of Hope to support positions for Kay Papeskov, Ed Barrick, Cassandra Thompson, Leticia Diaz, Brooke & James Grossman, Tyisha Richardson and Anthony Bostic, as well as the position of coordinator for Hollie Griffith. 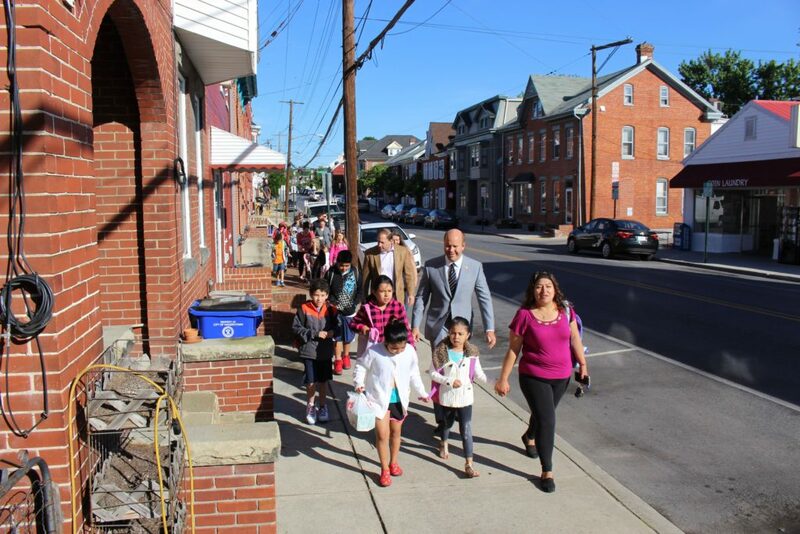 On the first Wednesday in October, the effort began on International Walk to School Day, followed by a school wide assembly to explain the effort and announce new exciting incentives to participate. 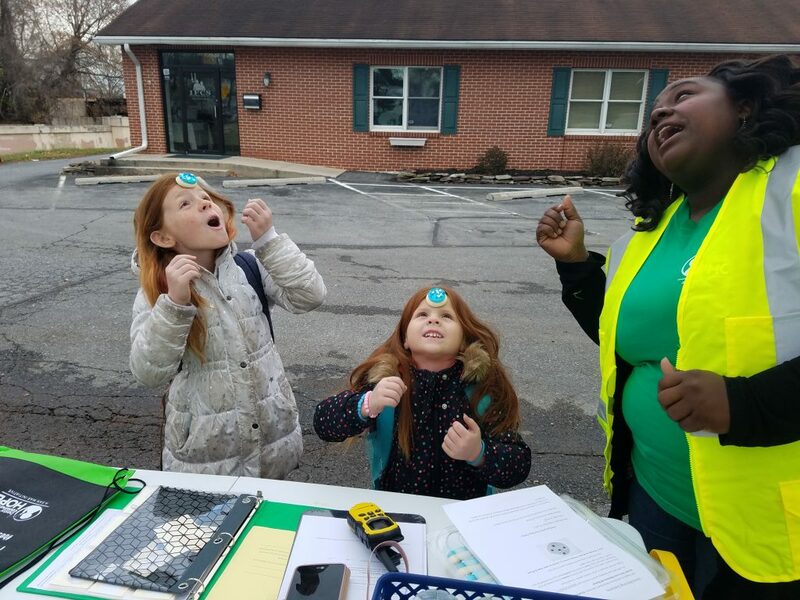 Kelly Llewellyn from Safe Kids and Meritus Health also presented to students and gave all Bester kids reflective strips and other resources to increase safety for their travels to school. 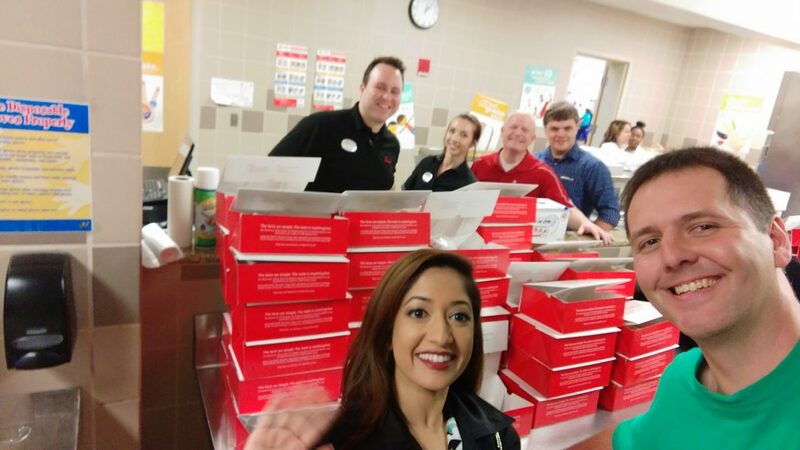 Kids were very excited to learn that the more they participated in Wednesday events, the more chances they received to enter into large raffle prizes each month; the October prize of a brand new pairs of shoes will be revealed on the morning announcements for two lucky students November 1st! 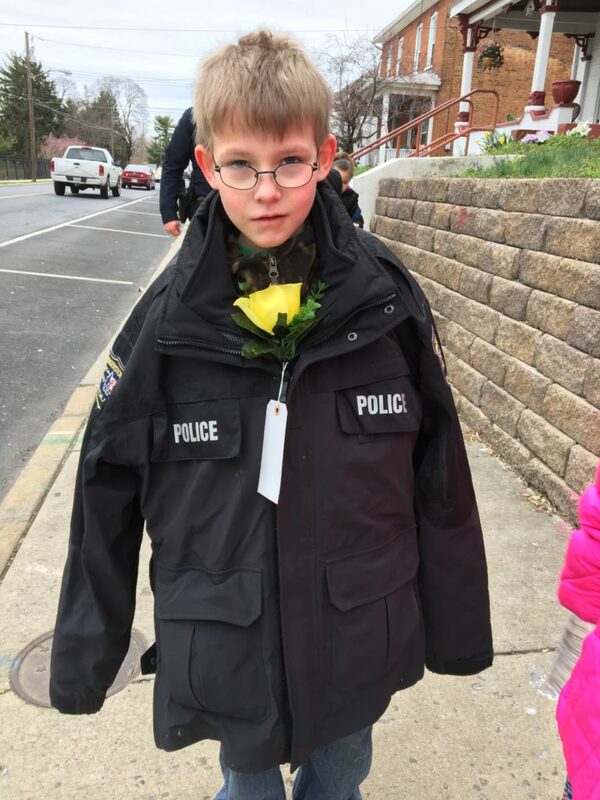 This past month there was also a special Wednesday to recognize all of the crossing guards who work typically work every school day shepherding students across busy Hagerstown streets with little fanfare. 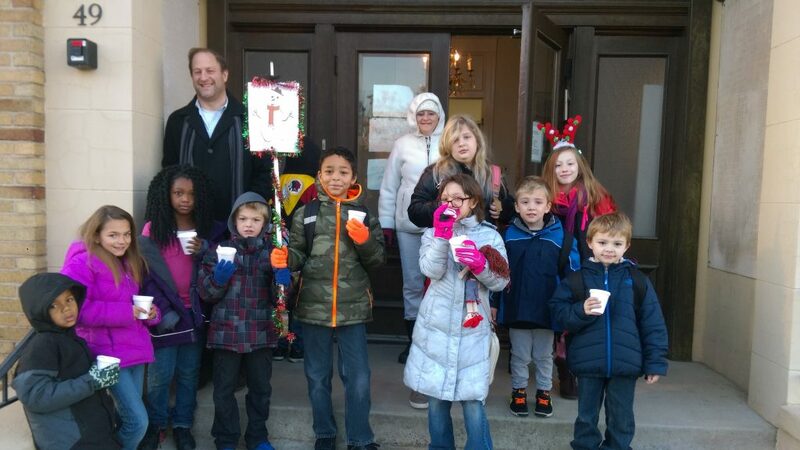 Students created paper necklaces with words of encouragement and thanks and presented them to pleasantly surprised guards on their way to school. It was an opportunity to build deeper relationships with the people these youth encounter each day. 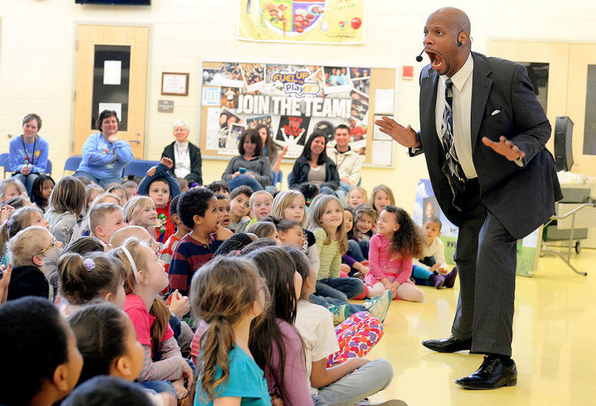 “This is really great, the kids seem real excited. 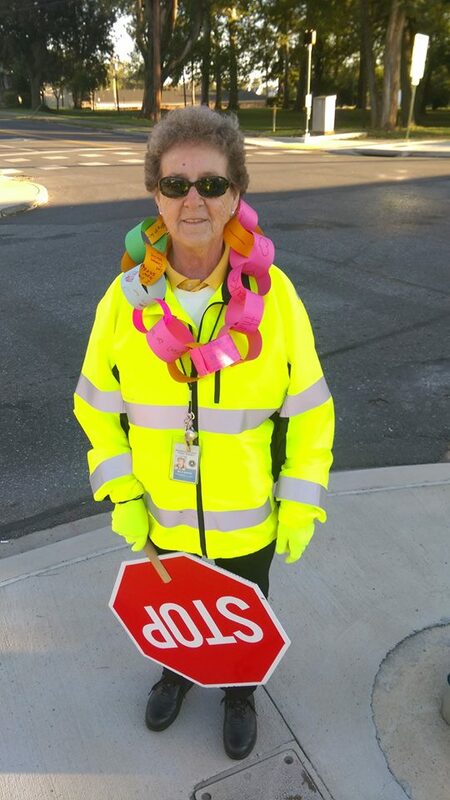 I’ve been a crossing guard for 50 years, and in this exact spot for 40 years, so I’m crossing the kids of the kids I used to see,” crossing guard Sara Nelson explained. Participants even took the time to sing to Ms. Sara in recognition of her recent birthday. 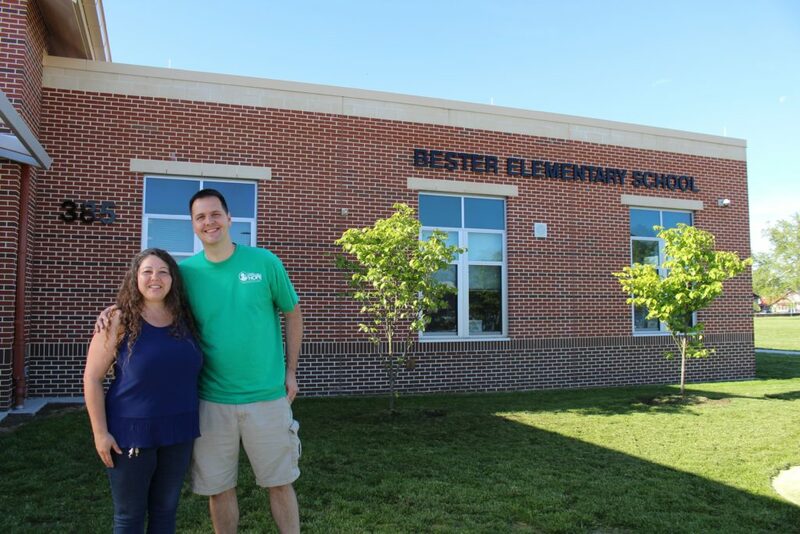 Leaders from Bester Elementary school took a special trip today to Ecoff Elementary School in Chester, Virginia, to learn more about the social and emotional learning programming taking place in their school. Amongst a host of strategies taking place at Ecoff. 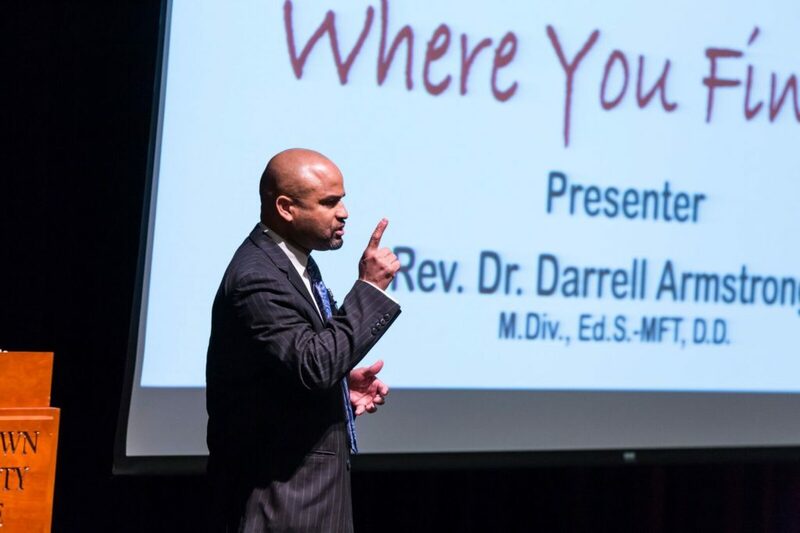 Principal Joshua Cole, Ph.D., has adopted Caring School Community to increase emotional intelligence and build community and has explained that “the key word here is empathy”. The morning consisted of visits into a variety of classroom settings where the work was on full display as teachers hosted classroom meetings, and spent time helping children learn the fundamentals of social emotional learning, including relationship skills, responsible decision making, social awareness, self-management and self-awareness. In Ms. Richardson’s class, 3rd grade and Kindergarten worked together as a part of the cross age buddies mentoring component to discuss problem solving together, and she implored the students to say, “I will be the solution finder!” in and outside of the school setting. 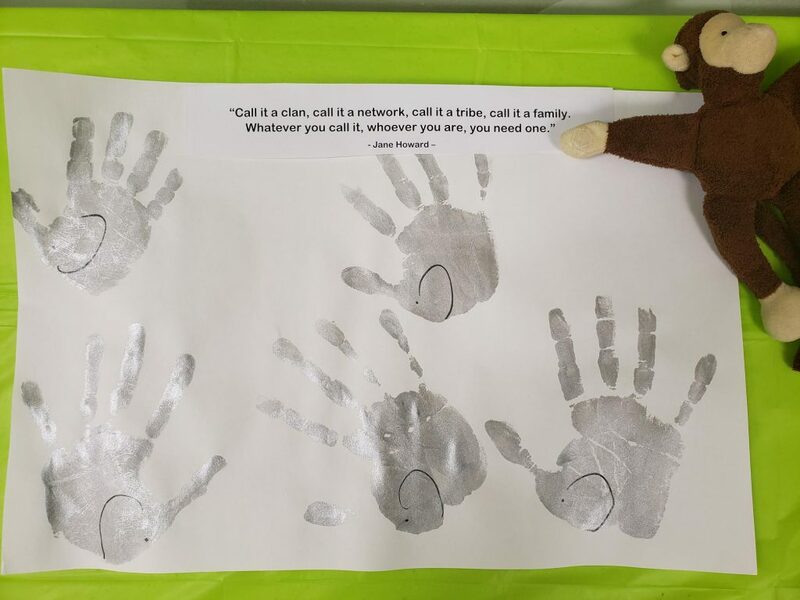 In Ms. Ebbs classroom students were asked to draw a picture to represent a time where they were kind to others, and students described not only sharing and taking turns, but using the right words such as “excuse me” and “please and thank you” to prevent peer issues. Ms. Staenart has worked to create a home-like environment in her classroom so kids feel comfortable sharing and talking through problems. In her classroom meeting kids talked together about a situation on the playground where things got a little rough amongst peers, and what they should to do prevent this next time. The teacher simply guided the conversation and allowed the kids to solve this problem as a group. Kids have the answers! 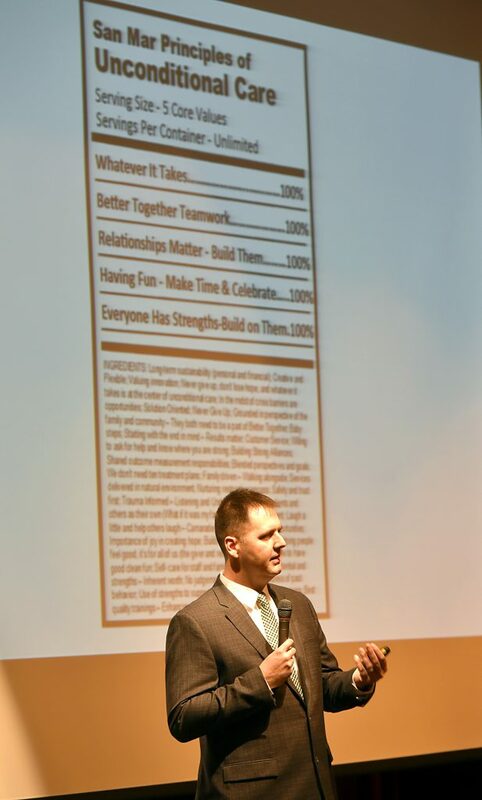 There were a variety of school values on display in the meetings, including “be brave” which encouraged kids to take chances and not fear failure. Teachers would often use hand signals and quiet voices to model positive classroom behaviors for their students. 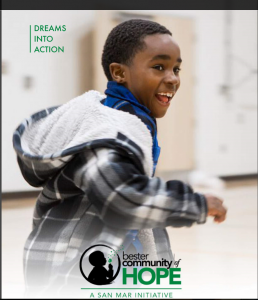 Bester Community of Hope has been partnering with Bester Elementary in Hagerstown, Maryland to implement a variety of evidence based practices and provide trauma informed education at the school over the past two years, including Caring School Community which began in the Fall of 2016. 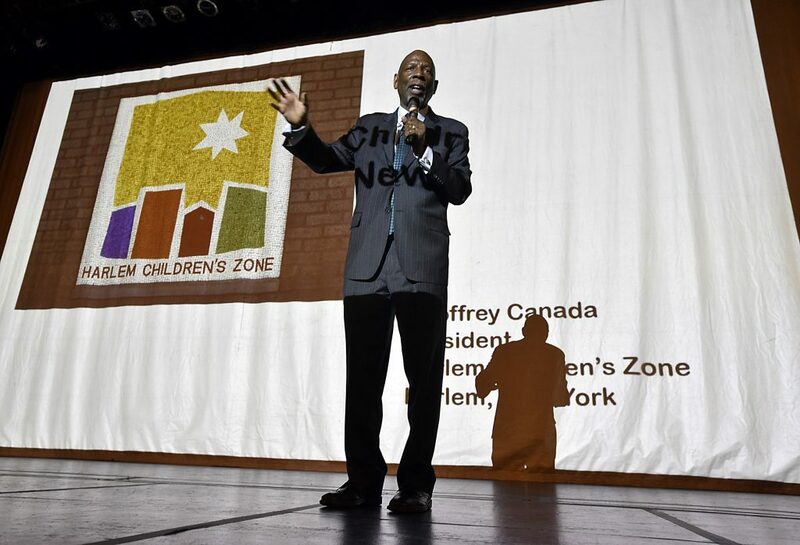 BCOH will host its next large scale community training focused on school based practices on March 29th with Geoffrey Canada of the Harlem Children’s Zone. Babypalooza 2017! Register today for free! 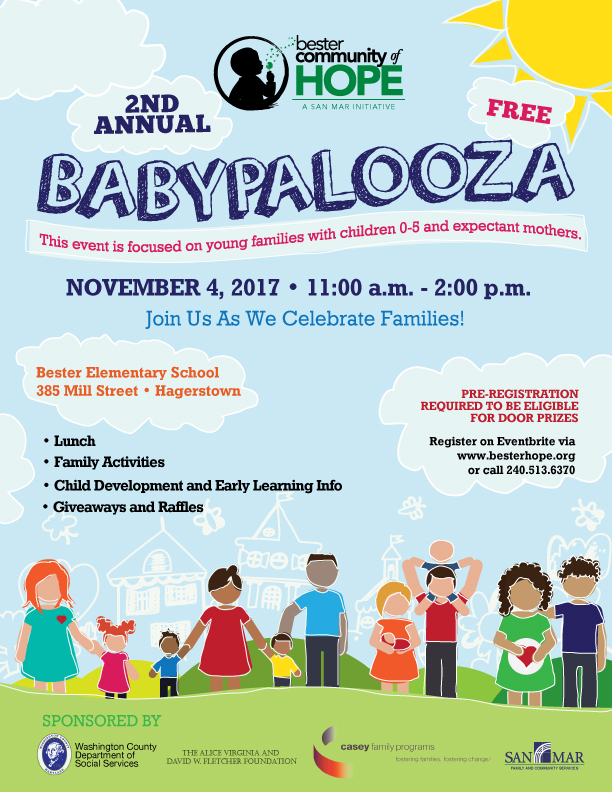 Don’t miss Babypalooza 2017 on November 4th, 2017, celebrating young families! 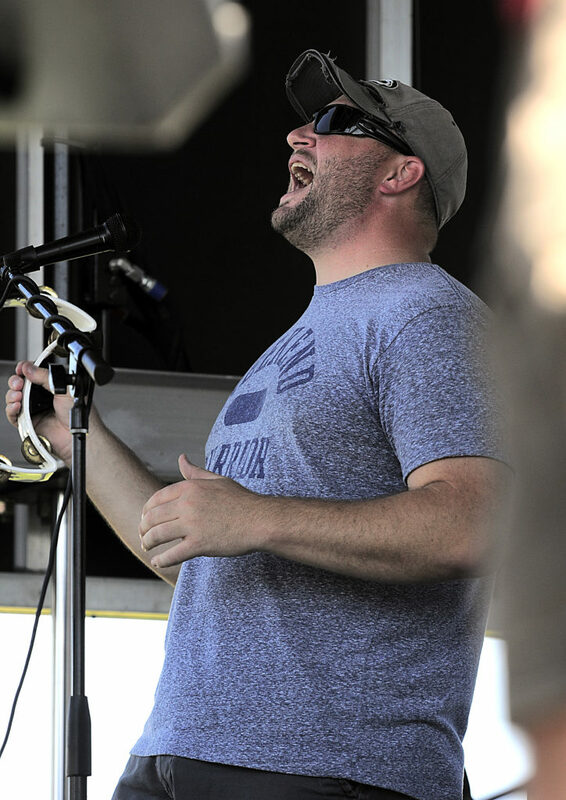 If you haven’t noticed, there’s a movement happening in the south end of the city of Hagerstown, and it was on full display as close to 2,000 people attended the 2nd Annual South Side Community Block Party at Bester Elementary Field on Saturday. The legendary Chuck Brown Band from Washington D.C. and Washington County favorites Staff Infection provided the music, local artist Spencer Jackson helped emcee and manage the stage, South Hagerstown High School’s men’s basketball team played against area kids on the court and also volunteered in the dunk tank, Life House Church provided a never-ending supply of snow cones and popcorn, It’s a Blessing to be a Blessing provided endless free prepared food and snacks, and close to 50 community resource vendors, community groups and kids activities were onsite to provide resources and build connections. 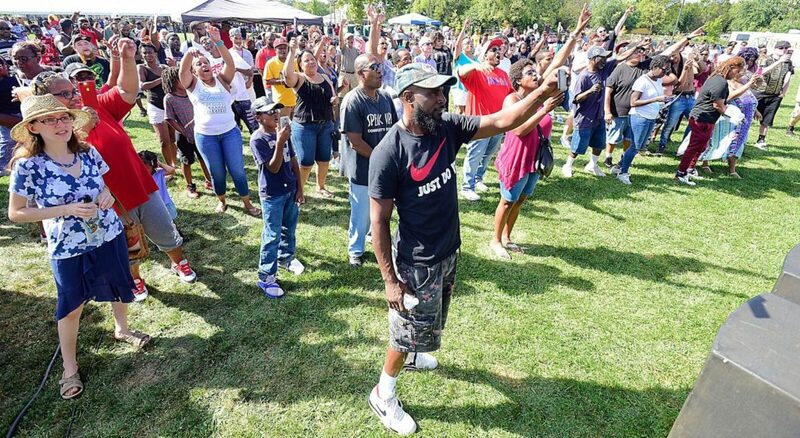 People from very different backgrounds joined together in the bright sunshine of the first weekend of fall to create lasting memories in the heart of their neighborhood. There was a tangible sense of unity and community pride, and today only one thing was clear, we belong here. In a short time, this event has become a tradition, but the ripple effect will continue long after the activities are over, because the world got just a little bit smaller because people took the time to listen to each other and celebrate together. 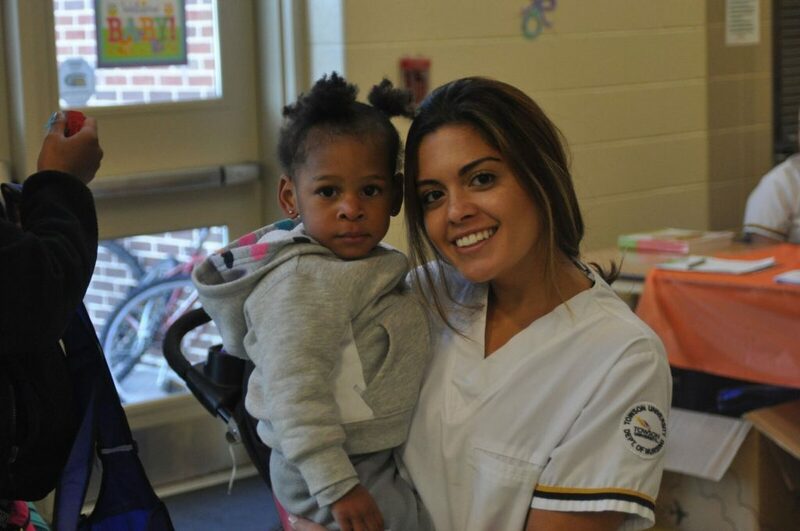 Our hope is families are able to establish partnerships with providers in their community who can help them become stronger, residents can collaborate with their peers, and children can strive for excellence in their schools and neighborhoods. 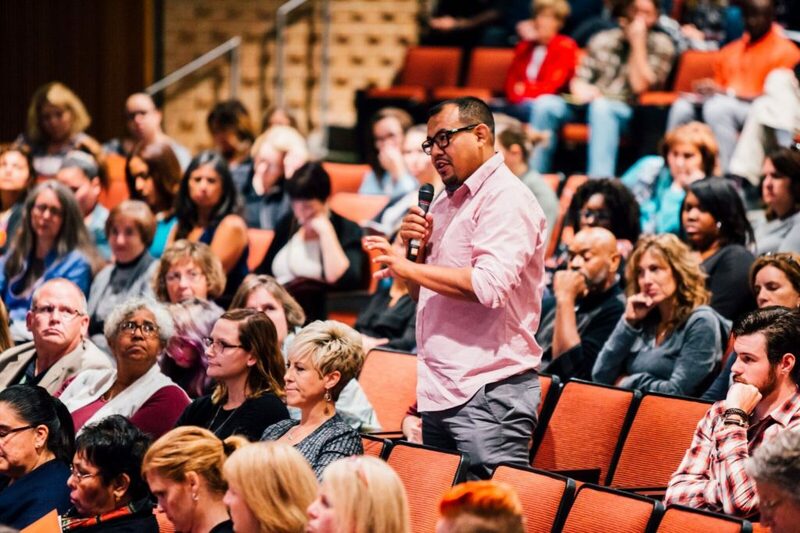 We invite you to join us and get involved as we continue to lift up local neighborhood leaders and support children and families in the Bester neighborhood. The future is bright because there is greatness here, we hope you’ll consider joining us on the journey. 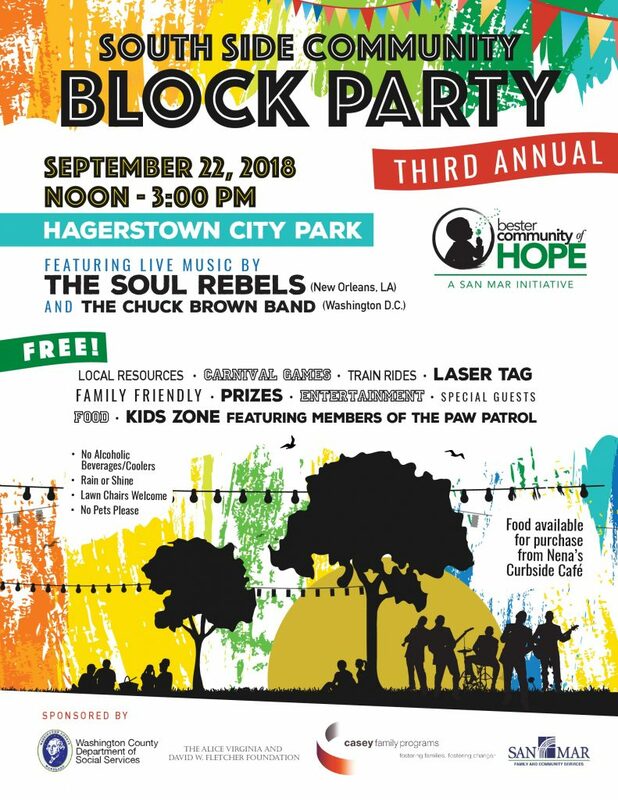 This event is made possible in part due to the generosity of the Washington County Department of Social Services, Fletcher Foundation and Casey Family Programs. Want to get involved? Give us a call at 240-513-6370 or email at connect@besterhope.org. 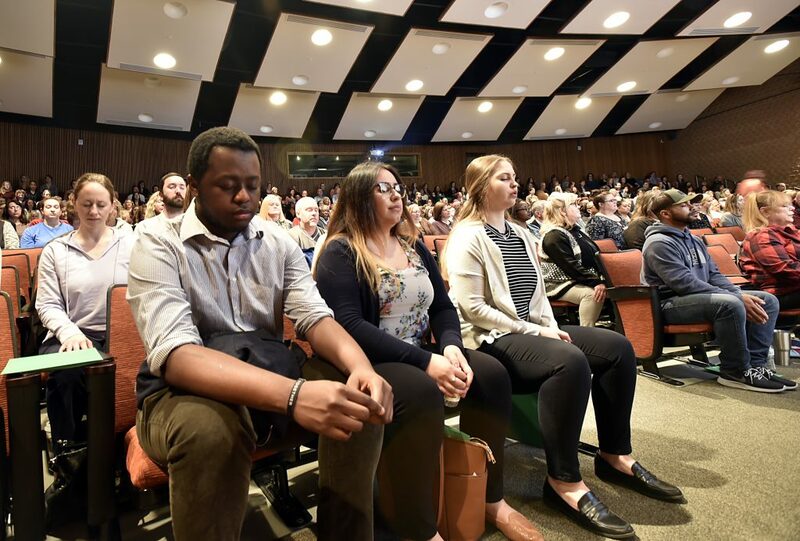 On Friday morning at Kepler Theater on the campus of Hagerstown Community College, Bester Community of Hope continued its training series focused on trauma informed practices with over 350 attendees present for “Healing Communities”. 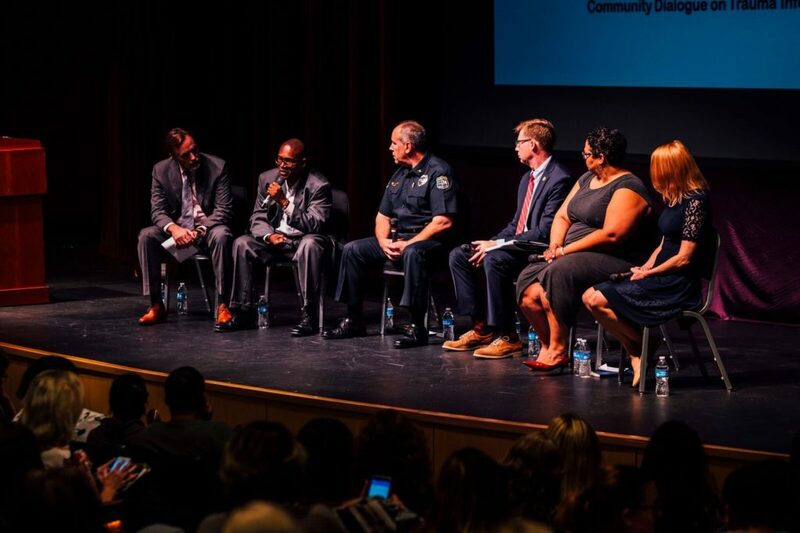 The much anticipated event brought two nationally renowned speakers and a panel of local and regional leaders to discuss what the research currently says about the impact of adverse childhood experiences on our community, what is currently being tried in our region to respond to social needs, and creative approaches nationally that have proved successful over time. 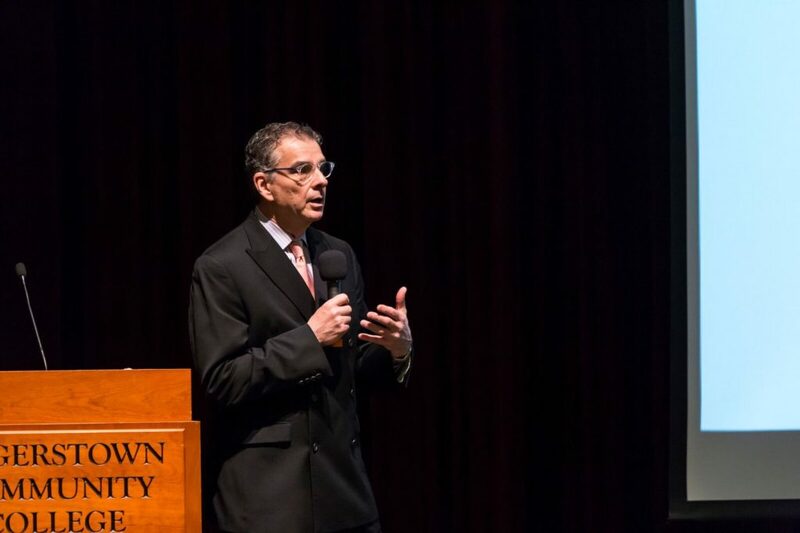 Leading the event, Dr. Robert Anda, co-principal investigator of the Adverse Childhood Experience (ACE) study, expanded on information provided at previous trainings by discussing the direct correlation between trauma experienced in childhood and many of the social problems we experience in communities. 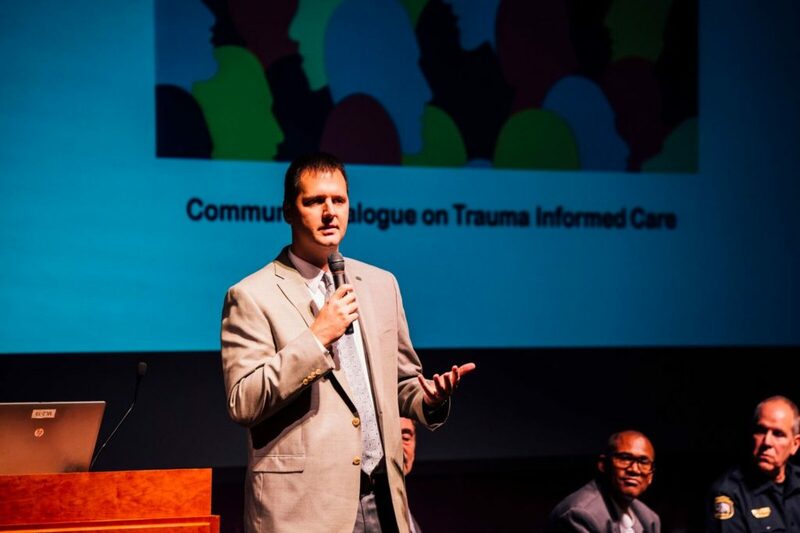 He focused on how common ACE’S are in the general population and the call to action that the data represents for community groups to build self-healing communities. It is in those communities that the service sector can be a stronger partner to individuals who have traditionally been viewed primarily as the recipient of services, and shift towards empowering these individuals to be the agent of change in their neighborhood. Anda followed his presentation by facilitating a dialogue with community leaders who discussed their beliefs in the best approaches to strengthening communities and where they’ve had success in working with children and families. 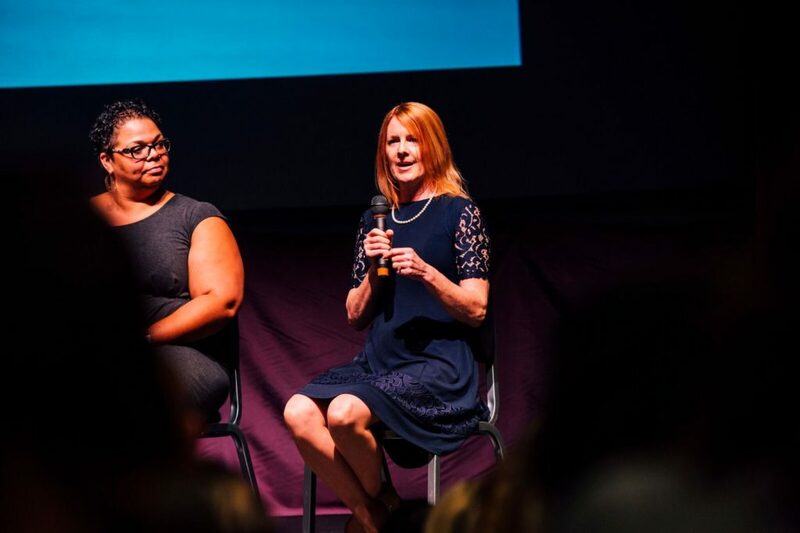 The panel included Rebecca Jones-Gaston, Executive Director of Social Services Administration of Maryland; Carolyn Holcomb, 2017-2018 Washington County Teacher of the Year; Del. Brett Wilson, Washington County (R-2B); Andy Smith, Brothers Who Care and Hagerstown Chief of Police Victor Brito. 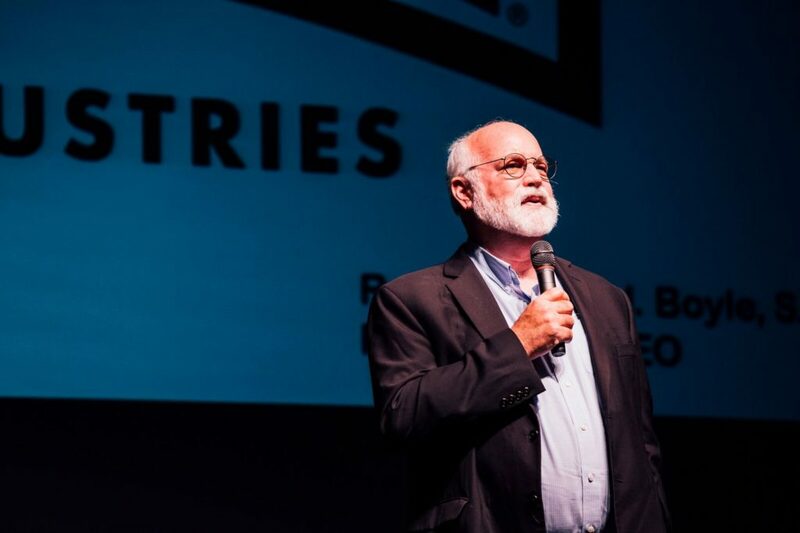 Closing the program, Father Gregory Boyle arrived from Los Angeles, California to provide a keynote on the power of boundless compassion, reflected in his countless years of work leading the largest gang intervention program in the world. 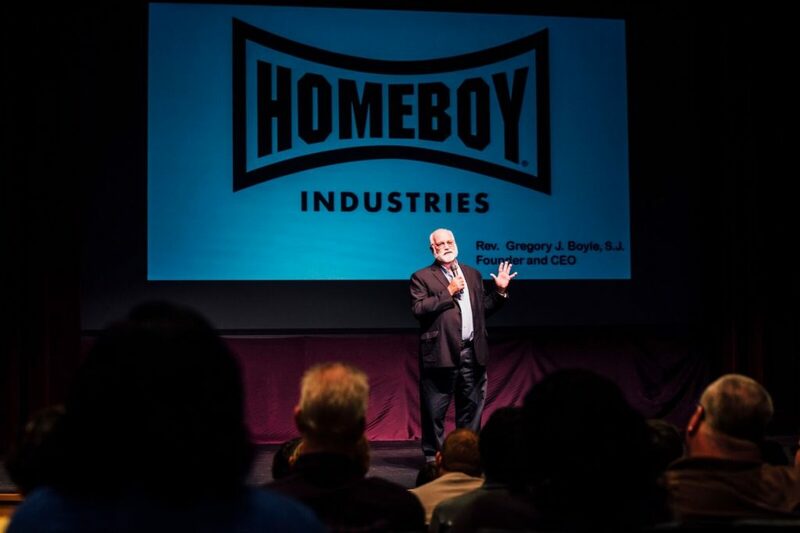 As the Founder and CEO of Homeboy Industries, he kept the crowd laughing, crying and on the edge of their seats as he recalled numerous stories of challenging situations where unconditional love was the secret ingredient to lasting positive outcomes with individuals and families that had not experienced success previously. 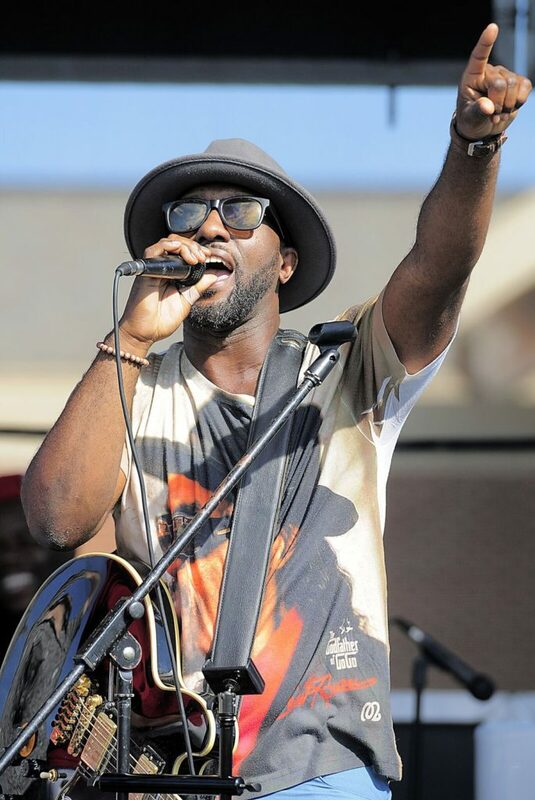 He pushed the audience to think about how similar we all are, and that, “We’re not separate. We’re one.” He focused on the idea of mutuality and shared experience, to help build connections and relationships, and that a “community of kinship” is what he has worked to develop at Homeboy Industries, focused on essential healing. Bester Community of Hope, an initiative of San Mar Family & Community Services (previously San Mar Children’s Home), plans to follow-up this event with smaller gatherings of key groups in Hagerstown interested in expanding the awareness of the ACE research and implementing trauma informed practices in school and neighborhood settings. 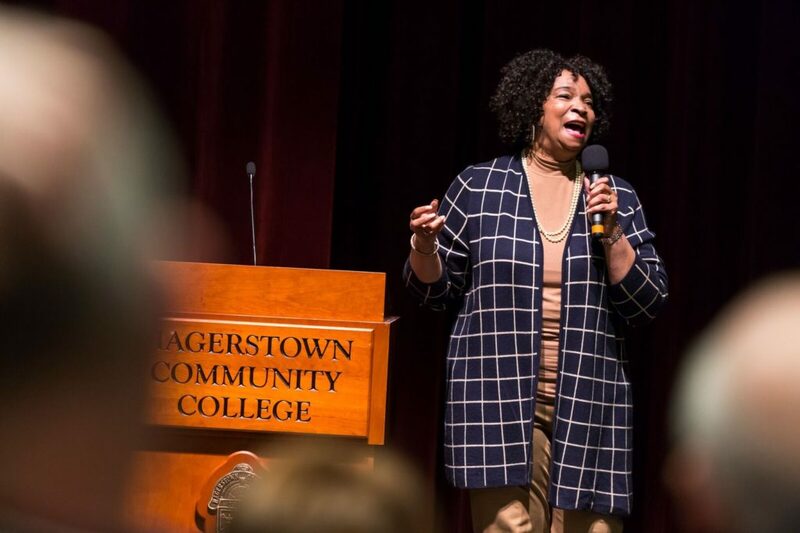 Their 3rd annual community summit titled “Collective Impact” is scheduled for Thursday, March 29th at Hagerstown Community College. 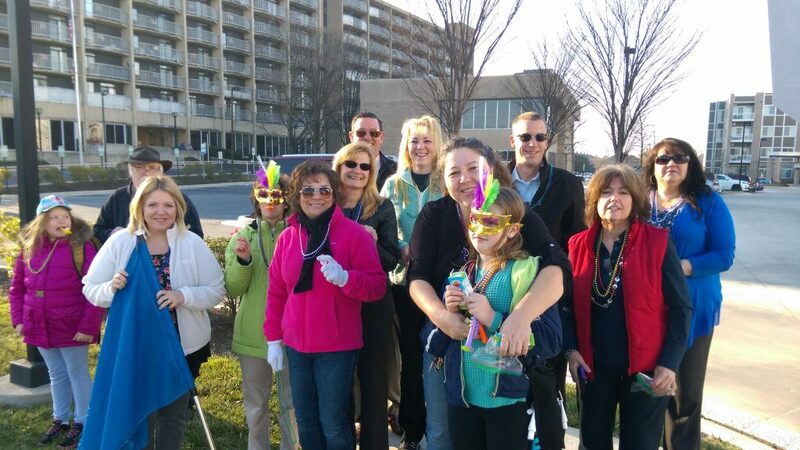 Bester Teachers Blitz the Neighborhood! 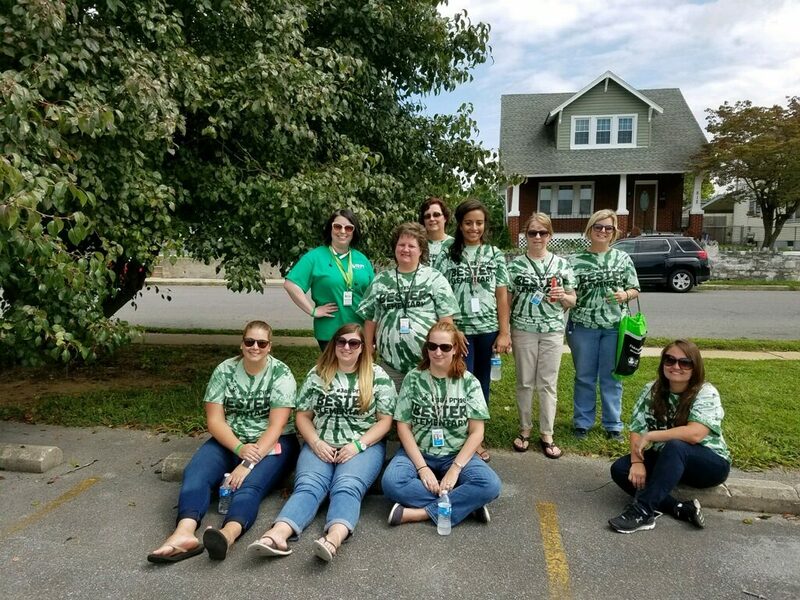 The school year is set to begin this Tuesday in Washington County, and Bester Elementary teachers took the opportunity to walk their entire district to connect with their students in the neighborhoods where they live. 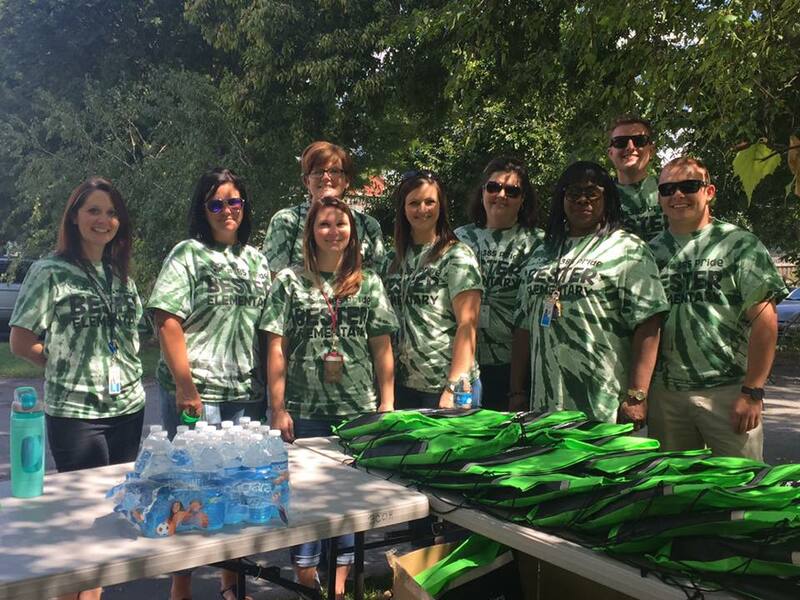 Inspired by other community outreach work, including similar efforts at nearby Salem Elementary, the staff decided this summer to get out in the neighborhood to continue to deepen their connection to their students. Near the Elgin site staff toured Elizabeth, Madison and nearby W. Washington St.
Register today for “Healing Communities” on September 8th! We’re excited to announce the next training in our series focused on trauma informed strategies for the community! See the flier above regarding an exciting event we are hosting this Fall with two dynamic speakers and a panel of regional leaders discussing what implementation looks like in their social institutions. Group rates are available for organizations registering ten or more attendees, contact Kerry Fair at 240-513-6370 or kfair@besterhope.org to arrange. Our last two trainings sold out prior to the day of the event, don’t wait to get your tickets! 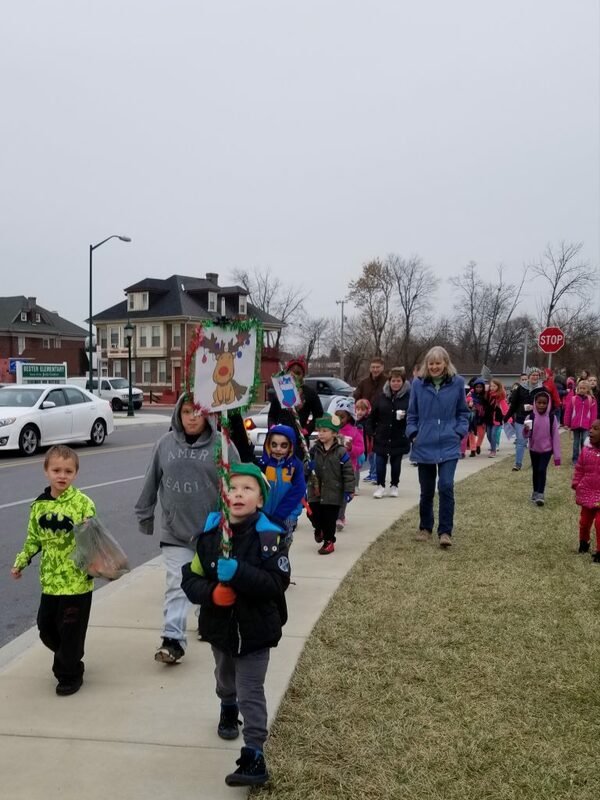 The Walking School Bus officially wrapped its first year of programming for Bester Elementary students who walk to school. 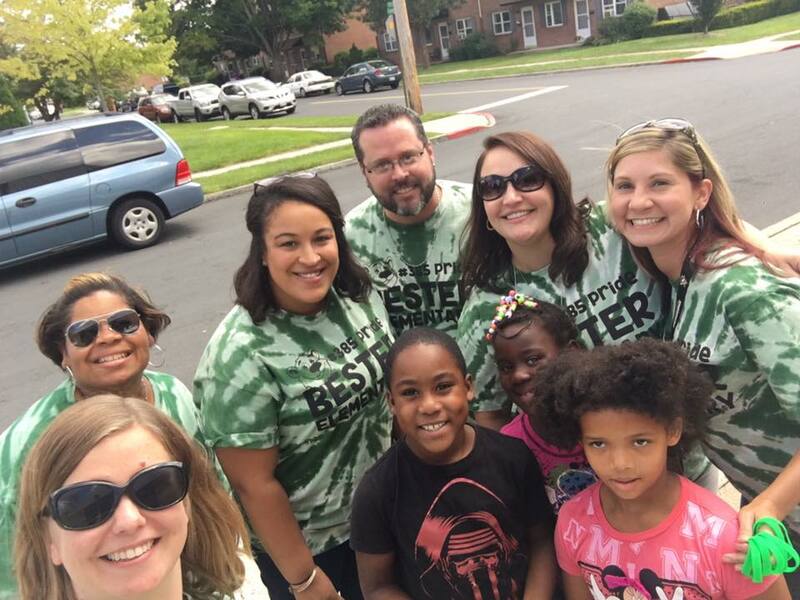 During the 2016-2017 school year a variety of community partners came together monthly to join children and families on their journey to Bester. 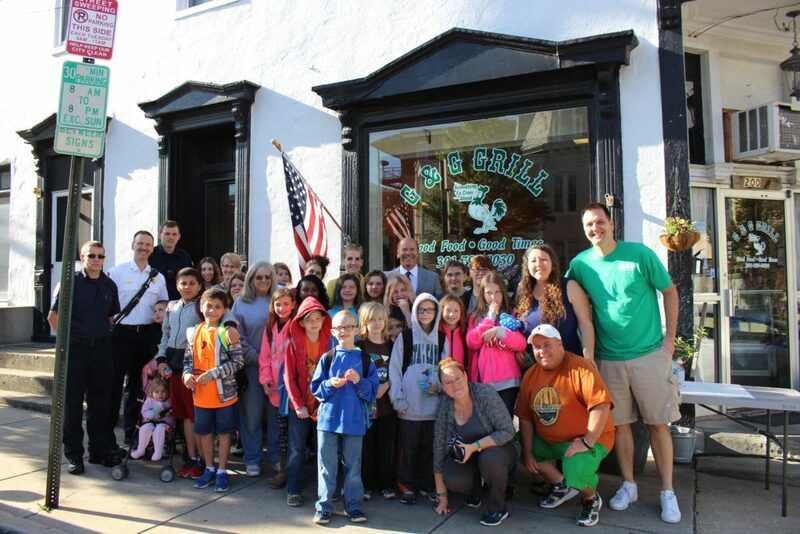 Congressman John Delaney and his team made a special visit to the G&G Grill meeting location today and had breakfast with children and families. A couple months ago, Bester student Ornella Provard was at a public forum with her mother Kay Papeskov and asked Congressman Delaney “Will you walk to school with me?” He followed up and scheduled a time to join all of Bester’s students during their journey and made sure all participants received a special commemorative coin from the U.S. House of Representatives to go along with their juice box and Teddy Grahams. Today students arrived at various meeting locations and filled out a Bester paw print to describe their favorite thing about going to school. 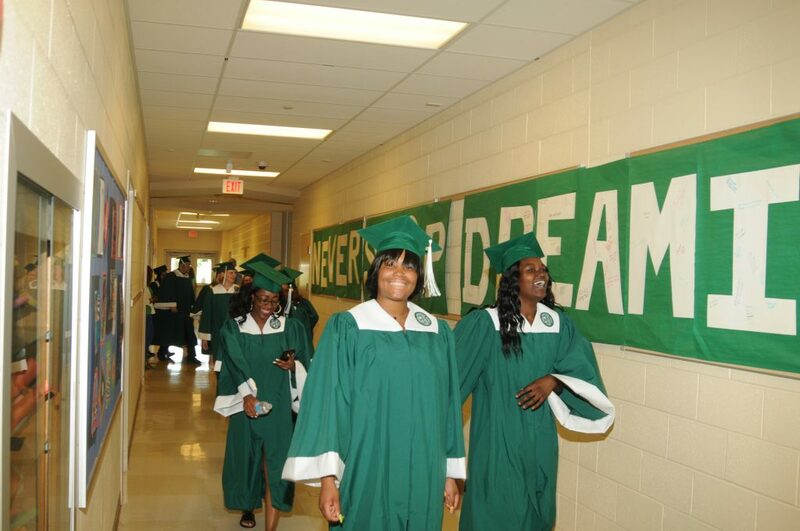 They also wrote words of encouragement on large posters for graduating South Hagerstown High School seniors set to visit Bester for their annual senior walk on May 31st. 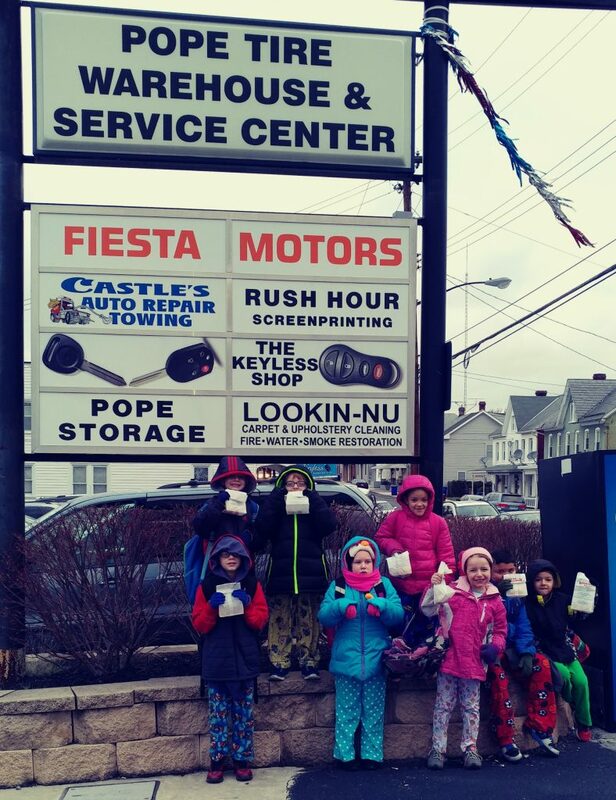 As the group was leaving the Triple Coin Laundromat meeting location, a first grade girl sprinted to catch up the group and said, “Thanks for waiting for me! 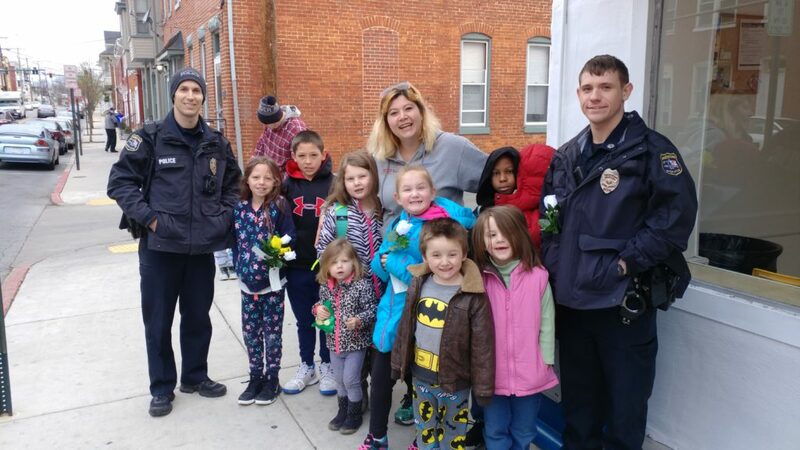 I never want to miss this!” Kids were joined by other special guests including Congregation B’nai Abraham Rabbi Ari Plost, Health Department officials, and members of the local fire department and EMT’s, some of which who were beginning the first hour of a 24 hour shift. 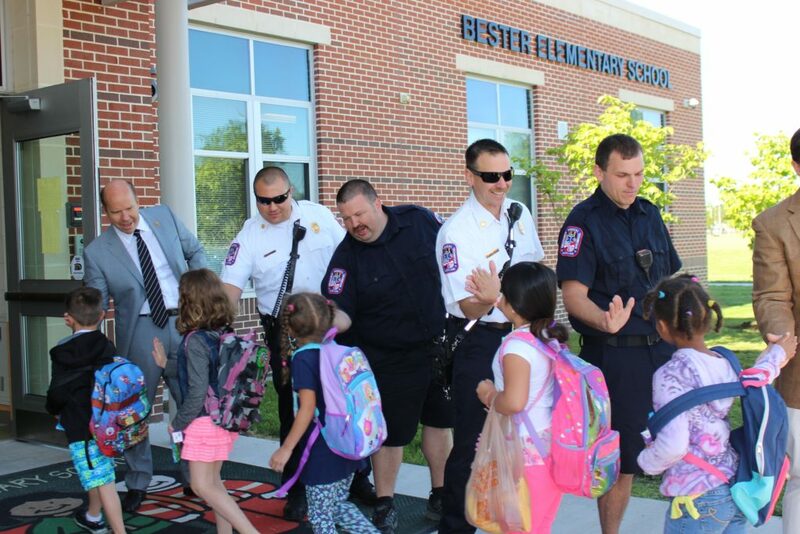 Young children were enamored with the fire truck at Frederick Manor, while 5th graders who filled out positive statements about Bester struggled with the idea of leaving to go to middle school next year. 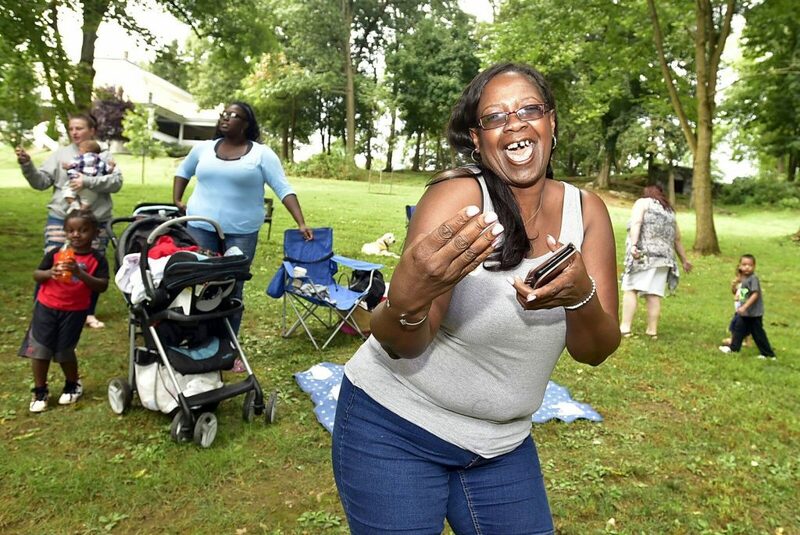 “What’s your favorite thing about Bester?” an EMT asked a child at Memorial Park. “Mrs. Henline,” the two children at Memorial Park responded about their teacher, “She makes class fun by playing games and she’s really nice.” As all four groups arrived at Bester a row of community partners cheered and celebrated as children ran into the school entrance getting hi-fives, a great start to the school day! 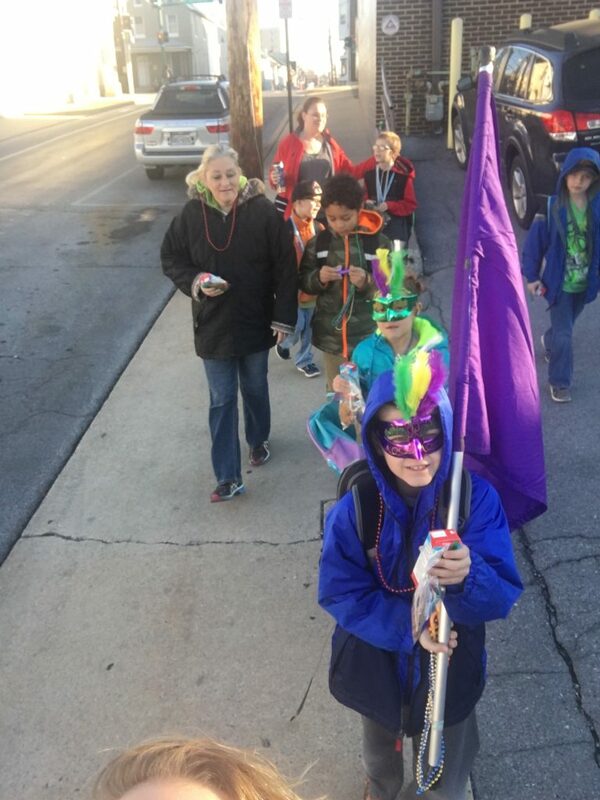 Bester Elementary’s Walking School Bus is a monthly parent-led effort focused on attendance and social connections, supported by community partners including the Bester Community of Hope. We hope to continue to support this effort in the 2017-2018 school year; interested in participating or have great ideas for a fun theme? Let us know at 240-513-6370 or by e-mail at connect@besterhope.org. Join us! 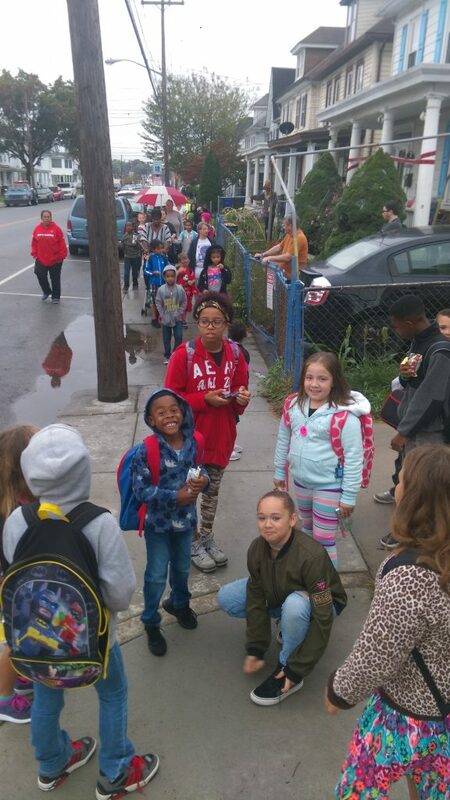 The rain in the forecast held off and kids enjoyed a fun journey to school together with their friends, family and community partners. 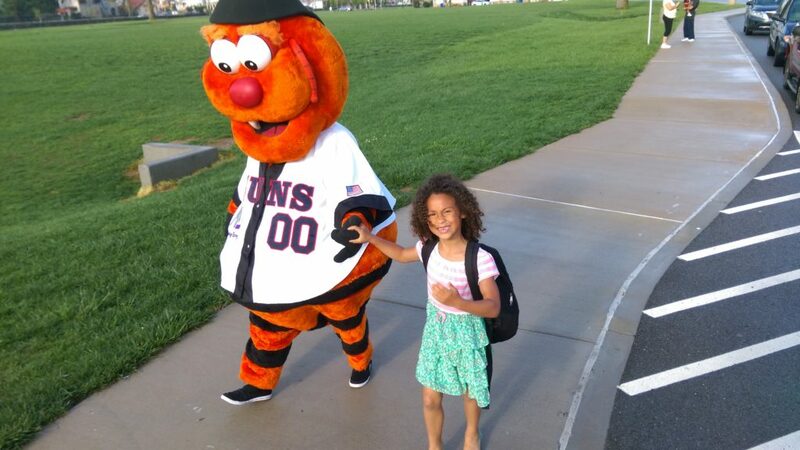 Upon arriving at the entrance to the school they were welcomed by none other than the Suns mascot Woolie, who along with greeting walkers, went car to car and gave hi-fives to parents who couldn’t help but smile at the unexpected visitor at their window. 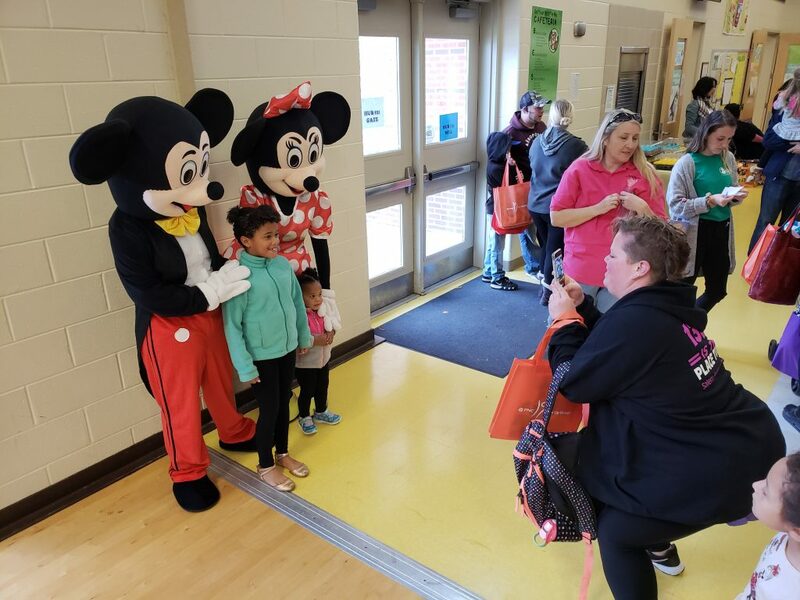 Parents took photos as their child received hugs from Woolie and Suns staff encouraged students as they entered the building to have a fantastic Friday. 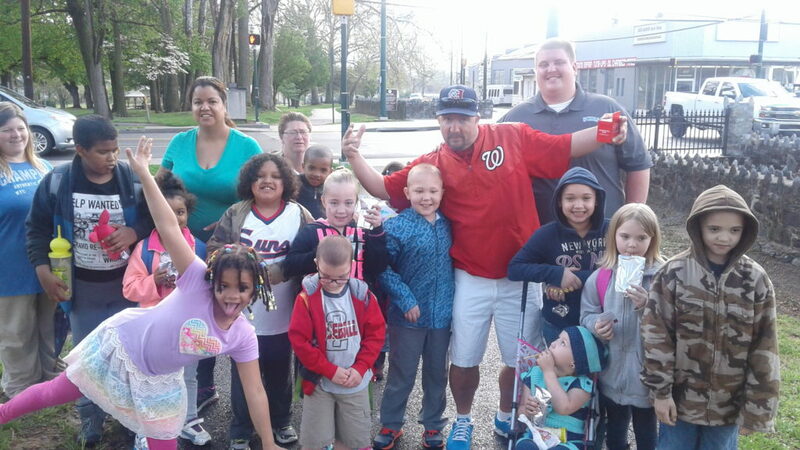 Bester Elementary’s Walking School Bus is a monthly parent-led effort focused on attendance, supported by community partners including the Bester Community of Hope. Interested in participating or have great ideas for a fun theme? Let us know at 240-513-6370 or by e-mail at connect@besterhope.org. Join us! 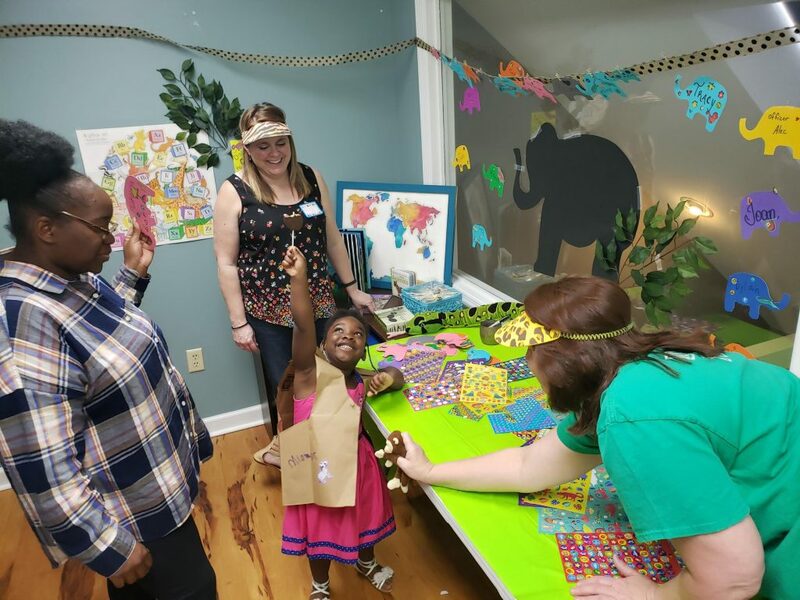 Bester Community of Hope hosted twelve local families with their children on Wednesday April 12th, as our Mill Street office filled with fifty five individuals for a fun free day of activities and family photos. The day was designed around the five protective factors that strengthen and support families: social connections, concrete supports, social and emotional competence of children, knowledge of parenting and child development and parental resilience. 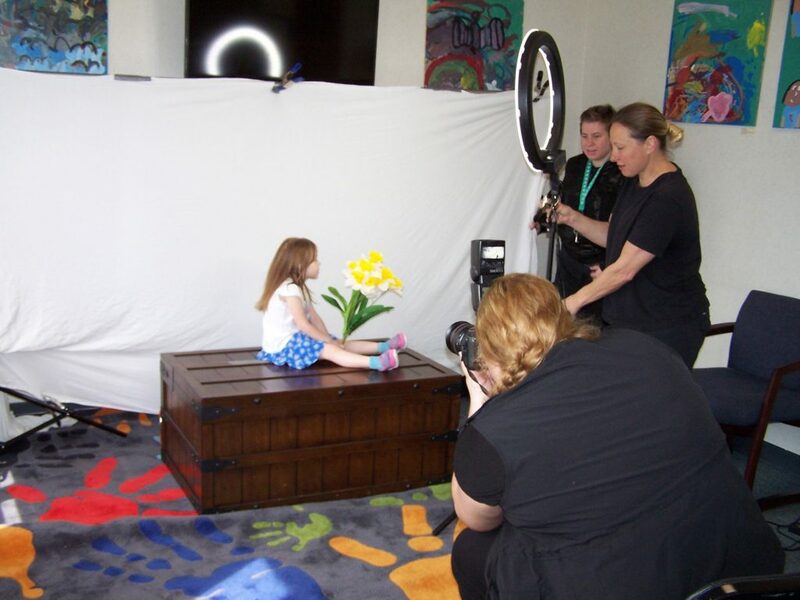 For many years, San Mar has benefited from a partnership with Lanie Kinze and her team at Crystal Lenz Photography, who donated free photography services for all families on Wednesday. Each family will receive an assortment of photos in the coming weeks as well as a larger family photograph during the week of Mother’s day. 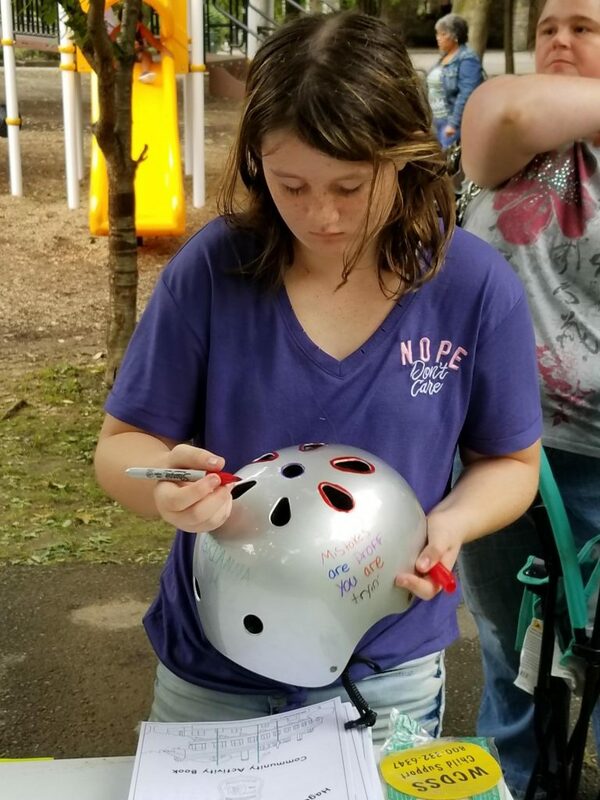 This activity emphasized the power of family and the importance of social connections. 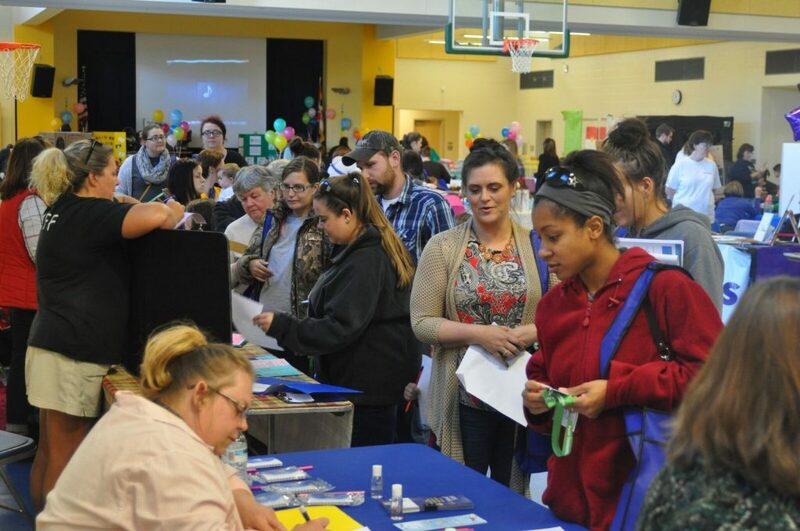 The parenting knowledge and child development station provided supportive information on individual milestones and internet safety and empowered parents to identify their child’s milestones and how to prepare them for upcoming tasks. Parents shared ideas such as: What kinds of things make your child happy? What does your child do best? What do you like about being a parent? Kids were nearby and perked up with pride when parents had positive things to say about them. 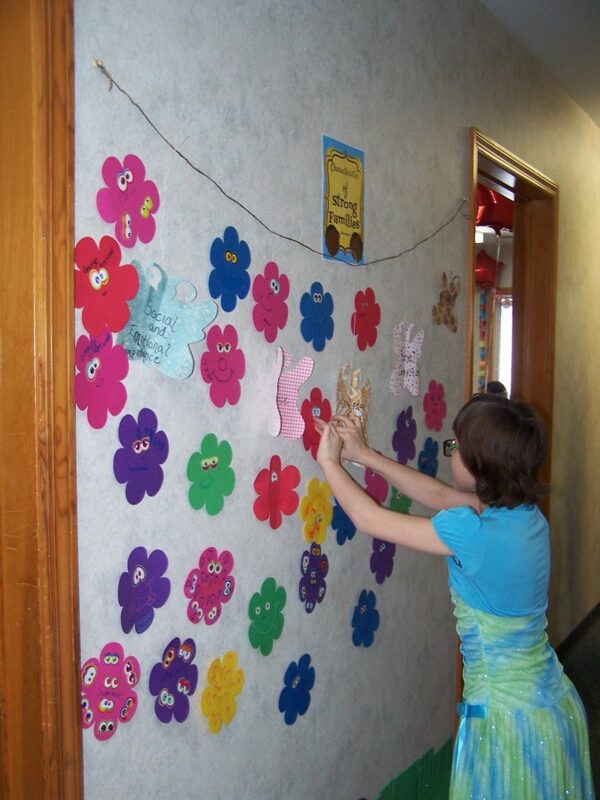 To demonstrate characteristics of strong families, each person designed their own flower to represent themselves and their own unique role in supporting their strong family. To demonstrate parental resiliency each parent made a wheel of coping mechanisms for stress reduction. They enjoyed each other’s company and conversed about their different experiences. 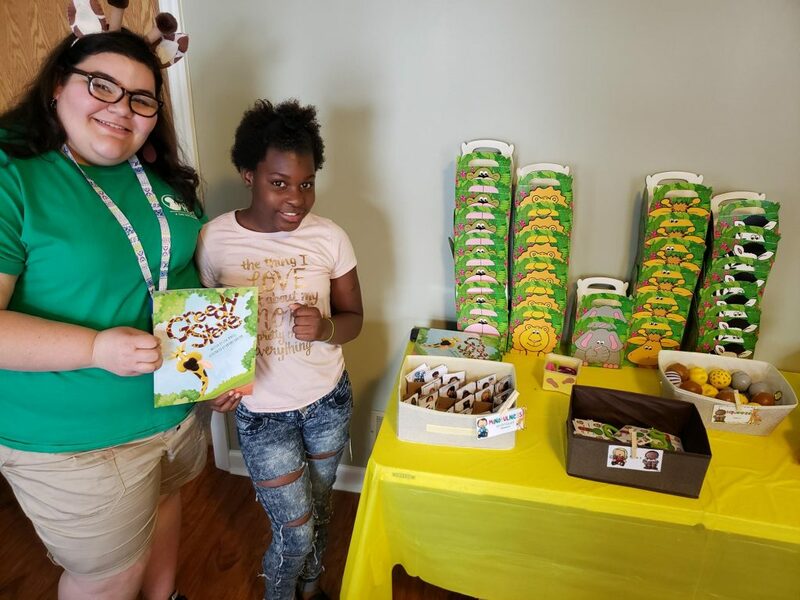 Volunteer Terri Siefert read the story of “Tucker the Turtle” who learns coping skills to demonstrate the value of social & emotional competence of children. Families were given information on local activities, a basket of household supplies and a bag of pizza-making supplies emphasizing concrete supports. 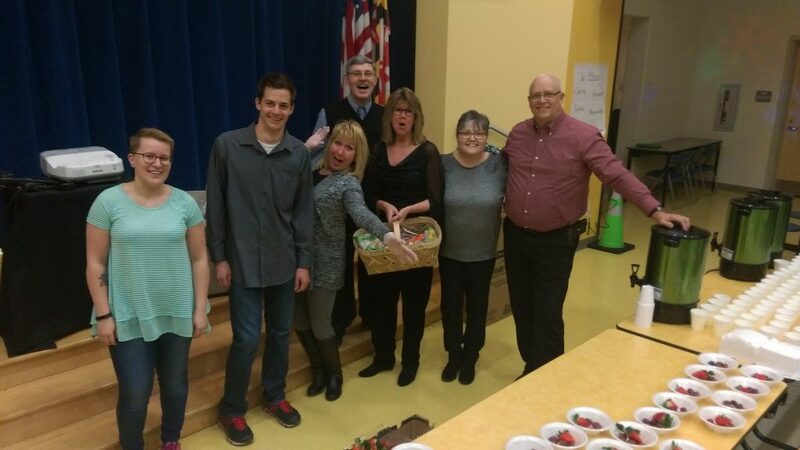 Kids also received Easter baskets coordinated by an exchange student named Janet and her host parent George Phillippi. Do you live in the Bester neighborhood and want to get involved in helping build a stronger community for families? Stop by 370 Mill St or give us a call at 240-513-6370! It was a special school day and an even more exciting evening for Bester Elementary students and their families. Professional basketball team the “Harlem Ambassadors” shared stories of hope and resilience, as each player had accomplished great things through past adversity. 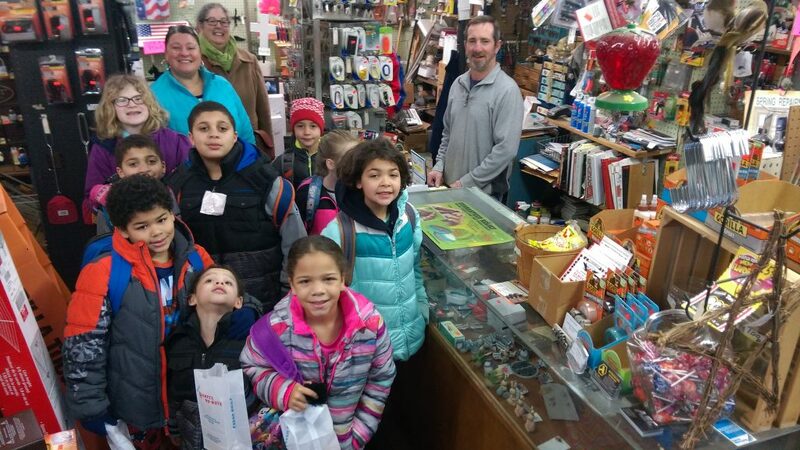 Kids had a day filled with fun and character education, and an evening with family memories that will last a lifetime. Thanks to all who joined us! 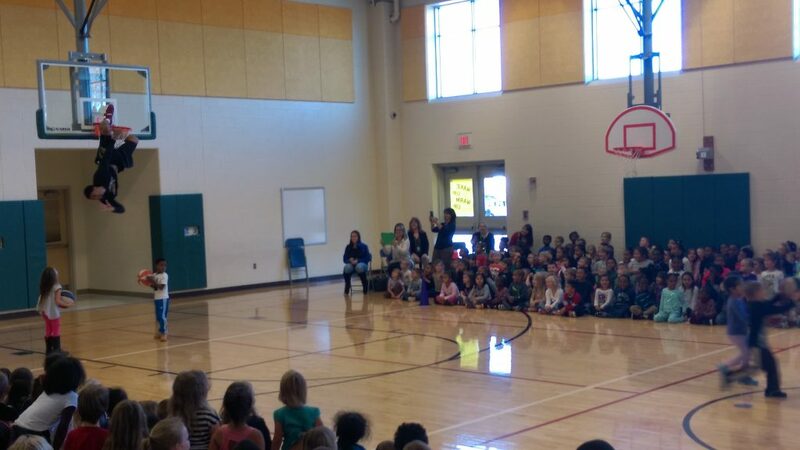 During the day there were two assemblies, one for Pre-K through 2nd grade, and the other for 3rd through 5th grade. 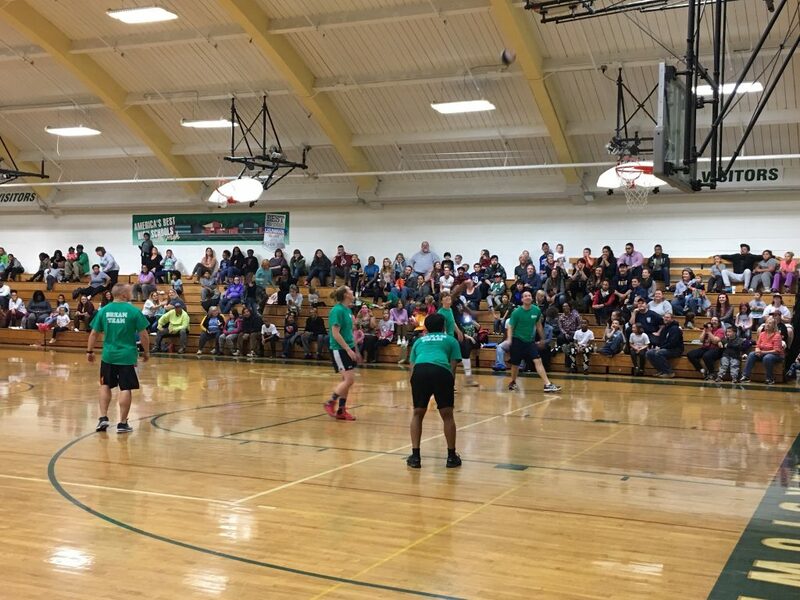 This evening, Bester took over South Hagerstown High Schools gymnasium for a fun filled game against the Bester All-Stars, which included school teachers and friends from the Bester Community of Hope. 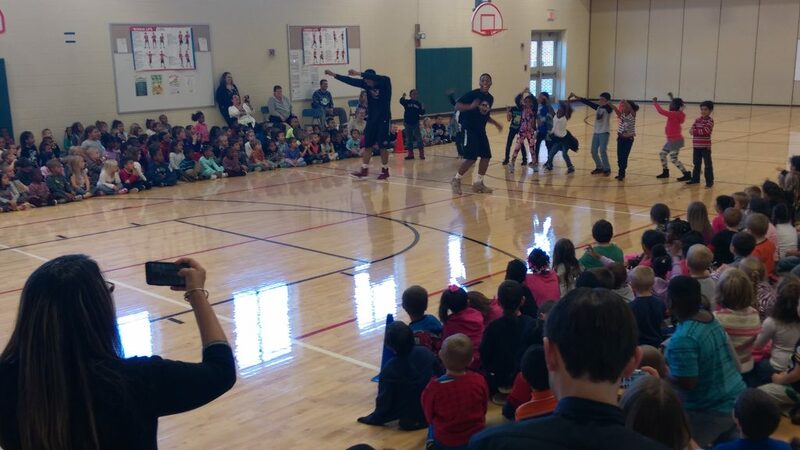 Alexander Wright Jr. (above) of the Harlem Ambassadors leads members of the crowd through a dance line, while doing a “selfie dab”. This was one of many times the game stopped for audience participation. 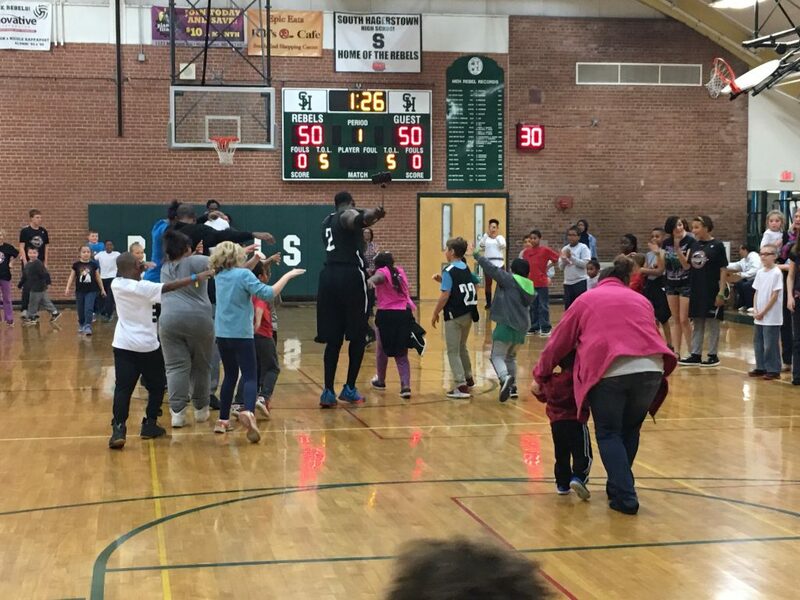 Not to worry, the Bester All-Stars held their own, tying the game 52-52! 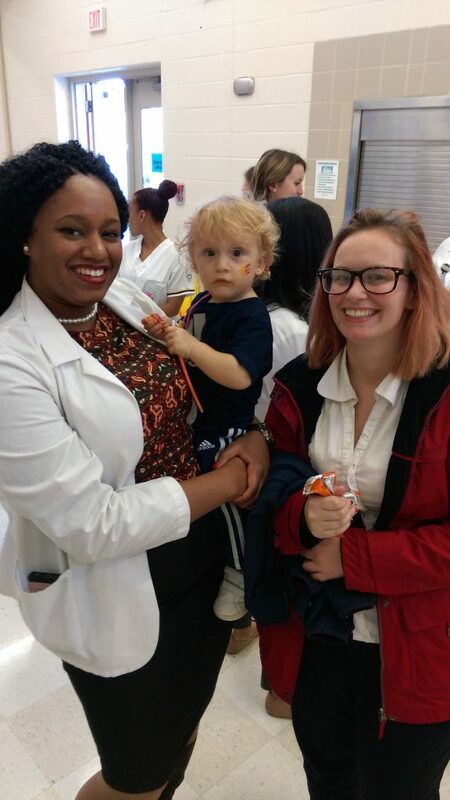 On October 22, 2016, close to 500 people filled Bester Elementary to celebrate young families at Babypalooza 2016! 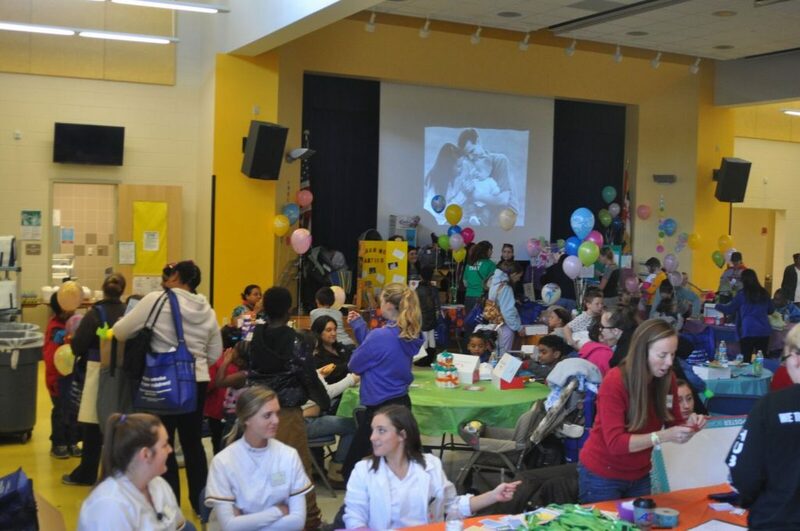 The event was planned by a committee comprised of staff from Bester Community of Hope, San Mar Children’s Home, Early Childhood Advisory Council, Washington County Health Department, Washington County Safe Kids, and Towson University with a focus on supporting and celebrating families while providing information on parenting, child development and family living. 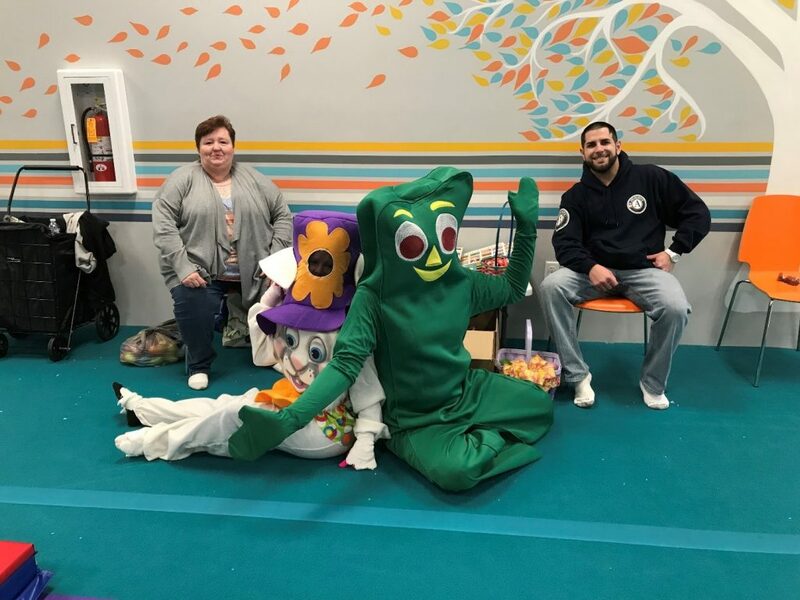 The event received additional financial and operating support from Casey Family Programs, the Washington County Health Department, the Washington County Department of Social Services and the Fletcher Foundation. 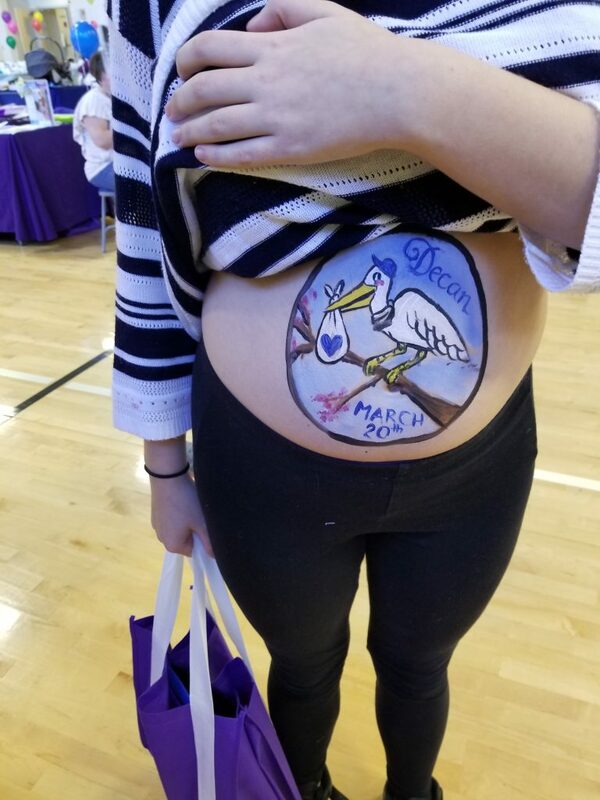 To add a little fun to the day, expectant mothers were able to have local artists paint fun themes on their pregnant bellies and capture the moment with Youngblood Studios for a pregnancy portrait. 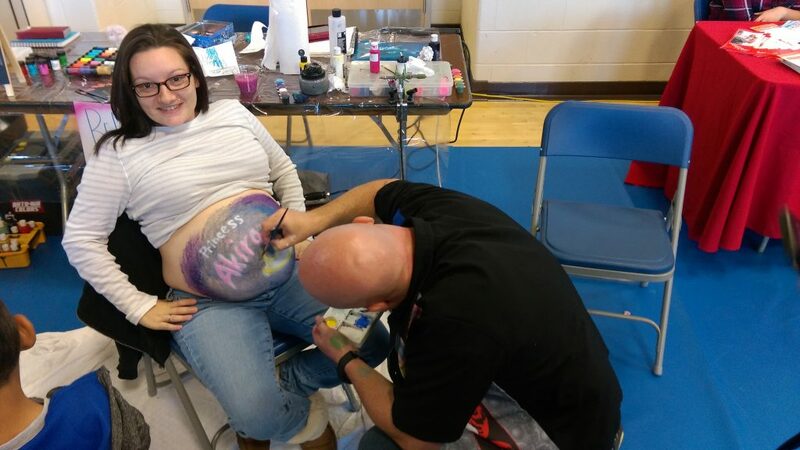 “This is so cool, I wanted to do something like this for my first pregnancy, but didn’t think anyone around here did it!” stated one pregnant mom who was overdue and had a “times up” them with the white rabbit from Alice in Wonderland airbrushed on her mid-section. Artists also brightened the day of children in attendance through face painting and some families were able to take fun photos with the photo booth. Jeff Ridgeway, children’s librarian, led story time throughout the day as well. 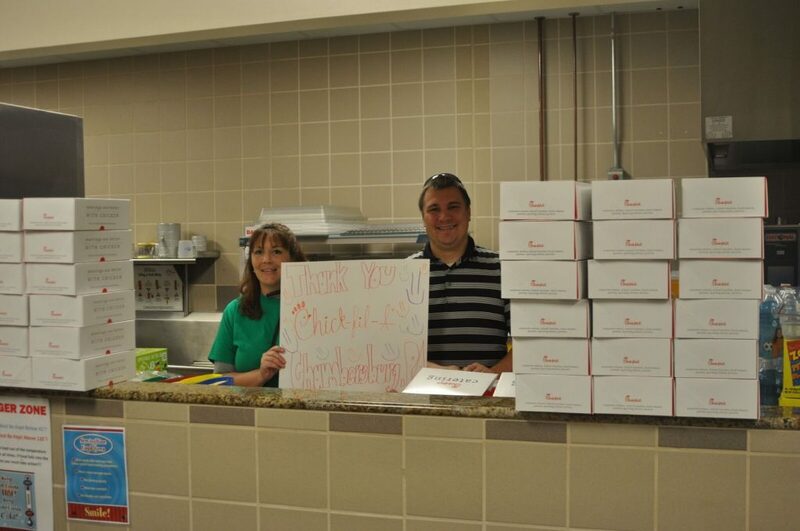 Adam Donius, manager of Chick-Fil-A in Chambersburg, and his crew graciously donated and served 300 boxed lunches to the crowd for lunch. 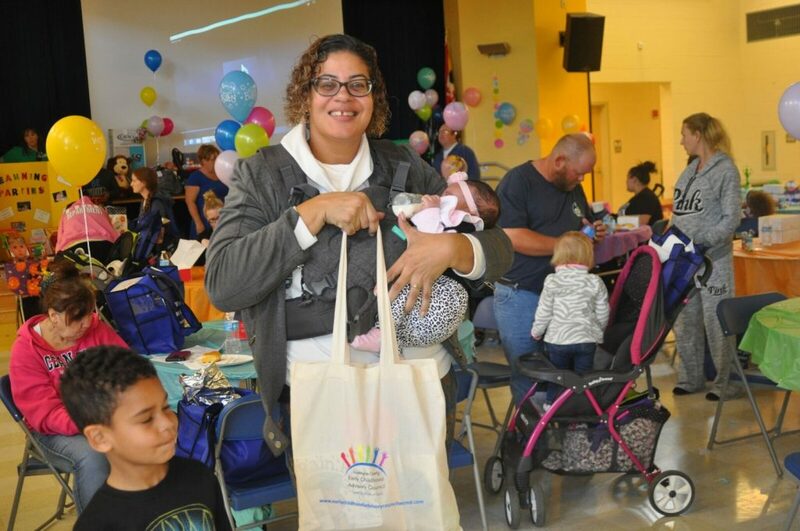 No one walked away empty handed as guests filled their bags with information on parenting, early learning, health and safety as well as complimentary items from a variety of vendors. 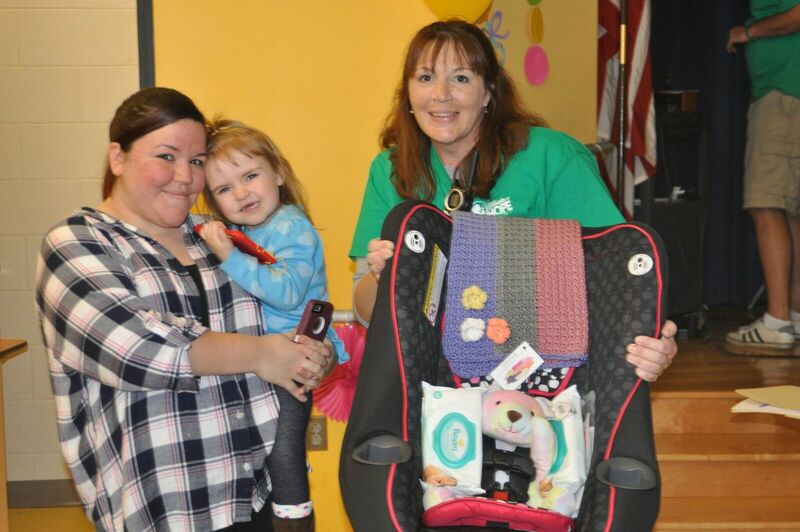 The Knitwits, a local crotcheting group, donated handmade baby blankets that were also given away for free. 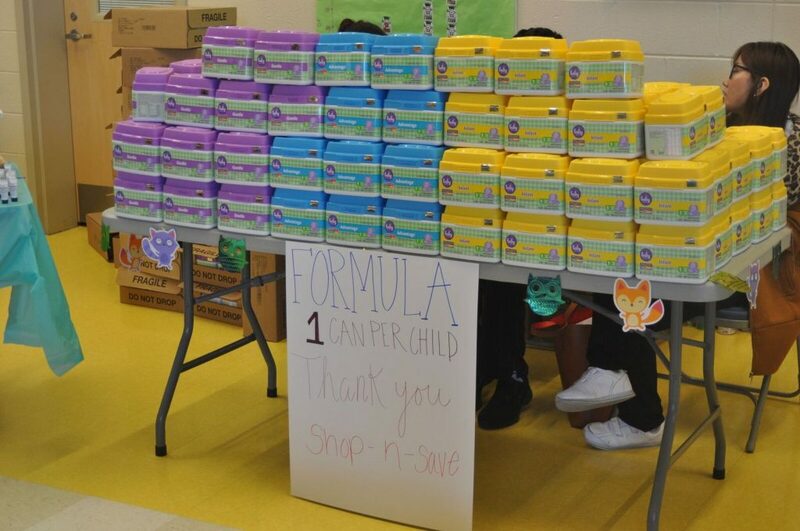 In addition, 64 cases of baby formula worth over $5,000 donated by Shop n Save was dispersed with the remaining cases benefiting the food pantry at South Hagerstown High School. 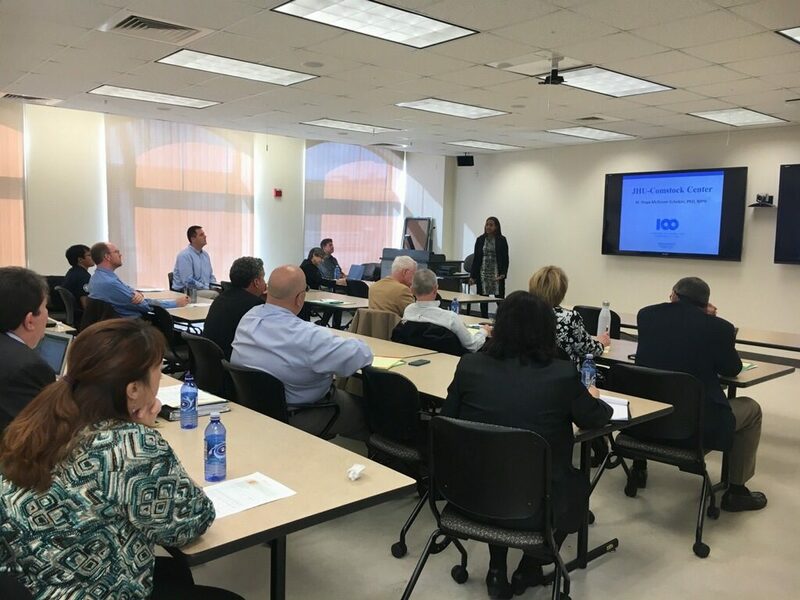 Guests connected with local providers, gained valuable information, and had the opportunity to learn about services and supports available. Providers and services present at the event included Washington County Safe Kids, Poison Control, Birth – 5, S.T.E.P.S, Healthy Families Washington County, Dad’s Connection, Washington County Family Center, Kaplan University, Meritus Health, Washington County Health Department, Towson University, Priority Partners, Simply 4 Kidz, Community Free Clinic, Family Healthcare, Southside Pediatrics, Hagerstown Pediatrics, Partners in Pediatrics, Washington County Free Library, Emmanuel United Methodist Church, Department of Social Services, MD EXCELS, Head Start of Washington County, Professional Childcare Association of Washington County, Gateway Early Learning Center, Bright Eyes Early Learning Center, Kids First Swim, CASA, Mental Health Association of MD, Youngblood Studios, Lesley Whalley and fellow artists, Zero to Three, Early Childhood Advisory Council and The HUB at USMH. Attendees who collected stamps from at least 20 vendors were eligible to win one of five grand prizes which included a travel system donated by Bester Community of Hope, car seat donated by Safe Kids Washington County, Pack n Play donated by Rural Children’s Fund, birthday party package donated by Discovery Station and a Thirty-One loaded diaper bag donated by Holly Luther and friends. Also, every attendee was entered into a door prize drawing where awards were made every 10 minutes including board books donated by The HUB at USMH and Washington County Free Library, three baby supply baskets donated by Meritus Health, a snack basket and flowers donated by Emmanuel United Methodist Church, and an Inside/Out movie and guide donated by Simply 4 Kidz, Baby Wellness Basket donated by Priority Partners, Toy Basket donated by South side Pediatrics, Baby Basket and Massage donated by Bodyworks Massage Center and Gift & Wellness Shop, two baby baskets donated by Hagerstown Area Pregnancy Center, several giant teddy bears donated by Valerie Zehringer and a baby basket donated by Professional Childcare Association. 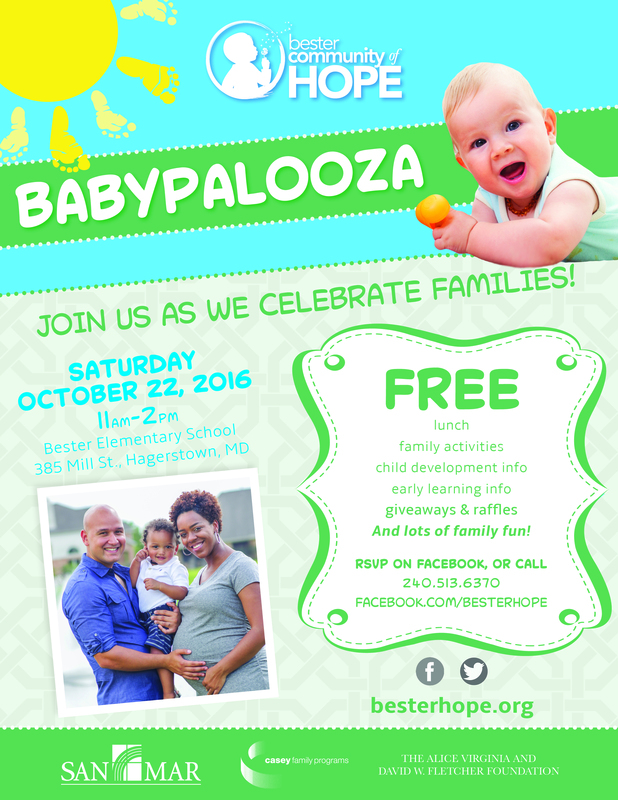 Babypalooza is coming to Bester Elementary School on Saturday, Oct. 22, and Kerry Fair said she anticipates the event will be a success. “This is the first one we’ve had, but we’re hoping to make it an annual event,” she said. 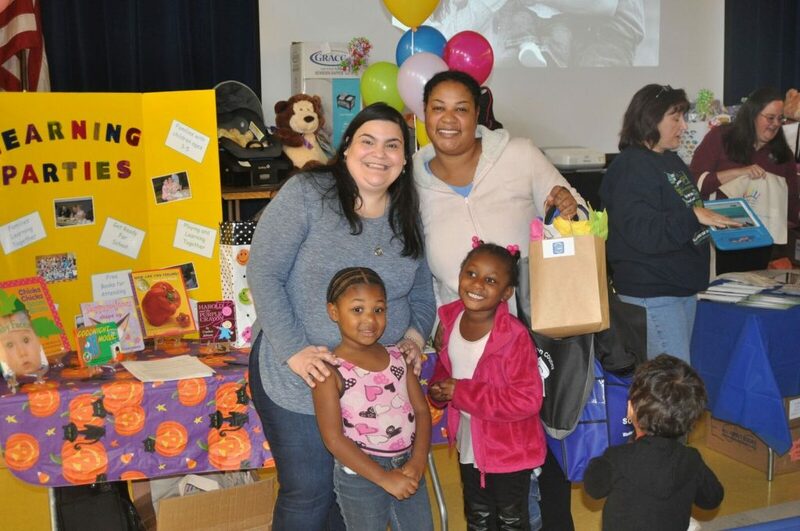 Fair is program manager for Bester Community of Hope, a relatively new initiative based at San Mar that works on positive outcomes for children and families in the Bester Elementary School neighborhood. 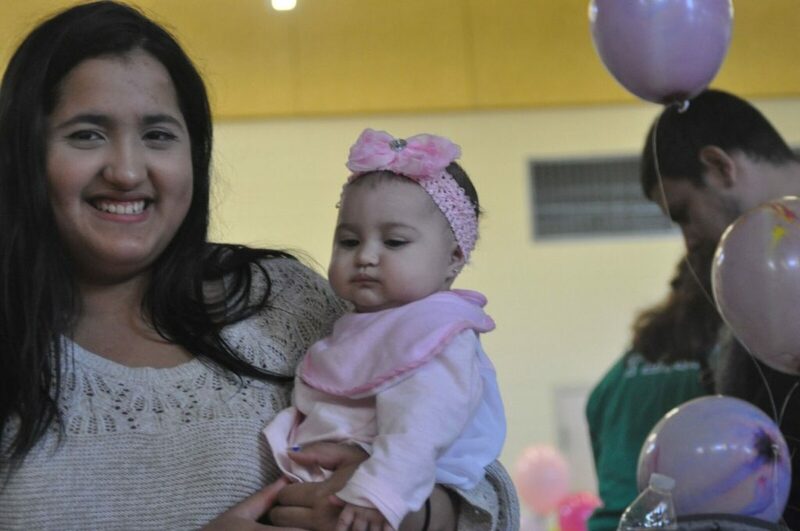 Saturday’s Babypalooza runs from 10 a.m. to 2 p.m. and is geared mostly toward expectant families, but also will provide plenty of activities for those with young children, Fair said. 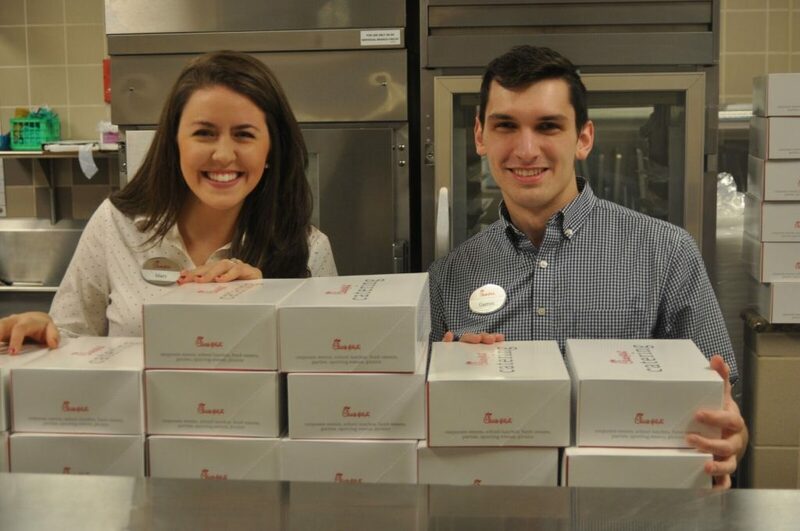 Admission and all activities are free, including 300 lunches donated by Chick-fil-A. 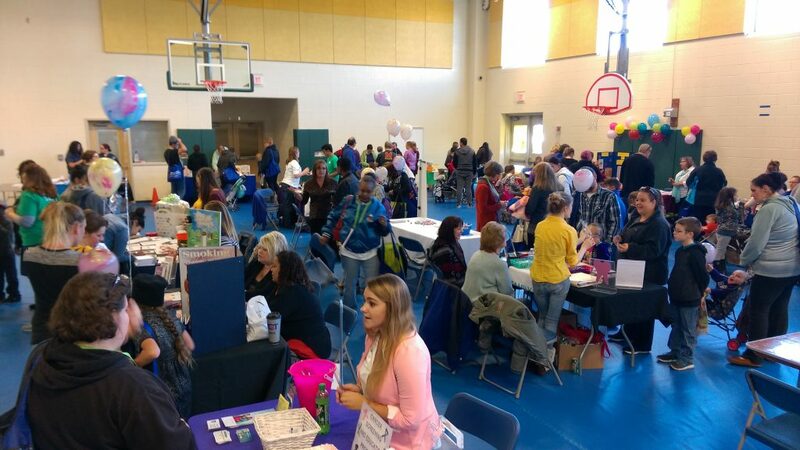 A slew of vendors will be on hand with information on topics such as safe sleeping, secondhand smoke, early literacy skills, swimming lessons, shaken-baby prevention, pediatric dental and overall health, and massage. 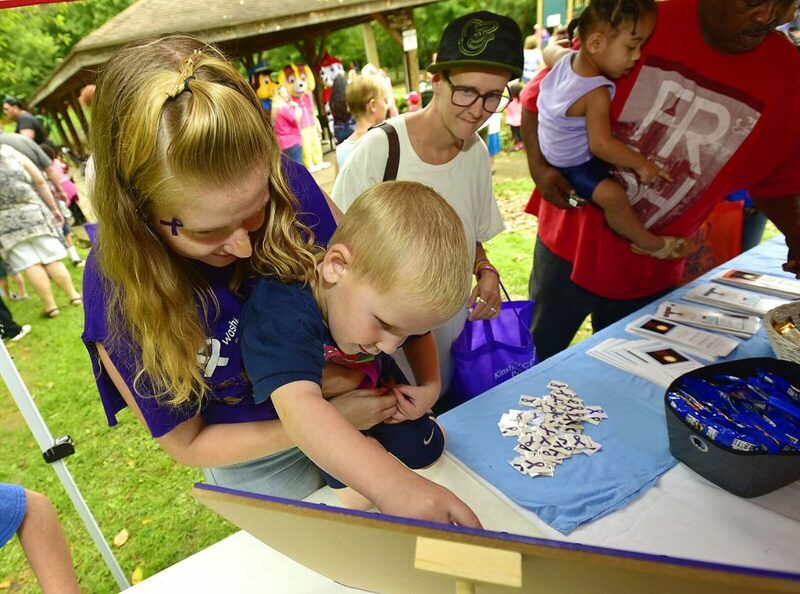 To keep the mood light, local artists will provide prenatal belly painting for expectant moms, and a photographer will offer free family photographs. Those who attend also can register for door prizes, including a formula giveaway sponsored by Shop ‘n Save. Other door prizes include a portable playpen courtesy of Rural Children’s Fund; birthday party package donated by Discovery Station; a basket and massage donated by Bodyworks Massage Center; and a Mommy and Me swim time provided by Kids First Swim. 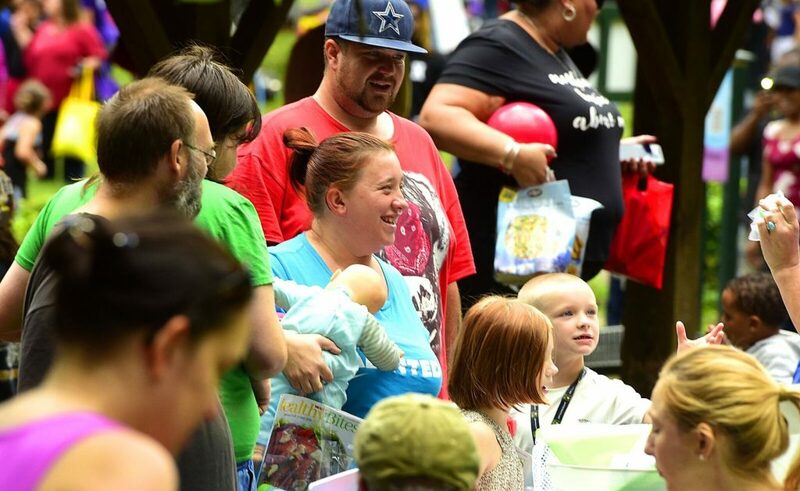 Fair said Babypalooza events are popular in other areas. 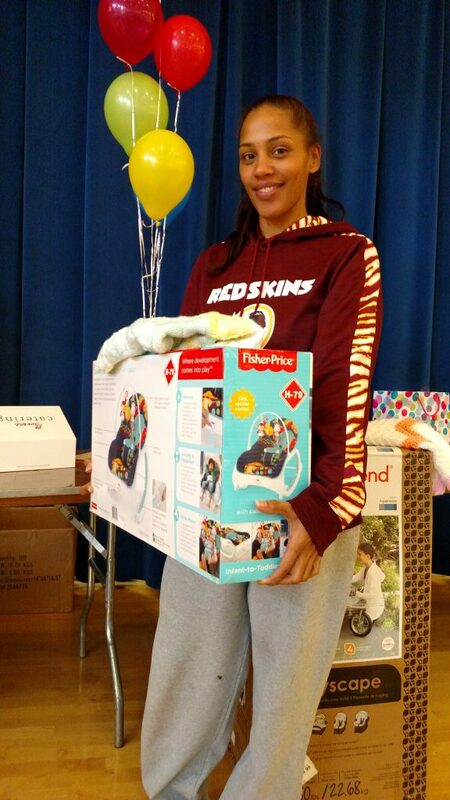 She said many community baby showers have been held in the area, but not a lot of people attended. 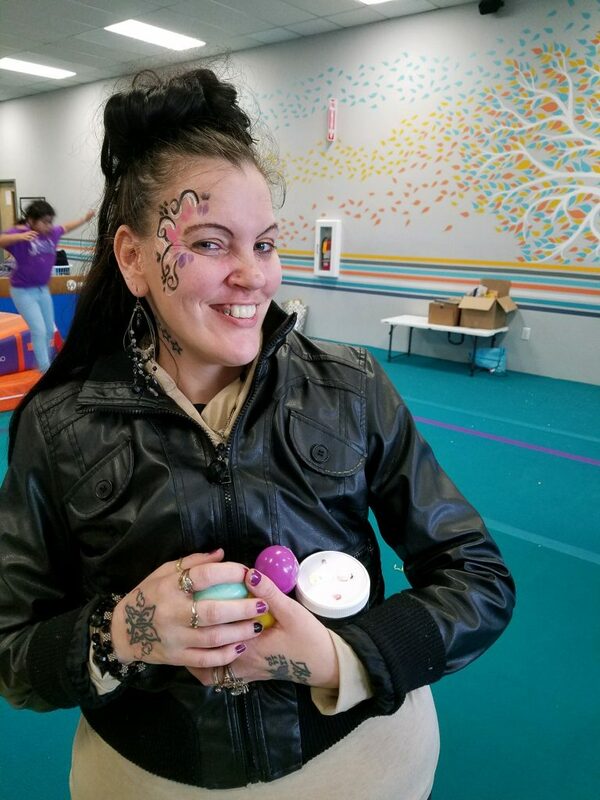 She said she hopes Babypalooza will attract more families. Maryland Gov. Larry Hogan talked to about 90 Hagerstown fourth-graders Thursday about working hard and persevering — and how he did that to both become governor and beat cancer. Hogan told the children at Bester Elementary School that they will encounter hard times in life and unplanned things will happen, but if they work and study hard, they can make just about anything happen. 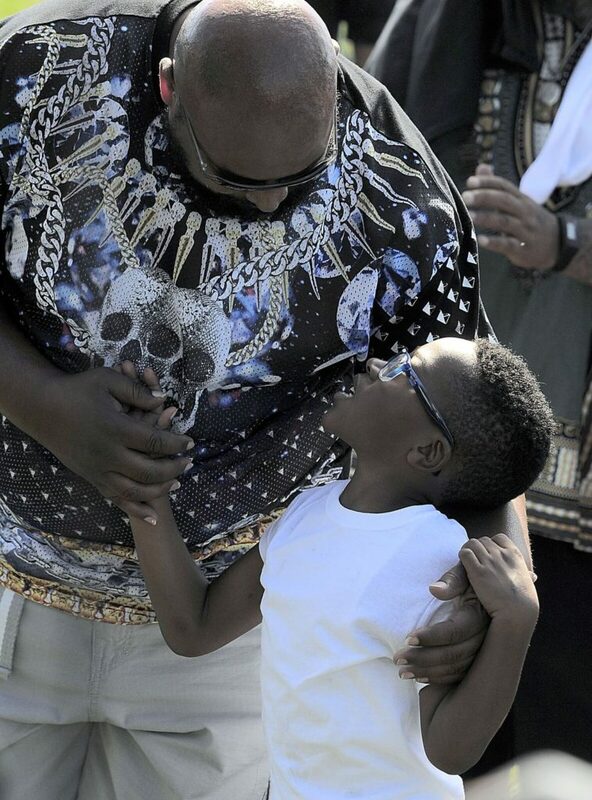 “I know you’re all going to grow up to succeed and do great things,” he said. Hogan was invited to the South End school by the Bester Community of Hope, a San Mar Children’s Home initiative that is working with community organizations to create positive outcomes for the school community. San Mar chose that community, in part, because of overlapping social needs and neighborhood momentum when the school opened in August 2014. 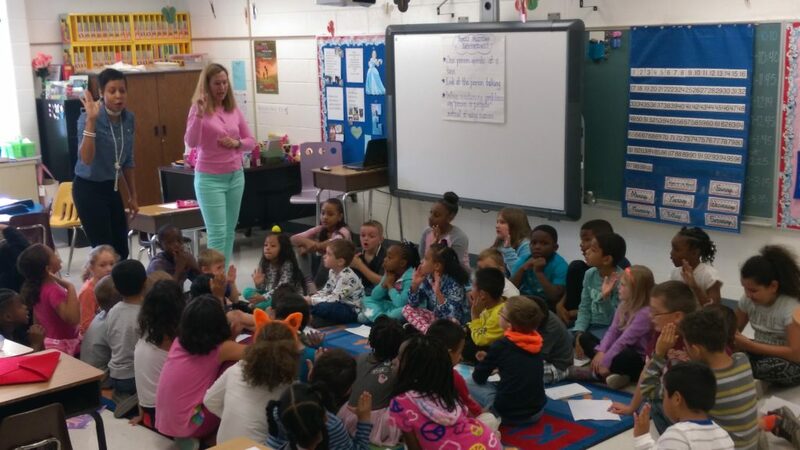 Hogan and state Schools Superintendent Karen Salmon visited Jennifer Babb’s second-grade class. 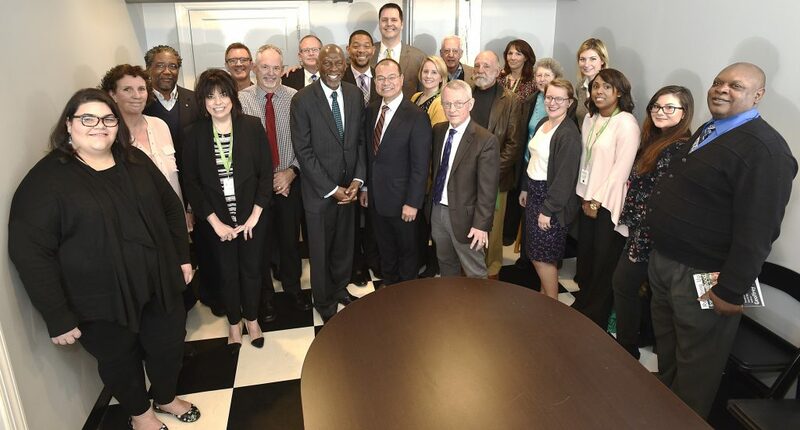 But the focus of his visit was the OnTrack program, a group effort with 33 active community partners committed to improving educational attainment for residents. The program is about “learning today and succeeding tomorrow,” Hogan told children and adults in the school’s cafeteria. AT&T Maryland President Denis Dunn presented a ceremonial check for $25,000 to the Hagerstown-Washington County Chamber of Commerce Foundation for the program. Dunn said AT&T was eager to get involved early on with OnTrack, whose goal is to promote education and skills development so people can compete for good jobs. Economic development and community strength are tied directly to educational attainment, he said. 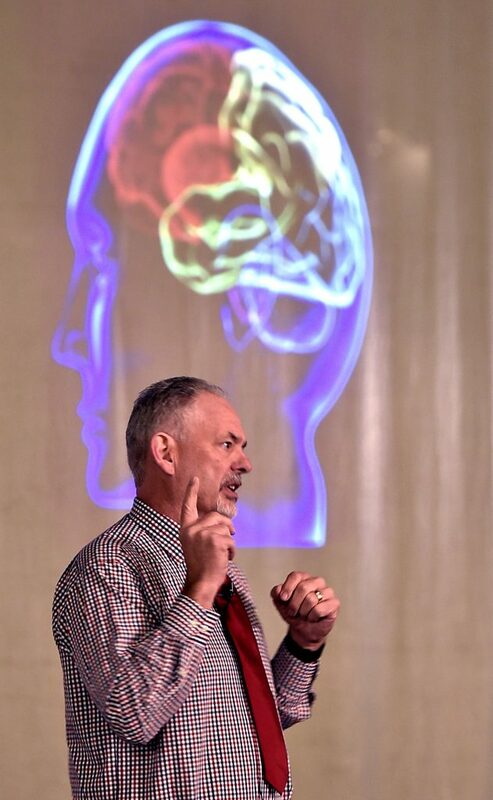 Chamber President Paul Frey told students he had fifth-grade classmates who grew up to become a heart doctor, a dentist, a comic-book artist, a member of the military, owner of a computer company, a woodworker and a math teacher. Just like the theme of the song the fourth-graders sang to Hogan in the cafeteria, there are possibilities in life, Frey told the students. 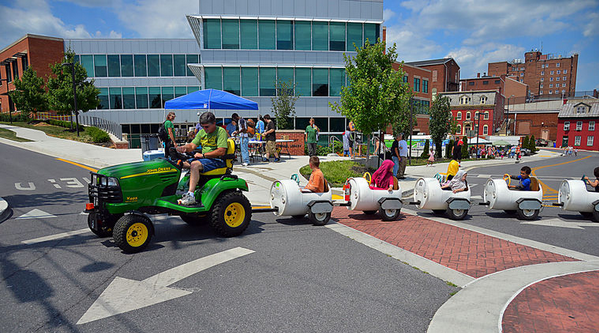 The Greater Hagerstown Committee began the local OnTrack initiative with Executive Director James Kercheval running things initially, but the chamber has agreed to be OnTrack’s host agency for three years, Kercheval said. The money AT&T donated will help pay for a director for OnTrack, he said. OnTrack partners spent the past year starting to compile data to track and identify challenges partnering organizations can help address, Kercheval said. 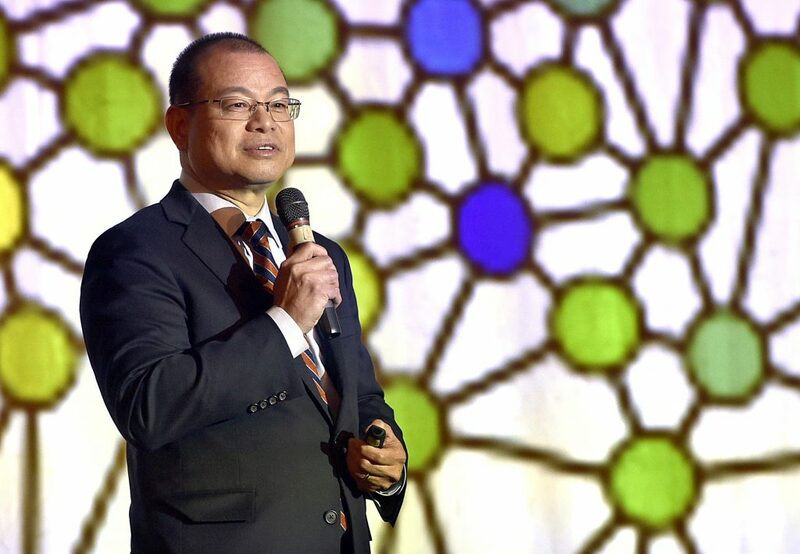 One possible goal is to better educate the public about the importance of early childhood education, and what skills children should develop by a certain age, he said. 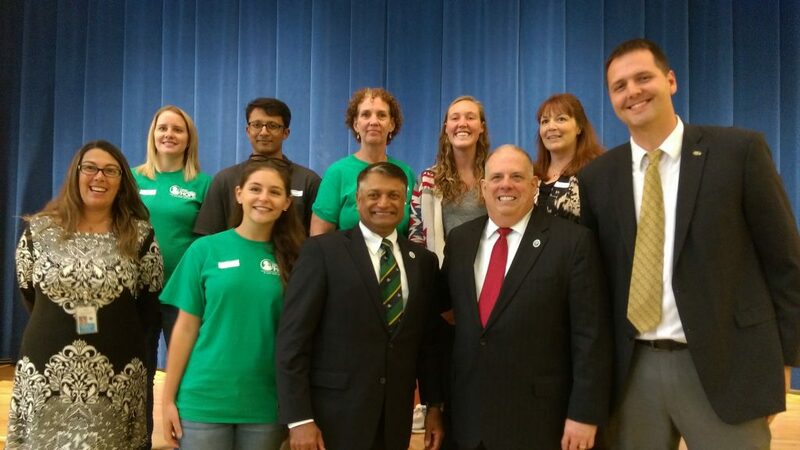 Maryland Department of Human Resources Secretary Samuel Malhotra and Governor Larry Hogan join most of the Bester Community of Hope team today for a wonderful event celebrating the future of this community’s children. Possibilities! 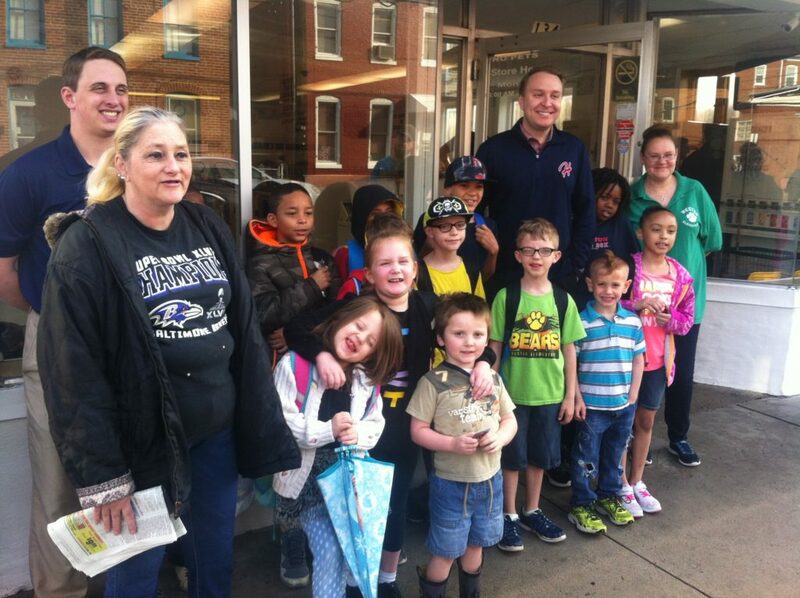 Bester Elementary School students in Hagerstown are receiving free acute health care services from the Community Free Clinic, while social services is funding a program to help families in that school district address unemployment and the need for food. 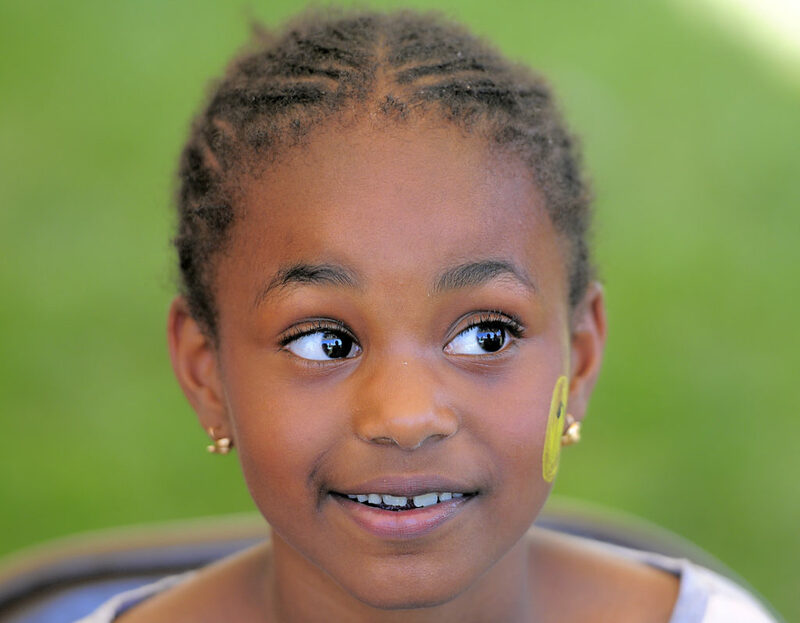 Both programs are the result of the Bester Community of Hope, a San Mar Children’s Home initiative whose goals include improving the well-being of students there, as well as improving the community overall. 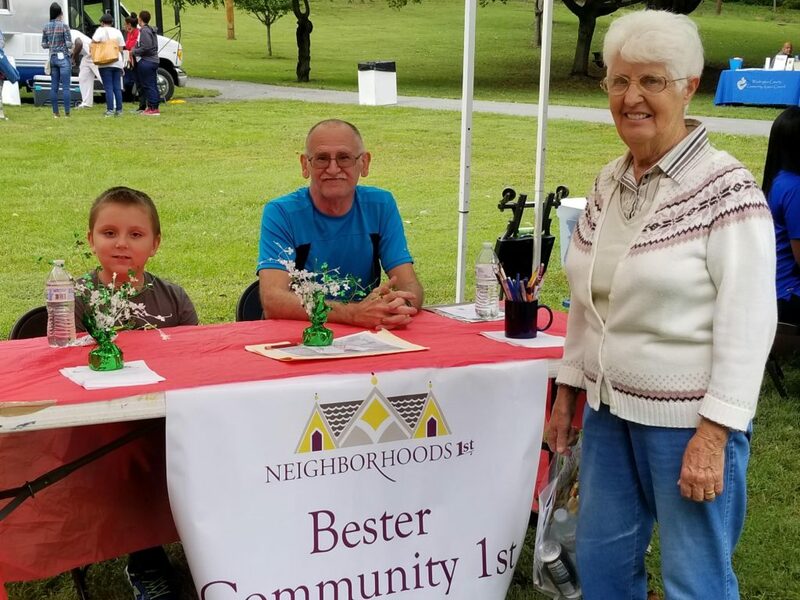 The Bester Community of Hope is an umbrella organization for neighborhood support that works with existing organizations to try to “fill gaps” and create better and positive outcomes for the community, group Director Keith Fanjoy said. 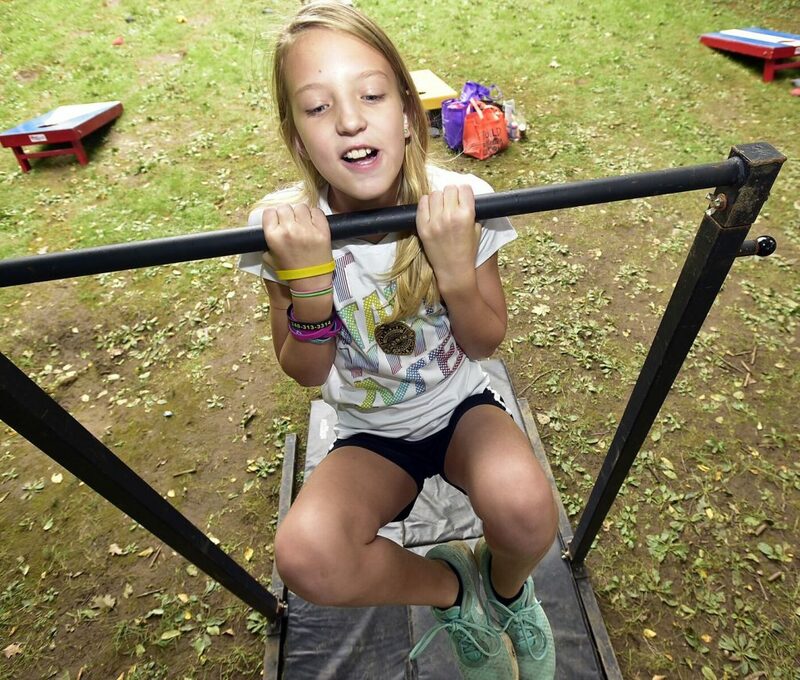 The overarching goal is “stronger families build stronger communities,” Fanjoy said. Gov. Larry Hogan will be visiting Bester Elementary on Thursday at the invitation of the Bester Community of Hope, he said. After learning the governor was going to visit Rose Hill Cemetery across the street from the school, initiative officials invited the governor to meet with students at the school in the city’s South End. 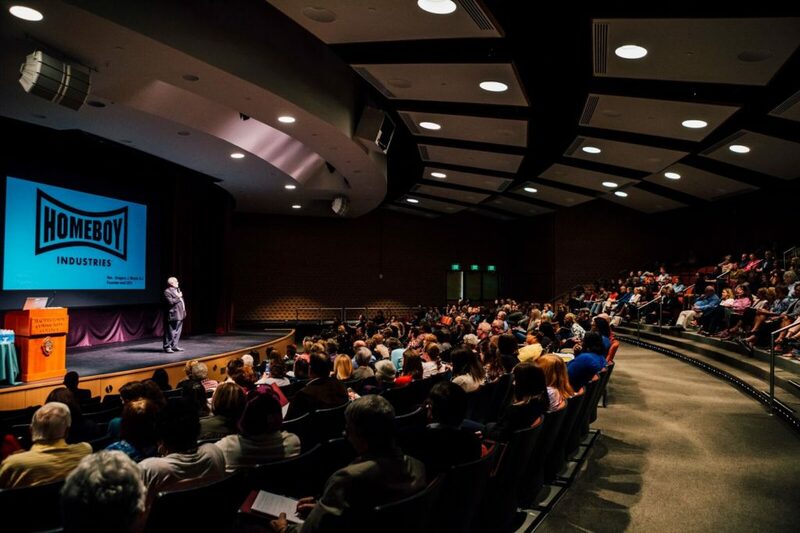 The Bester community was chosen for the initiative based on its overlapping social needs, neighborhood momentum that saw a new school open in August 2014 and other strengths, Fanjoy said. Mike Piercy, director of the Washington County Department of Social Services, said social services officials are excited about the San Mar initiative. “It’s putting children and families first, which is what we want. 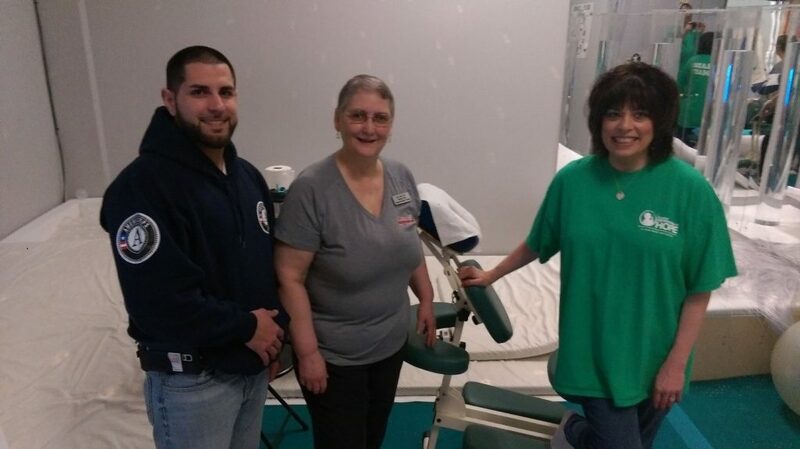 And it’s addressing prevention in the community,” Piercy said. 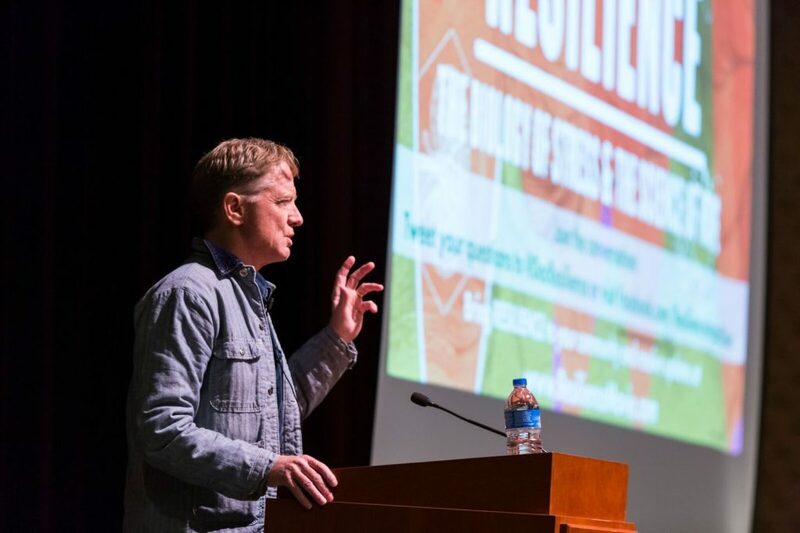 The initiative’s work is strengthening families, the home environment and home communities so “problems don’t become disasters” and that is “a win-win for everybody,” he said. 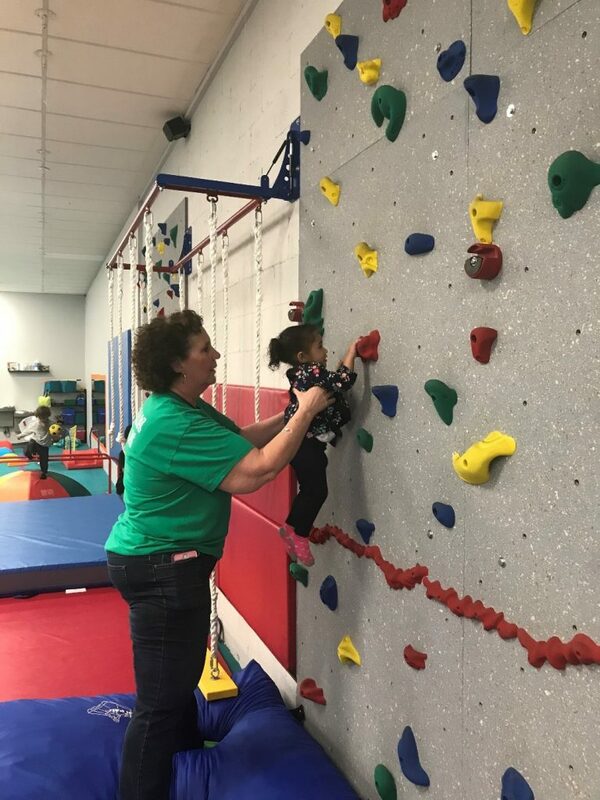 The local social services department recently provided $303,455.80 in federal funds to the initiative, spread over two fiscal years, to fund the STEPS program, which stands for Strengthening Ties and Empowering Parents, Fanjoy said. STEPS get referrals from Bester Elementary, the social services department and houses of faith within the school district to meet and work with families to determine what support services they need, said Jen Younker, program director and a licensed clinical social worker. Since that program began in late August, it has averaged working with six families a week, she said. Among the assistance families might need are help with employment; access to a food bank including transportation; and connecting families with youth program opportunities such as scouting groups, she said. 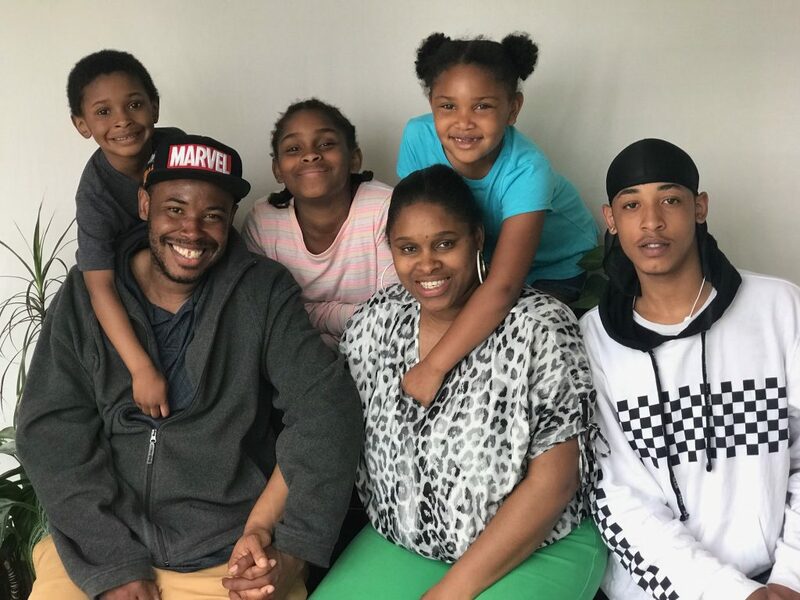 The Hope initiative has gotten key support from Casey Family Programs, a Seattle-based national foundation aiming to reduce the need to put children in foster care, and the local Alice Virginia and David W. Fletcher Foundation. The Fletcher Foundation helped the initiative get started with $222,000 in its first year, and has renewed its financial support with $273,000 for 16 months from Sept. 1 to Dec. 31, 2017, Fanjoy said. An agreement between San Mar, the school system, the Community Free Clinic and Meritus, which runs the school system’s school health program, has resulted in a new program that allows clinic officials to deliver “free acute care services” for all Bester students and to do that at the school, Fanjoy said. The clinic work at Bester began Sept. 6, he said. 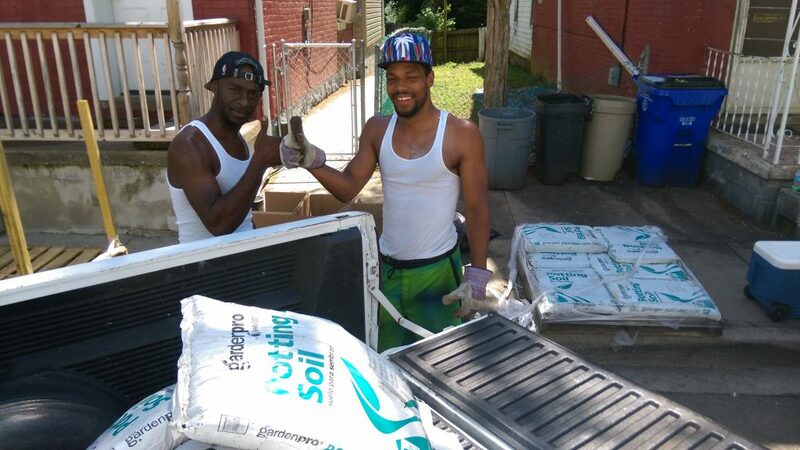 The Hope initiative also collaborated with the YMCA to provide extra manpower for its summer program at Bester. 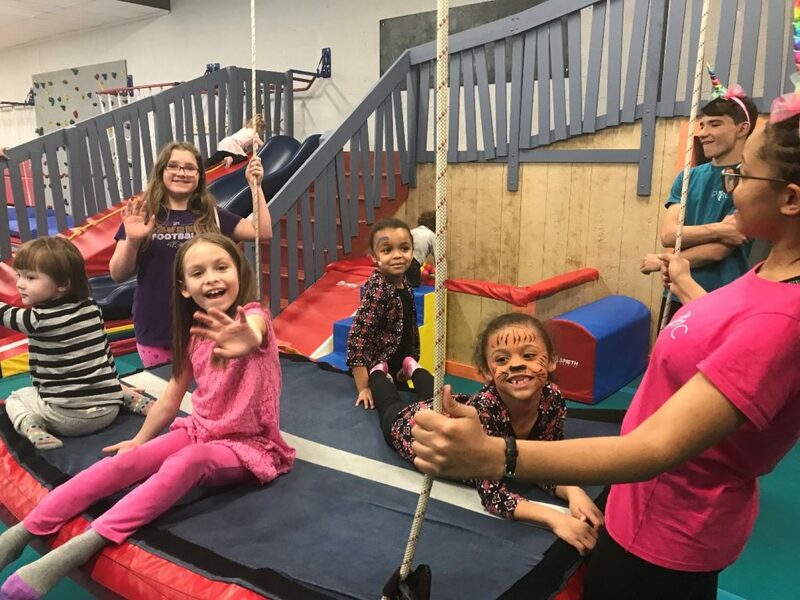 Starting Oct. 24, the Y’s after-school program at Bester will be supplemented with free services through other organizations that are for all of the school’s students, Fanjoy said. 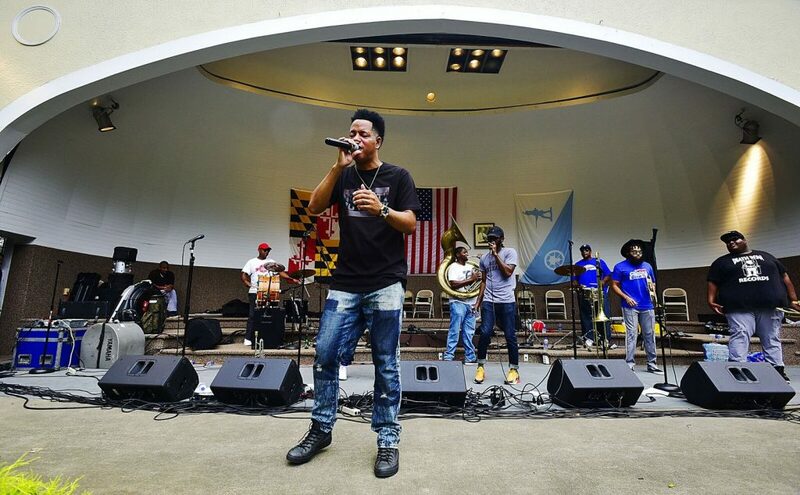 Those services for the Bester Out of School Time, or BOOST program, include having the Washington County Community Mediation Center start a weekly kids council and having Fresh Academicz, a local breakdancing and hip-hop group, provide a weekly class, Fanjoy said. 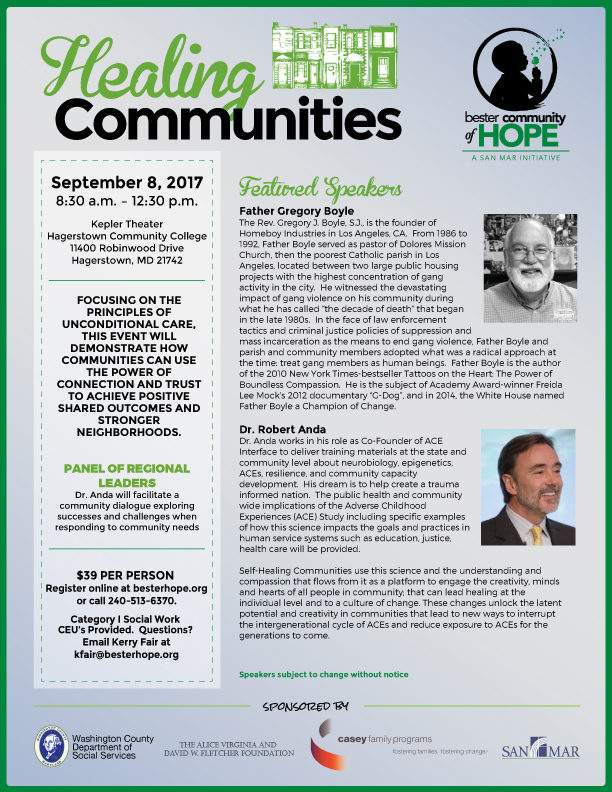 Community of Hope also is working with the Hagerstown Area Religious Council and 16 houses of faith in the school district. 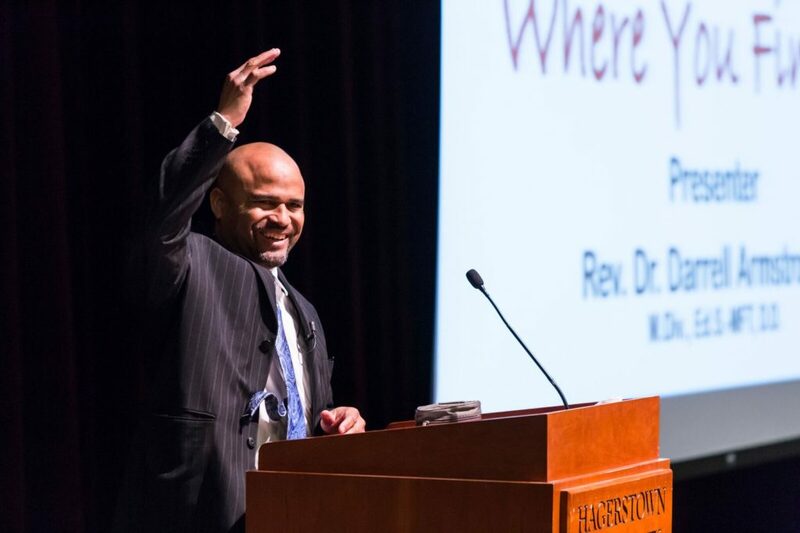 One goal is to improve communication among the houses of worship so that as they continue to help the community they aren’t duplicating their efforts, he said. 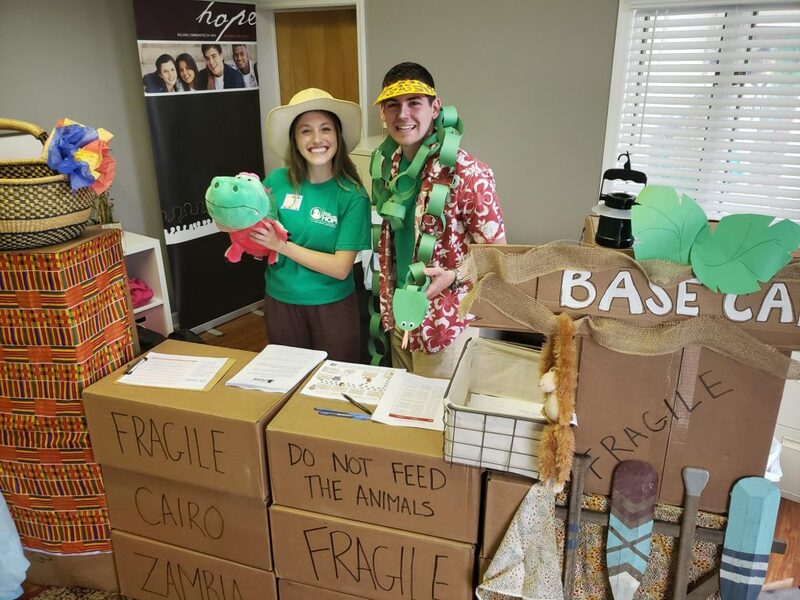 The Community of Hope focuses on building connections and relationships so more can be done as a collective group, Fanjoy said. 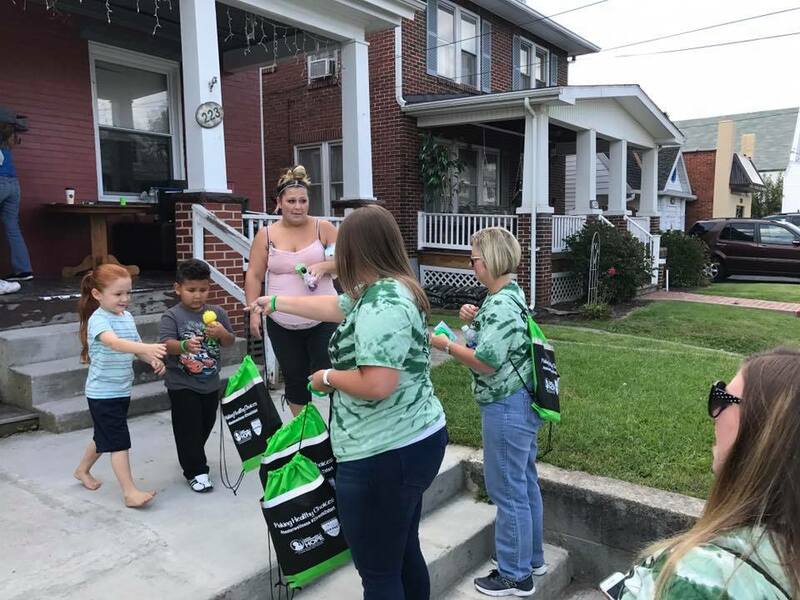 On Monday, Hope personnel were going door-to-door, surveying residents about their perceptions of the quality of life and listening to what the Hope initiative could do to make a positive impact, Program Manager Kerry Fair said. Hope personnel also went door-to-door on Sunday in the area of Locust and Frederick streets, with representatives from Congregation B’nai Abraham and the Washington County chapter of the NAACP to help local residents complete voter registration and make sure they knew their polling place, officials said. Are you registered to vote and know your polling site? 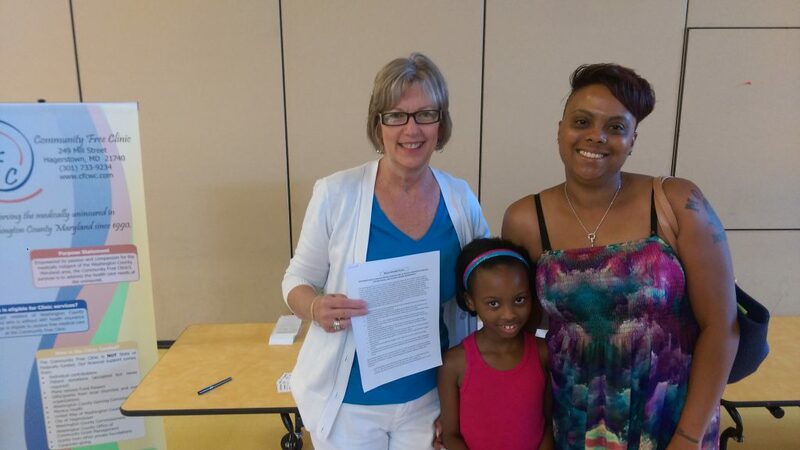 Bester Community Of Hope , Bnai Abraham Synagogue and the NAACP Washington County Maryland, along with local volunteers, will be working together to help local residents register so they can participate in the upcoming election. Already registered? Stop by and volunteer with the effort tomorrow at 12 p.m. on the corner of Potomac and Memorial Street. 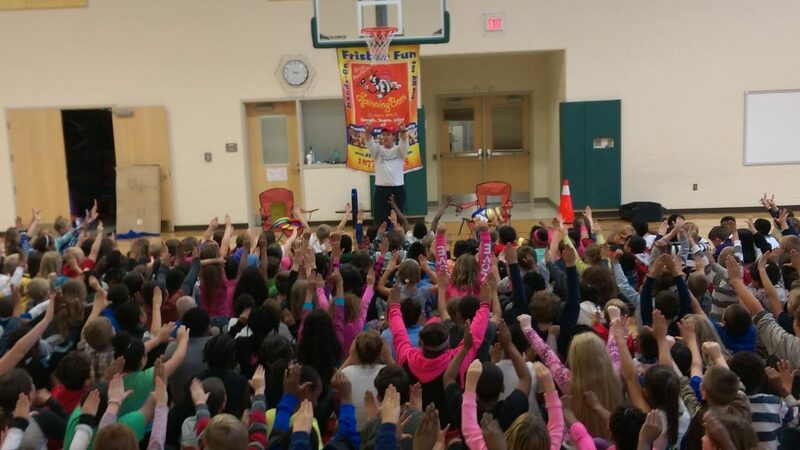 Every student at Bester was treated to an ice cream sundae and enjoyed the performance of World Champion “Frisbee Guy” Gary Auerbach. 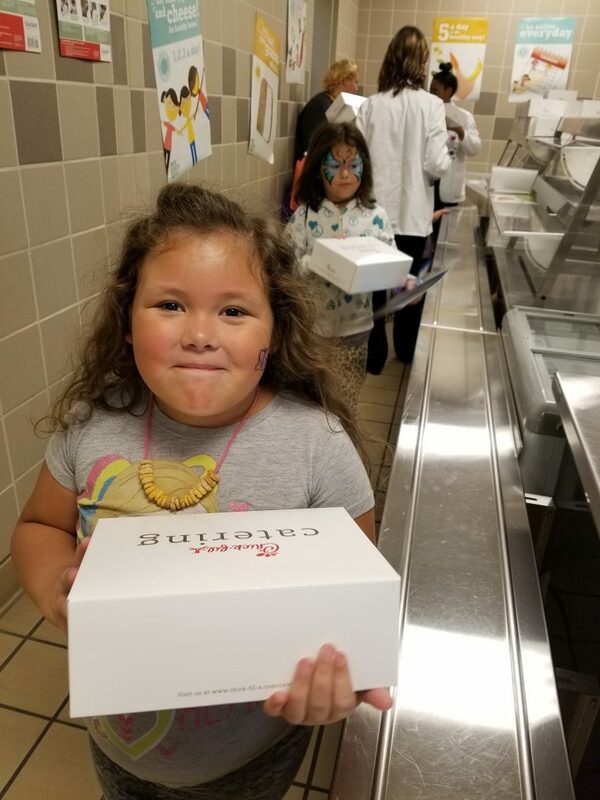 Our hope is to encourage positive behaviors and good attendance within the school day by offering ongoing rewards to students who put forth the necessary effort. Today’s event was open to every student! 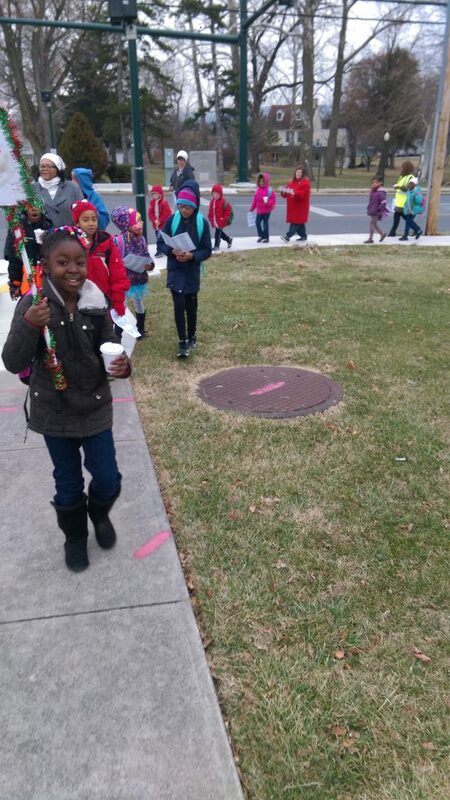 Over the long term, we believe kids can move towards more intrinsic rewards as a part of a caring Bester community. Choose Kind! Join us as we celebrate families! Saturday October 22, 2016 11a.m. 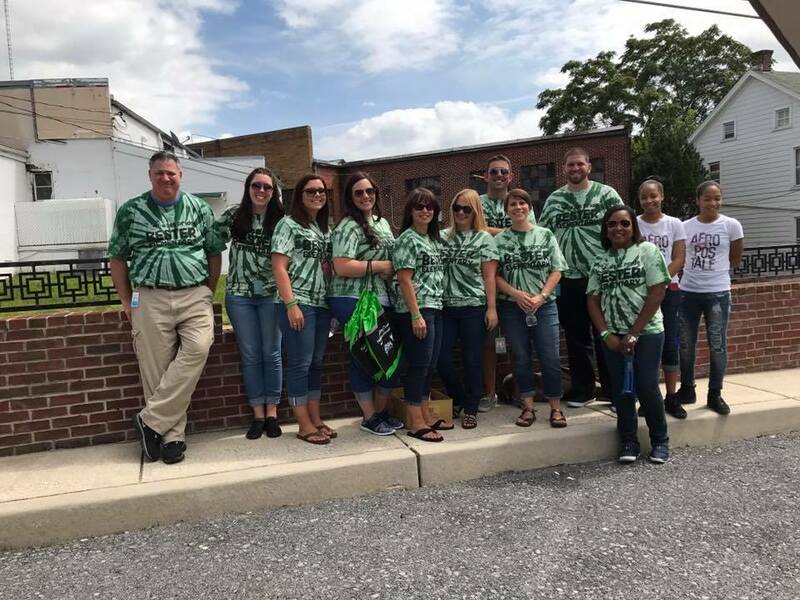 – 2 p.m.
Our sincere thanks to Jim Schultheis of M&T Bank (VP/GM of the Boonsboro branch) and the M&T Charitable foundation for supporting our year long health efforts in the Bester community. 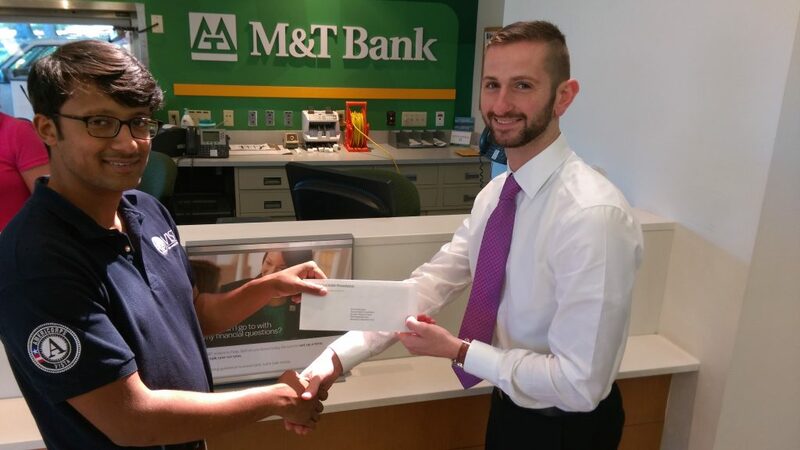 The newest member of our team, Rafi Hoq (pictured left) is seen here accepting a check today for $2,500 to support the effort from Banking Officer Joe Werling. 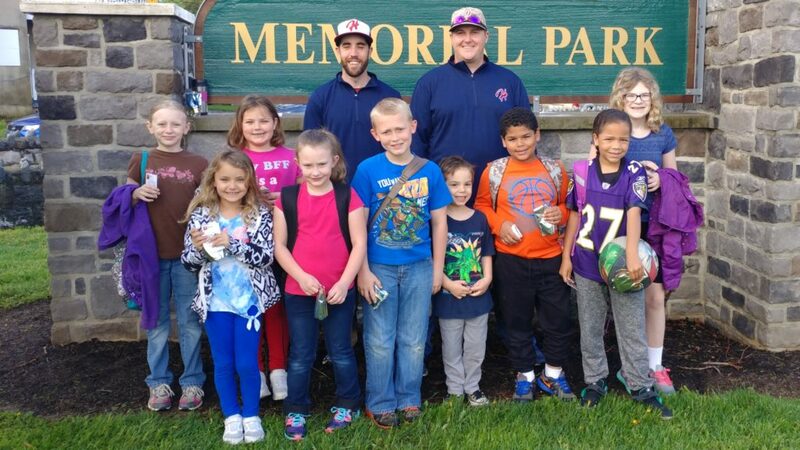 Community partners like M&T Bank make all the difference! Today the BCOH crew partnered with Paul Ostoich of HubNetwork to continue to listen to the strategies being used in the faith community and how we can best adapt those practices to serve families in our region. 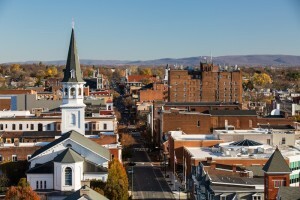 Building on a HubNetwork event last week in Hagerstown focused on successful social service delivery practices seen in other houses of faith, we continued a deeper conversation about process and lessons learned with Lillie Ostoich and Ken Melloni today in Philadelphia. We are looking forward to partnering with families in need, including those affiliated with the network of churches in the Bester catchment, through our Strengthening Ties and Empowering Parents (STEPS) program starting at the end of this month! 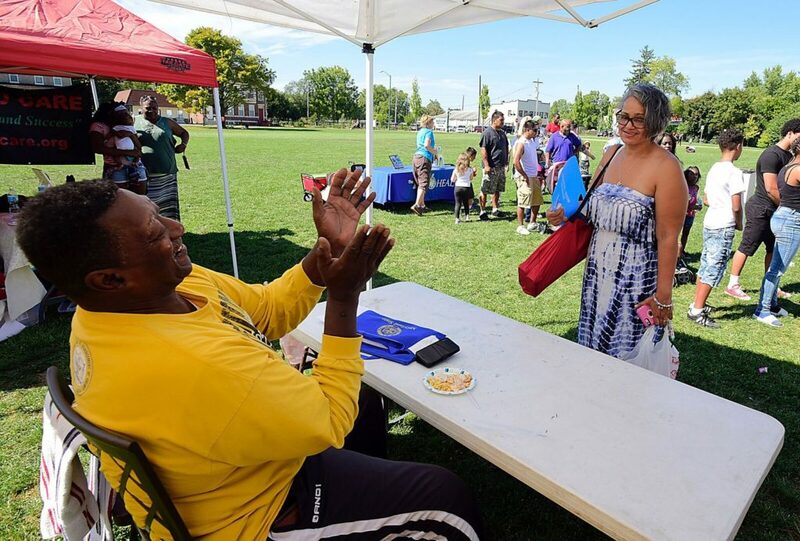 Hundreds of parents and children gathered outside Bester Elementary School on Saturday for an afternoon of entertainment, getting to know one another, and learning about resources that can help strengthen their community. “It’s a great community. 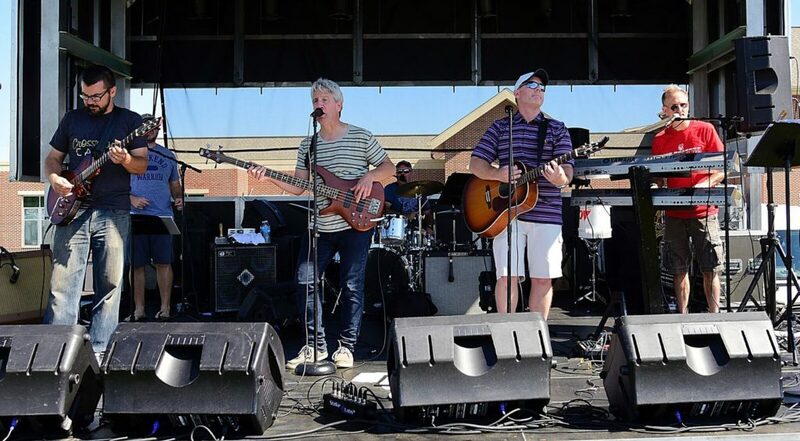 Sometimes people don’t look at it that way, and we want to highlight all the great strengths that exist here,” said Keith Fanjoy, the director of Bester Community of Hope, sponsor of the block party. 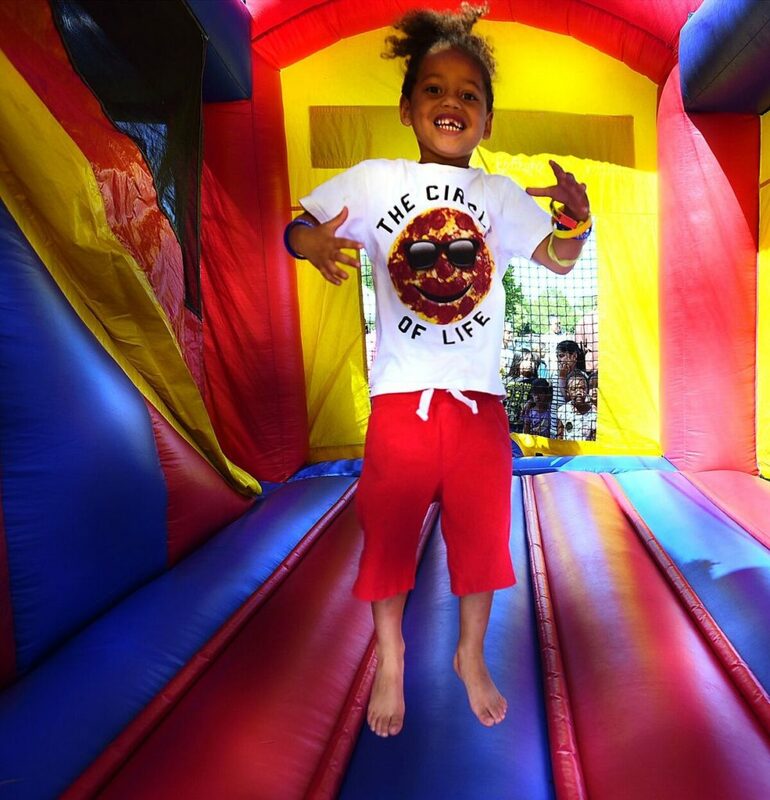 The Bester Community of Hope was formed last year, but Fanjoy said the group wants the block party to become an annual event. The party, he said, served a couple of purposes. South End Neighborhoods 1st has much the same goals, said the group’s president, Melanie Pepple. “We’re working to build stronger communities where we all feel like neighbors again,” Pepple said. 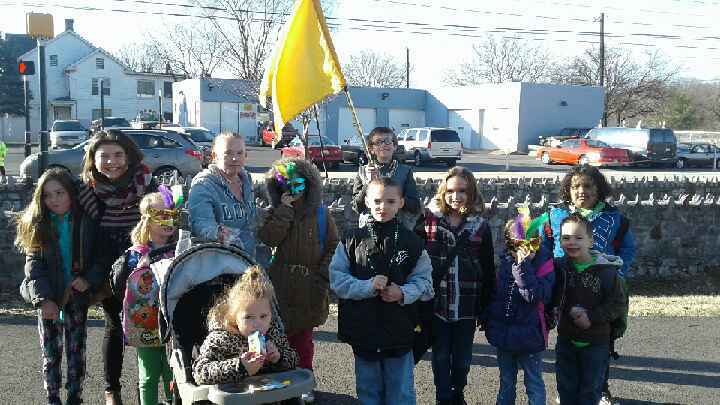 The group hopes is trying to re-establish some old traditions, such as Christmas caroling and Halloween events, and holding its own block parties, she said. Also available to the residents was information about resources they can access to help their families, Fanjoy said. 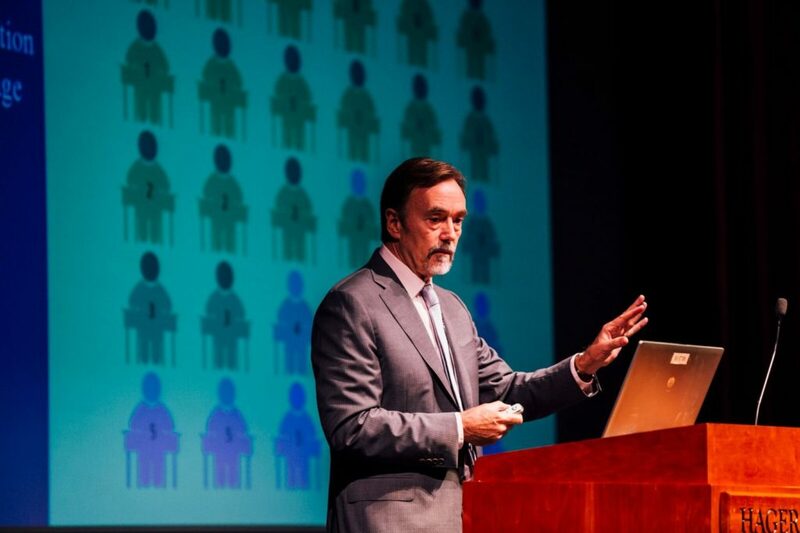 Potomac Case Management works with about 500 adults and 300 or more children and adolescents in the county, helping them get proper diagnoses and treatment, Stouffer said. 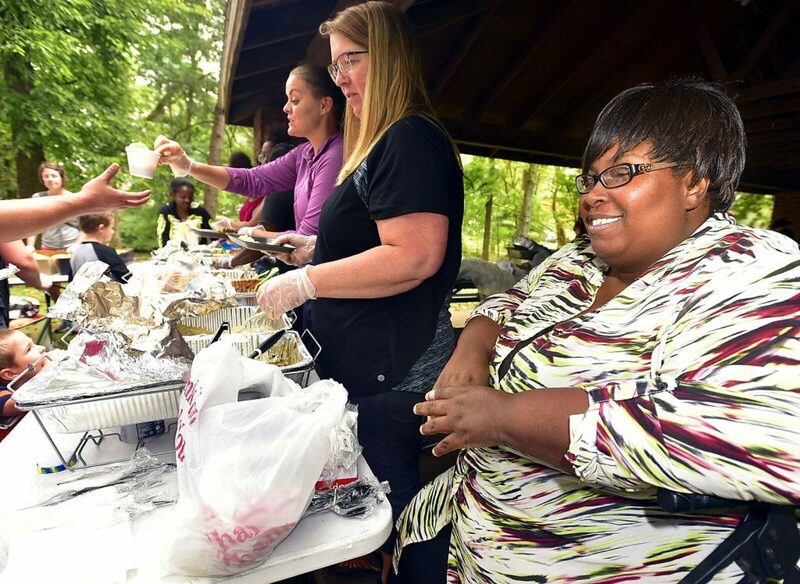 “In my program … we see about 400 people a year,” said Carrie Tressler, the homeless outreach manager for Turning Point, speaking of another challenge many communities face. The program deals mostly with individuals, but homeless families can be more difficult to track, she said. 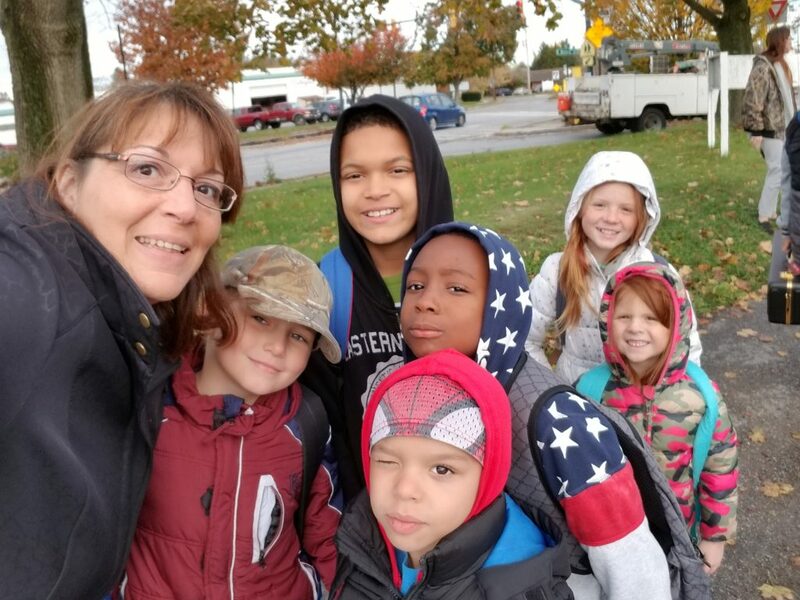 Helping homeless families with an emphasis on their children is the job of Dana Pentoney, the homeless education program coordinator for Washington County Public Schools. Last year, there were 712 homeless students in the county, she said. 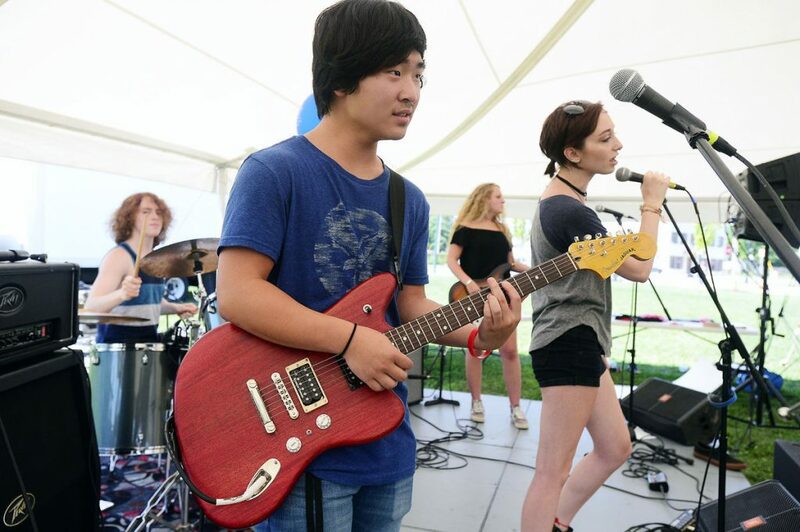 “Our main goal is to remove any barriers to them getting an education,” Pentoney said. That assistance takes many forms, including school supplies and transportation to their school. 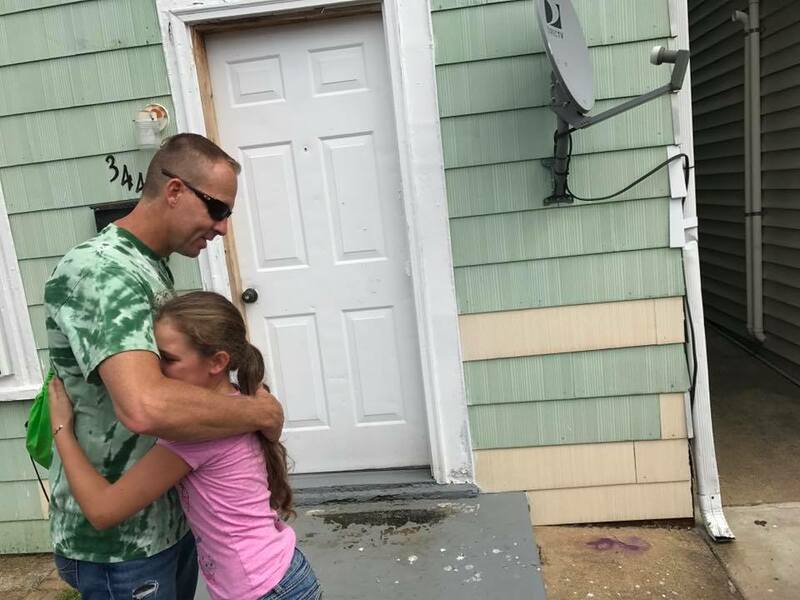 The latter is a challenge as families tend to move between the homes of relatives and friends, as well as motels and hotels, in their search for stable housing, Pentoney said. 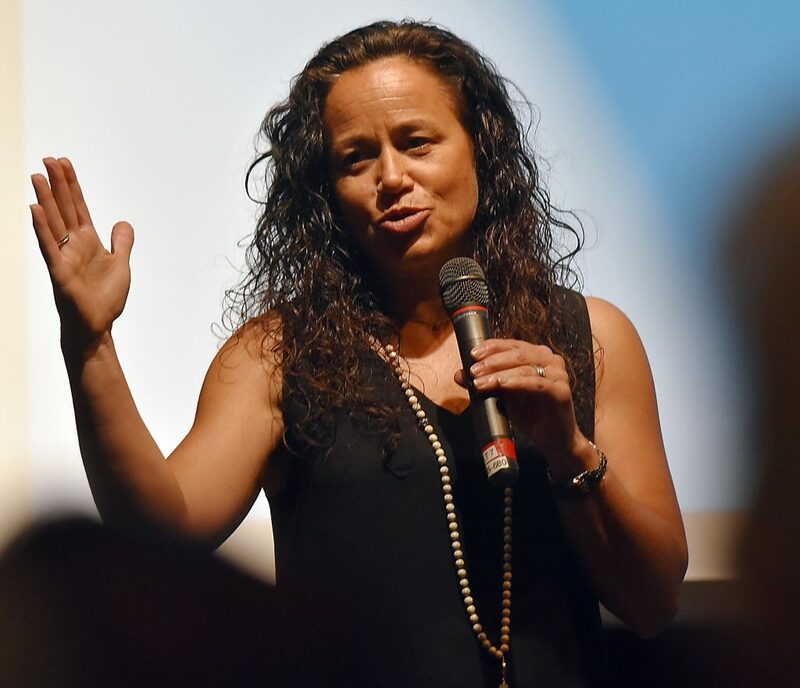 The school system tries to keep the children in what would be their regular schools in order to maintain a healthy educational routine, she said. The event was also about having a good time. “This is my community. 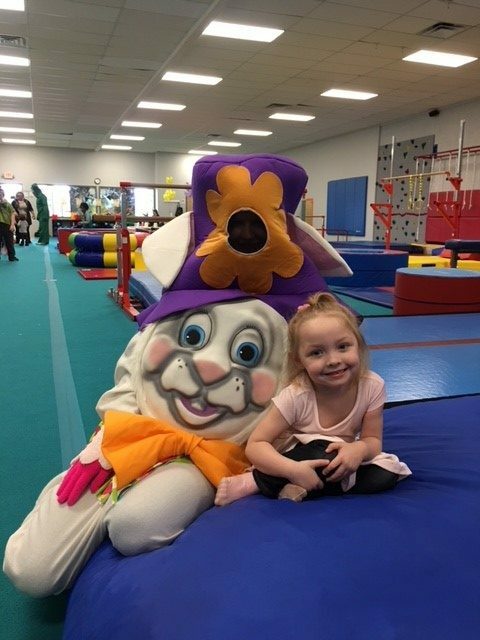 … All the kids and grandkids went to Bester, so far,” said C. Burker, who was there with her daughter, Laci Hammer, and granddaughter Legaci Jones. While they were enjoying the day, they also had a stroller packed with brochures and pamphlets from the resource providers. 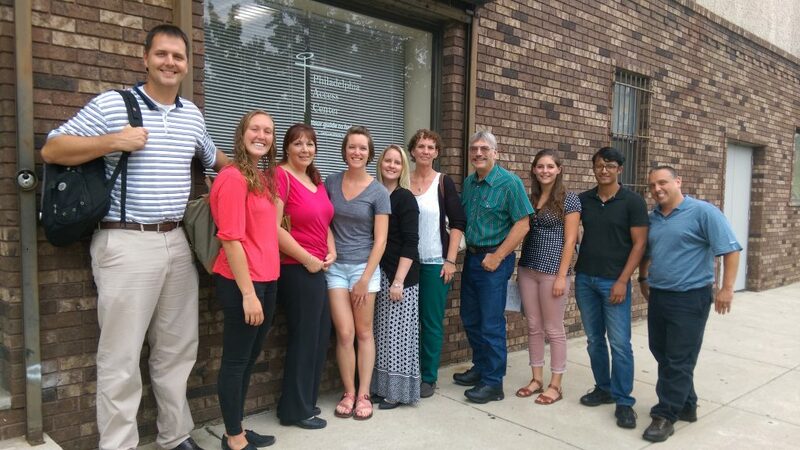 Over 100 families have registered for the new Bester Health Center in the first week of school! 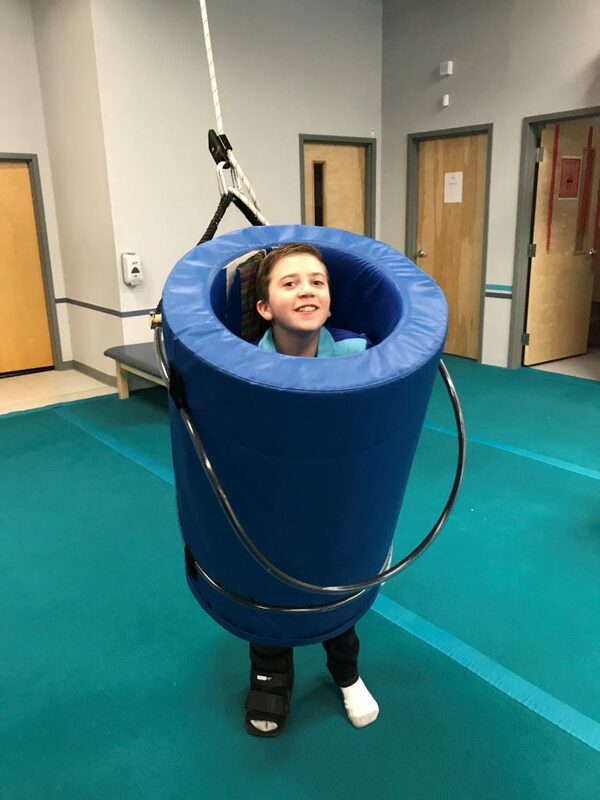 The program, sponsored by the Community Free Clinic, provides convenient access to acute care while all Bester Elementary children are at school for no cost. The program will be available starting September 6th, if your child attends Bester Elementary be sure to sign up today! 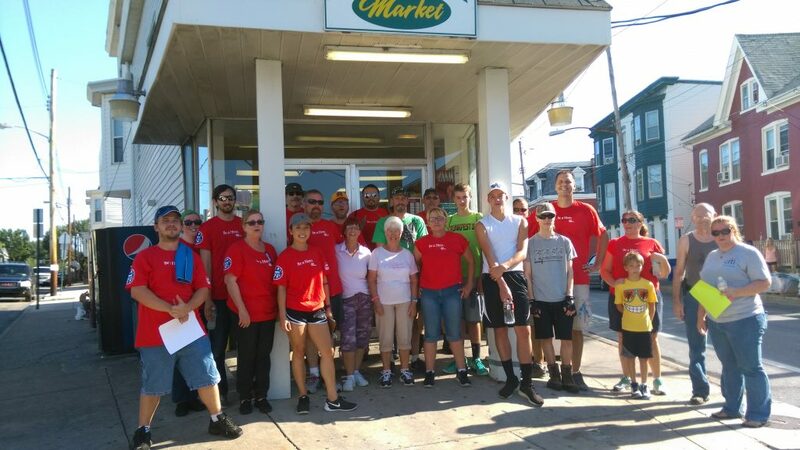 On Saturday August 13th, the Lowe’s Home Improvement Store located on Shank Farm Road in Hagerstown partnered with Neighborhoods 1st of the City of Hagerstown and the Bester Community of Hope to beautify neighborhood spaces on a six block corridor of Locust Street. 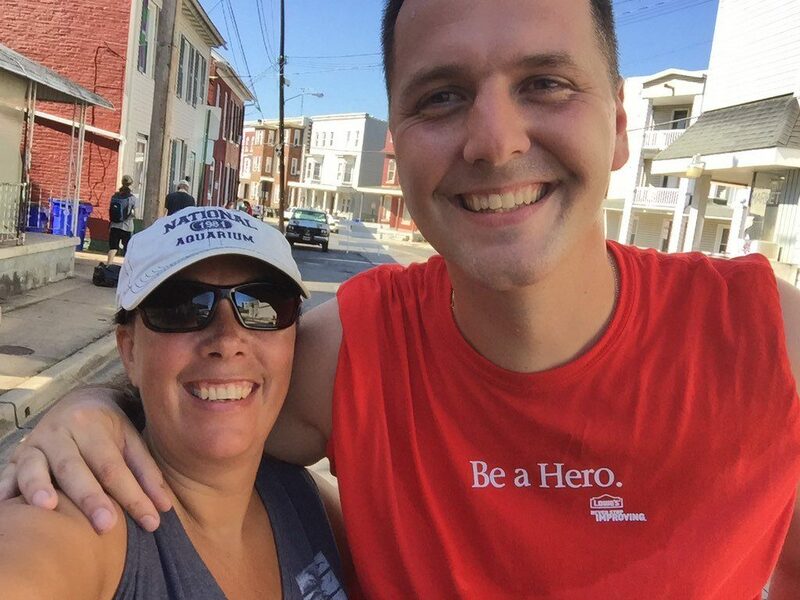 The story of the day was oppressive heat, with temperatures soaring in the high 90’s, a group of almost 40 volunteers worked throughout the day as the heat index climbed over 110. At least it didn’t rain! 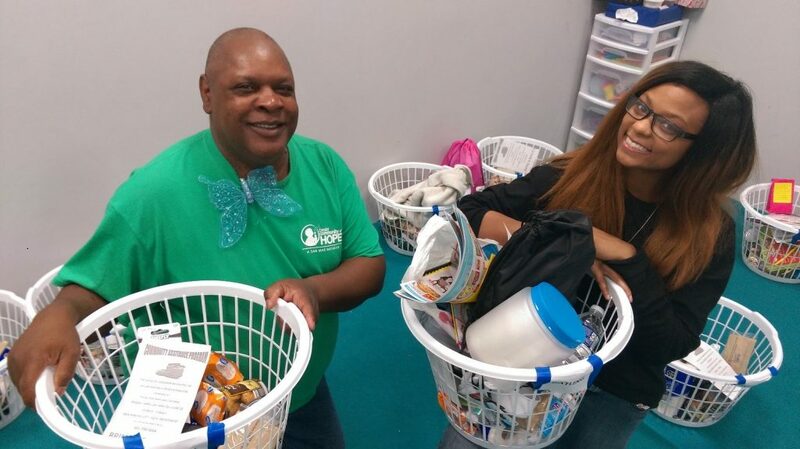 The story of the day wasn’t simply Lowe’s and their substantial investment of resources and volunteers, but it was also neighborhood residents and organizations such as Lifehouse Church, who found ways big and small to join the effort. 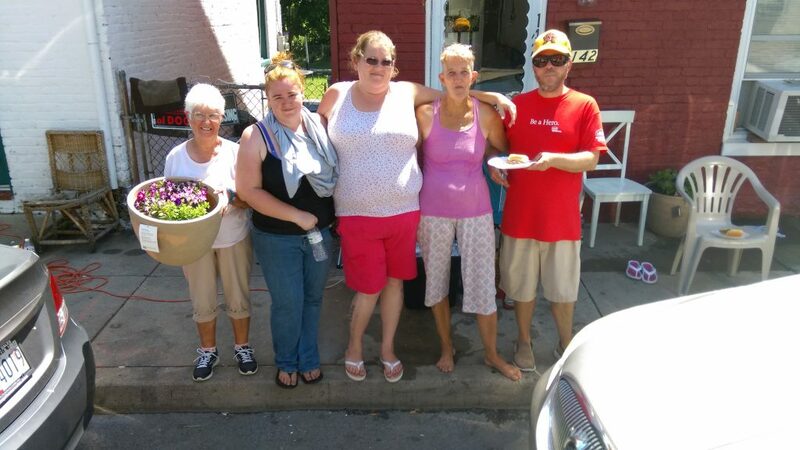 A couple ladies were so impressed that the volunteers kept working through the heat that they started grilling hamburgers and handing out drinks. When asked why, they responded, “I may not be able to physically help, but you guys are doing this for us so I’m doing this for you.” When it came to physical help, some of the younger guys helped load heavy bags of soil, and they even let us use the water supply from their homes for hard to reach power washing. 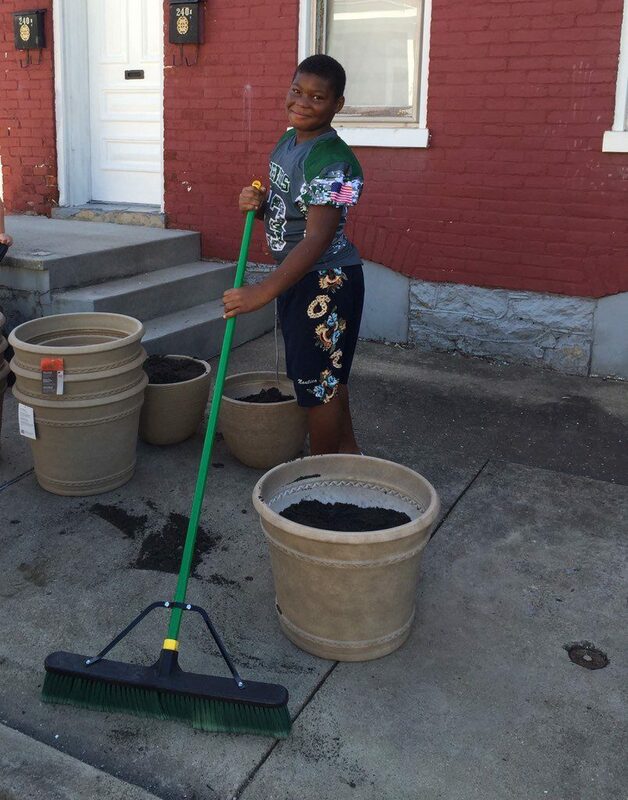 People came out of their homes and helped organize planters and sweep up the street, it was a team effort. The signature portion of the project that you can now see each time you drive down Locust Street are blue paw prints in newly painted crosswalks signifying the journey Bester Elementary students (Bears) travel on their way to school. It’s important as we drive through these communities that we remember kids and families live and play here, and as a walking school district everything we can do to support a great environment for those families to travel through will improve their daily life experience. Other highlights included: Every home in the six block range of Locust Point to Antietam Street received high quality planters with soil and flowers for the front of their homes, pressure washing some highly visibly walls and a new coat of green paint on a long wall from the Locust point market past the storage facility, repairing a noticeably damaged fence, new lighting for the interior and exterior of Locust Point Market as well as planting trees behind the market for shade and additional plant life, trash pick up along the entire corridor, and significant enhancements to the Bester Elementary courtyard including furniture and painting. 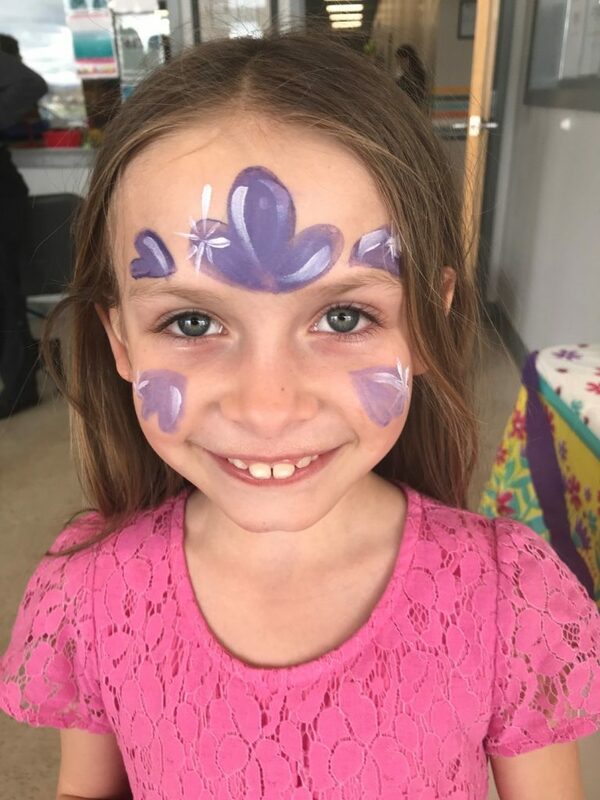 One other addition will come this coming Saturday as Lowe’s returns to paint a couple of areas with green bear paw prints on some sidewalks as well as a hopscotch. 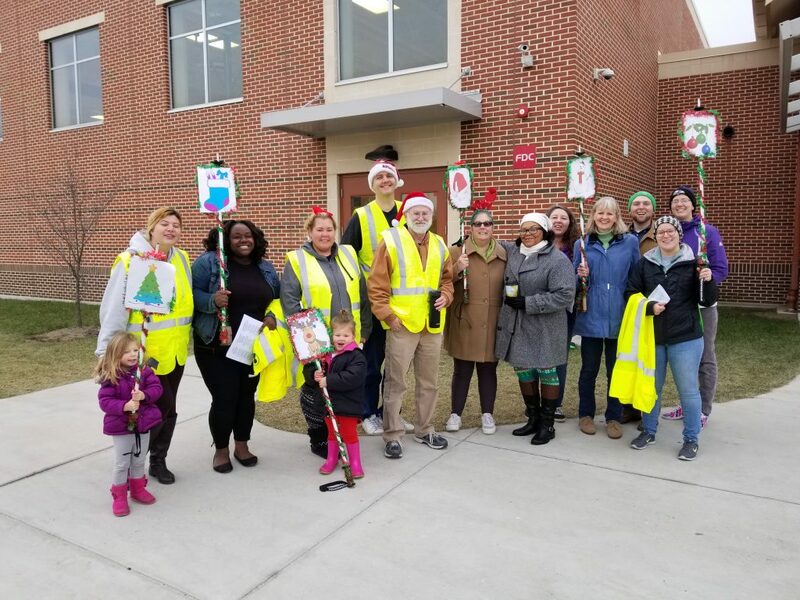 Our sincere thanks to the Bester Communities First Neighborhoods 1st group, Lowe’s of Shank Farm Road in Hagerstown, the City of Hagerstown, and all of those residents who helped to bring this vision to a reality. In what city officials hope may be part of a long-term effort, South Locust Street will be closed Saturday to allow for a street cleanup and beautification project. During a Aug. 2 Hagerstown City Council meeting, council members unanimously voted to close South Locust Street from 9 a.m. to 2 p.m. for the community effort. The project is being headed up by the Bester Community of Hope, Lowe’s Home Improvement and a new Neighborhoods 1st group known as Bester Community First. 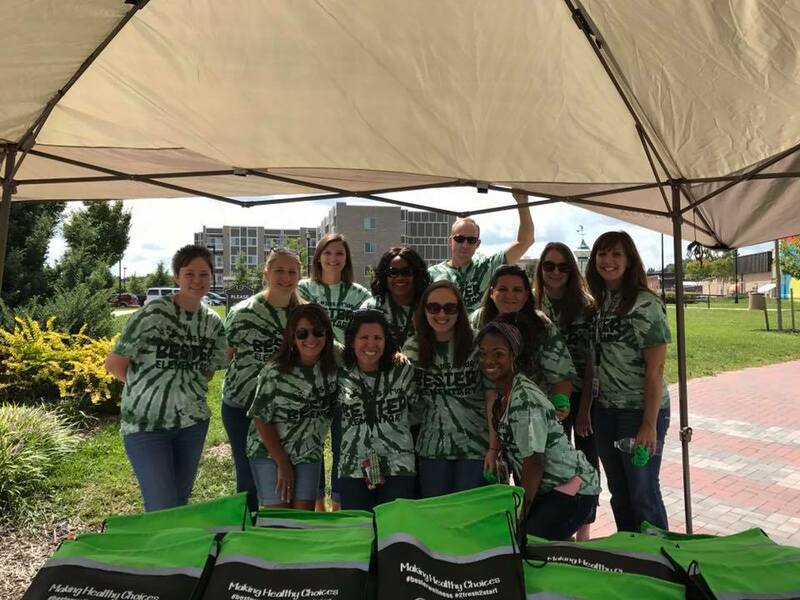 Neighborhoods 1st is a network of organizations that partner with the city to plan and implement events and projects that contribute to the livability and sustainability of communities. 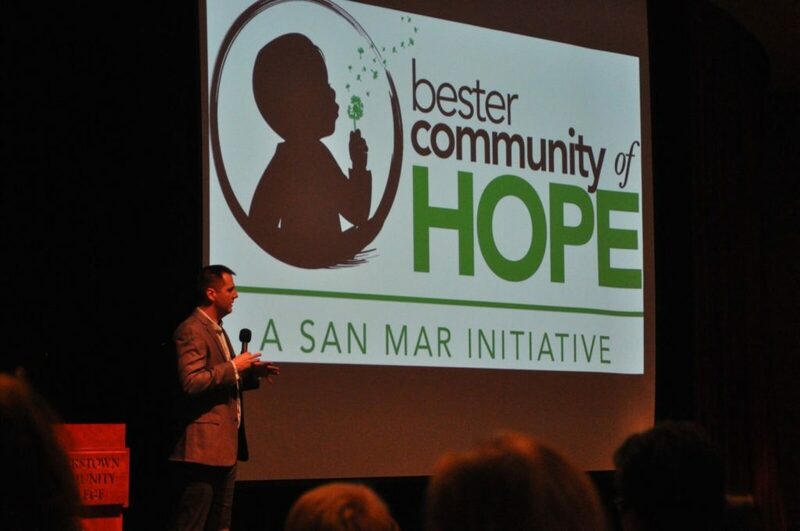 Bester Community of Hope is a San Mar-based initiative that works on positive outcomes for children and families in the Bester Elementary School neighborhood. Initiative Director Keith Fanjoy said his group worked to bring Bester Community First and Lowe’s together for the effort. Officials said at the council meeting that they are expecting 40 to 50 volunteers to turn out on South Locust Street to pick up trash and remove weeds. 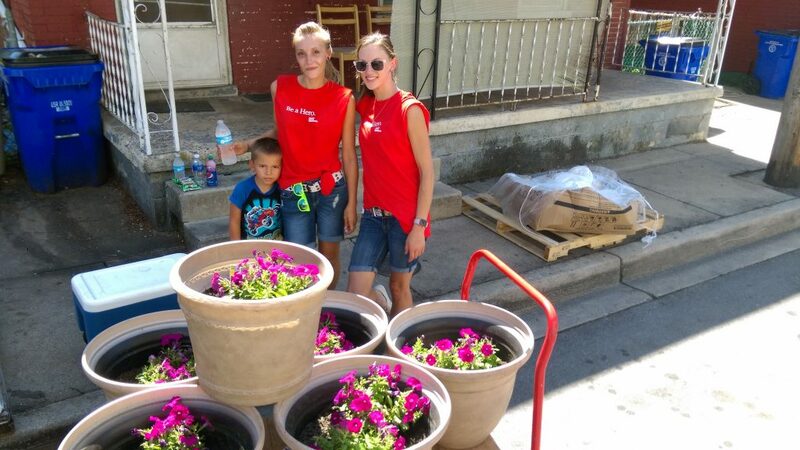 Planters have been purchased for people along the street, and Lowe’s will donate soil and flowers to fill them, said Sarah Nelson, the city’s planning and outreach coordinator. Lowe’s also plans to improve the exterior lighting on Locust Point Market at the intersection of South Locust and South Potomac streets, Nelson said. Sam Barrick, leader of Bester Community First, said her organization already existed but under a different name. There were also some different members of the former group, she said. She said that a lot of people did not know the group existed, but she hopes people will be inspired to get involved. In the future, Barrick said she would like to see Bester Community First get involved in activities for parents and children. Nelson said northbound traffic on South Locust Street will be diverted from the street starting at Memorial Boulevard. Motorists will be directed to South Cannon Avenue, she said. The work will extend to Antietam Street, although Baltimore Street will remain open, city officials said. Sunday has been designated as a rain date for the cleanup. 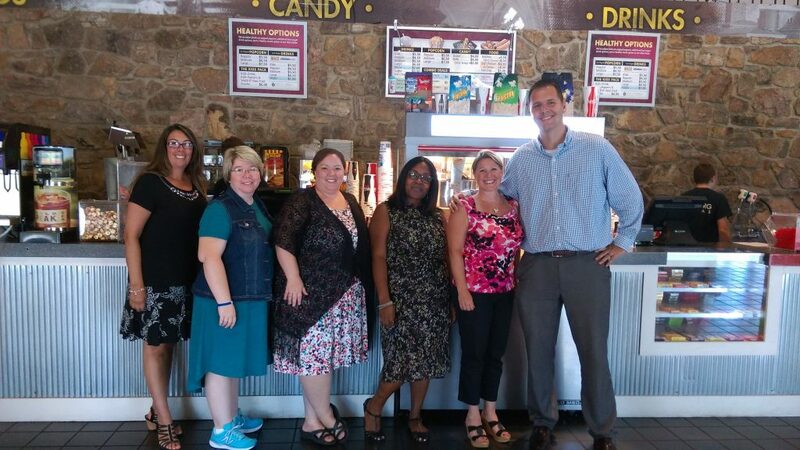 Bester Elementary Principal Kristi Bachtell and BCOH Director Keith Fanjoy welcome special guests to today’s “Paper Tigers” screening and trauma training at Leitersburg Cinemas. 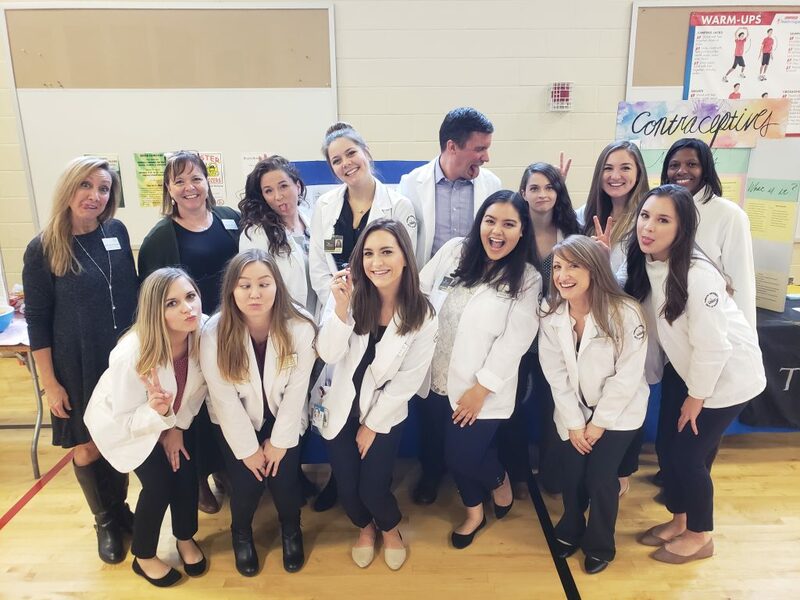 Woodbridge School District (DE) staff Dr. Michelle Marinucci, Mrs. Tina Morroni, Dr. Laura Leach and Mrs. Mondaria Batchelor led an important panel discussion with Antietam Academy and Bester Elementary staff to kick off the new year! 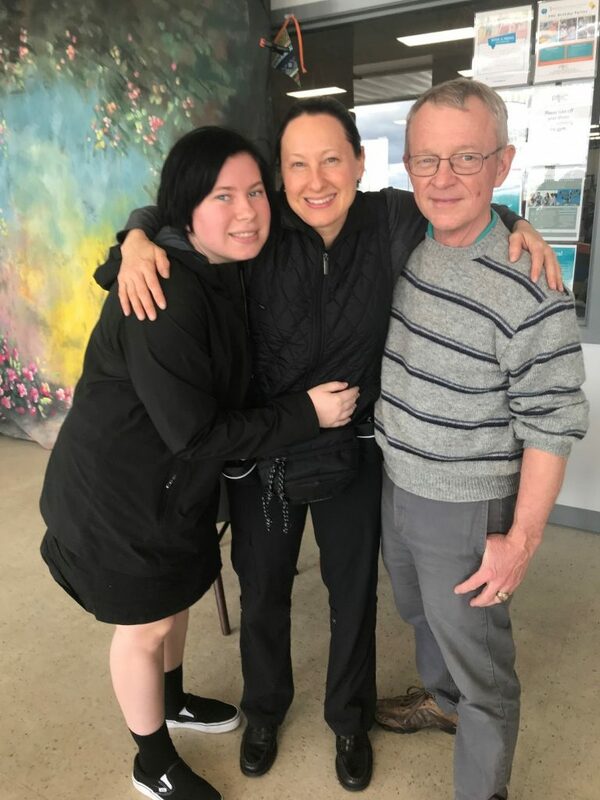 Thanks to Casey Family Programs for connecting us with these special people! 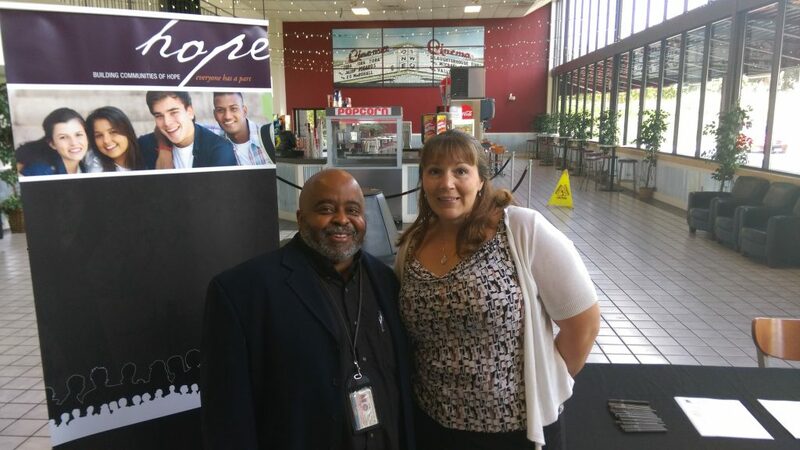 David Washington, LCSW-C, of the Washington County Health Department and Program Manager Kerry Fair of the Bester Community of Hope connect after today’s screening of “Paper Tigers” at Leitersburg Cinemas. Special thanks to David for his compelling presentation following the film! 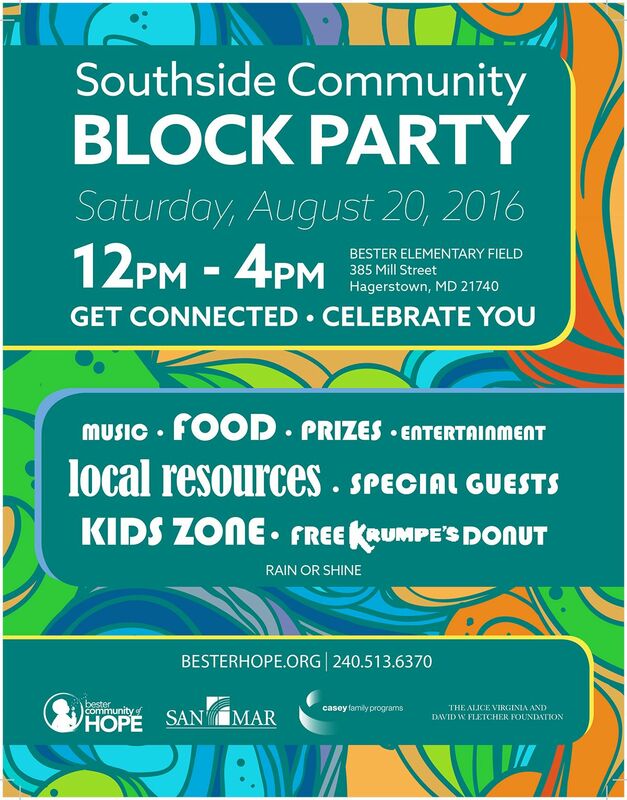 Please come celebrate with us at the Southside Community Block Party on August 20, 2016 for music, food, prizes and much more! 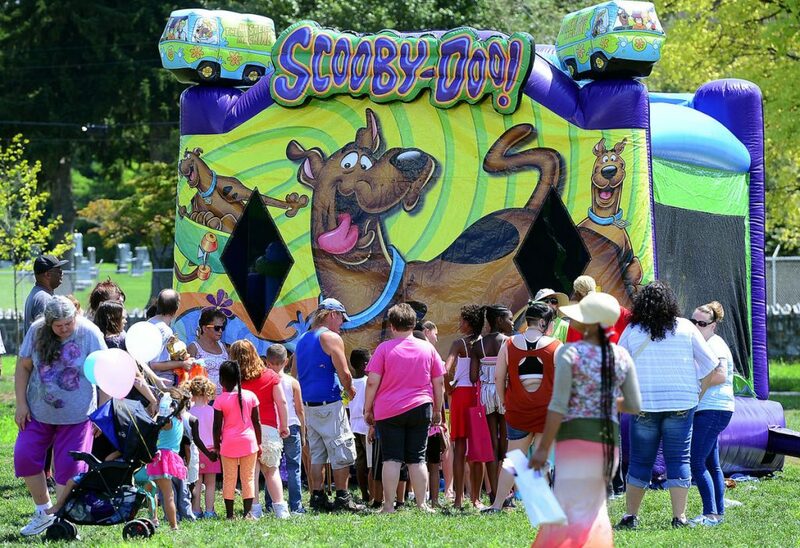 The event will be from 12:00pm – 4:00pm at the Bester Elementary Field. 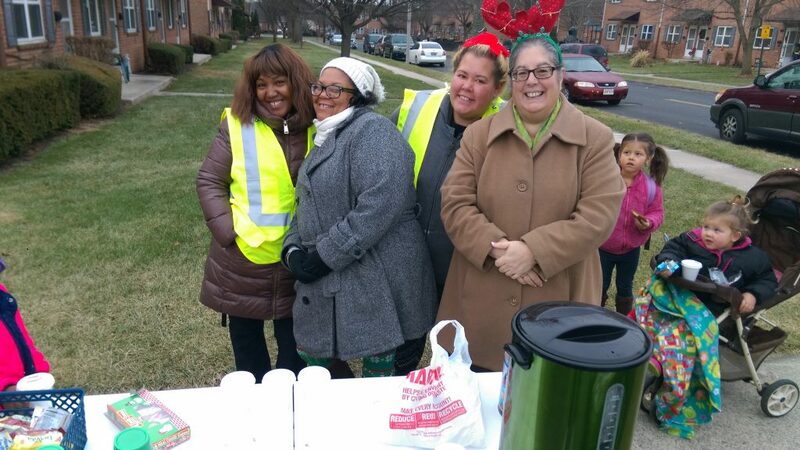 Looking back at the first half of 2016, as we have begun to build important community opportunities, we have been able to touch lives in many significant ways in the Bester neighborhood. One of the most poignant and memorable events took place on June 1, 2016. 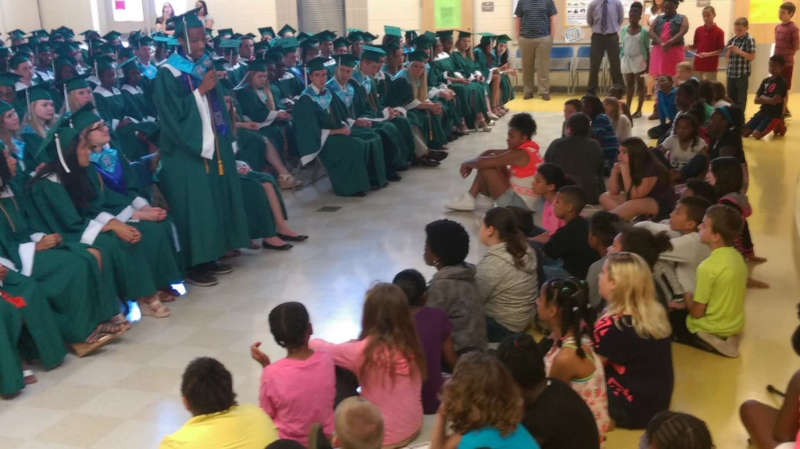 This year, a total of 268 students graduated from South High School in Hagerstown, MD and as seen in other communities across the country, the students of Bester Elementary School welcomed the graduating class of South High School with cheers, posters and pride as the seniors walked down the main halls of the school in their caps and gowns. To a third grader, completing high school and graduating seems a lifetime away and to the graduating class, it all went by so quickly. Meanwhile, teachers who invested so much into these young minds are able to see the much needed return on their investment. 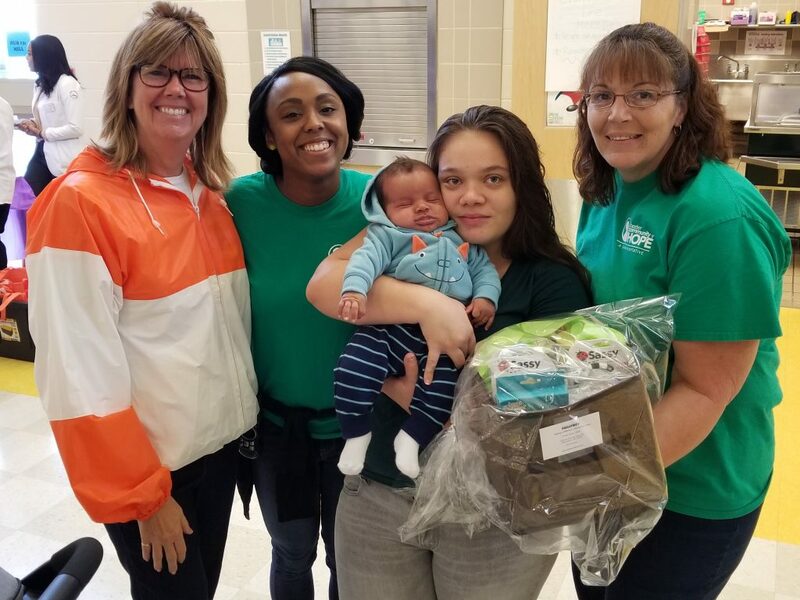 For some of these young adults, it was a trip back in time as they previously attended the old Bester elementary school, and for all it was the opportunity to show that hard work, persistence and believing in your dreams pays off. Bester Elementary students also asked “what kept you motivated” and “what would you do differently”? Seniors responded by talking about the people who pushed them to work harder and being willing to take more risks despite the fear that holds them back. One student stated “It’s not always going to be the people that you expect that will put you down, but you have got to fight through it. It gets hard, I’m 6’3’’, but life is going to hectic. You’ve got to get those Jordan’s on and dribble down that court”. 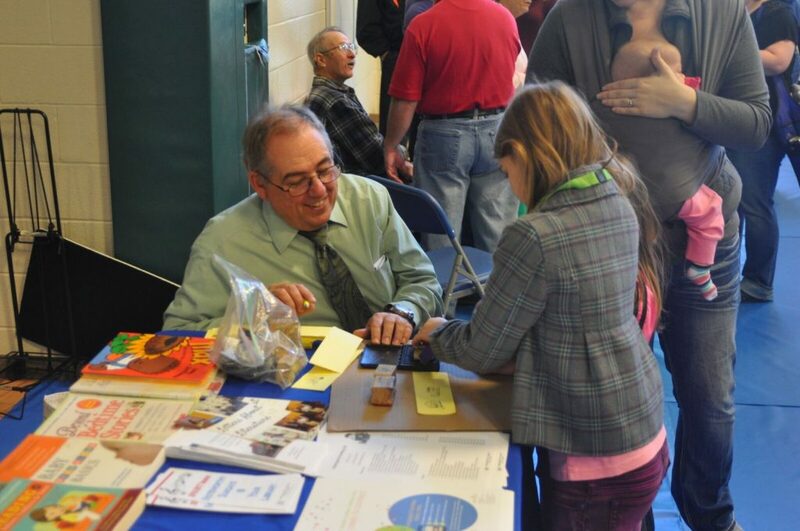 As we move into the future with our community wide efforts, it will always be important to remember that when looking for local and long-term solutions, kids have the answers. D. Michael Piercy took over as the new Director of the Washington County Department of Social Services at the end of 2015. 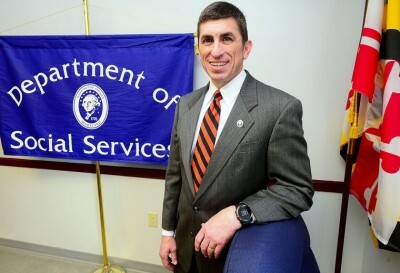 When D. Michael Piercy became director of the Washington County Department of Social Services, he knew he had big shoes to fill. 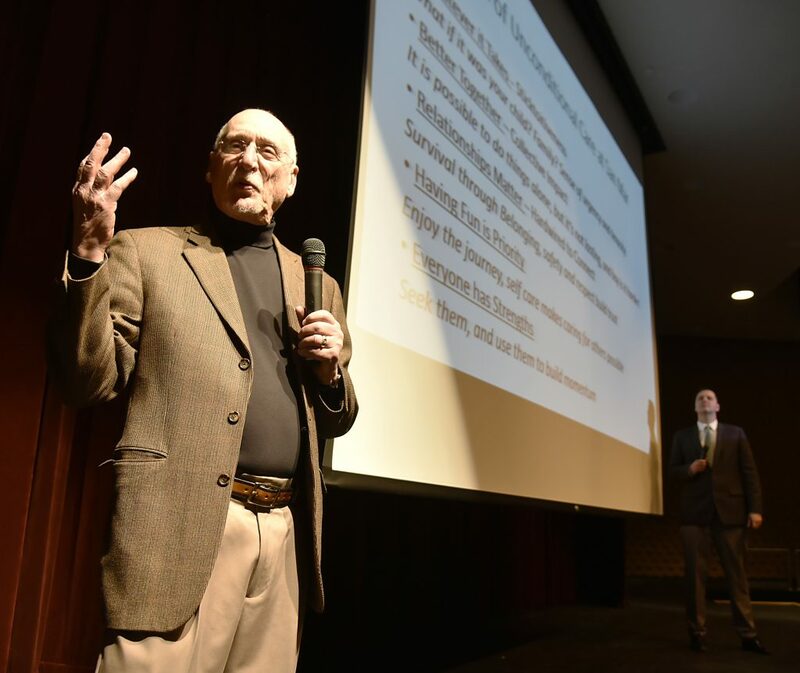 His predecessor, David Engle, had held the position for 27 years, while implementing new programs and overseeing existing ones that affected thousands of county residents. 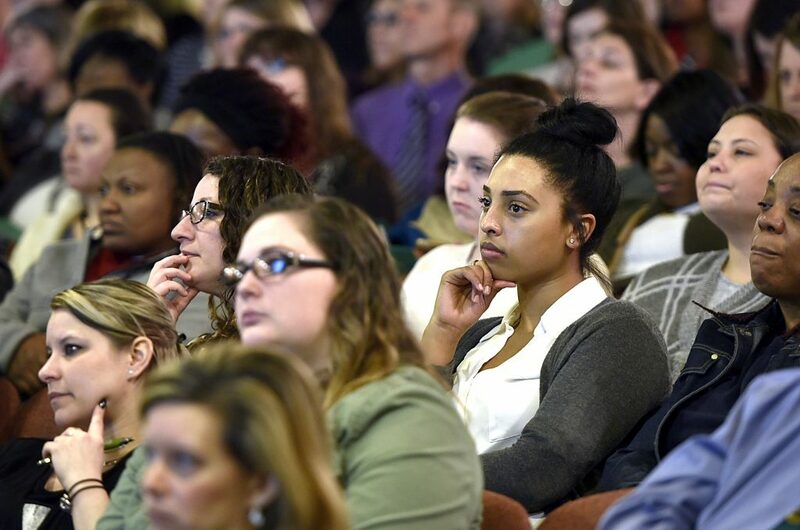 On Monday, March 21, social workers, educators and more filled the gymnasium of Bester Elementary School as leading trauma experts from across the nation linked findings from the ACE Study (Adverse Childhood Experiences) with staggering proof of health, social, and economic problems resulting later in life. 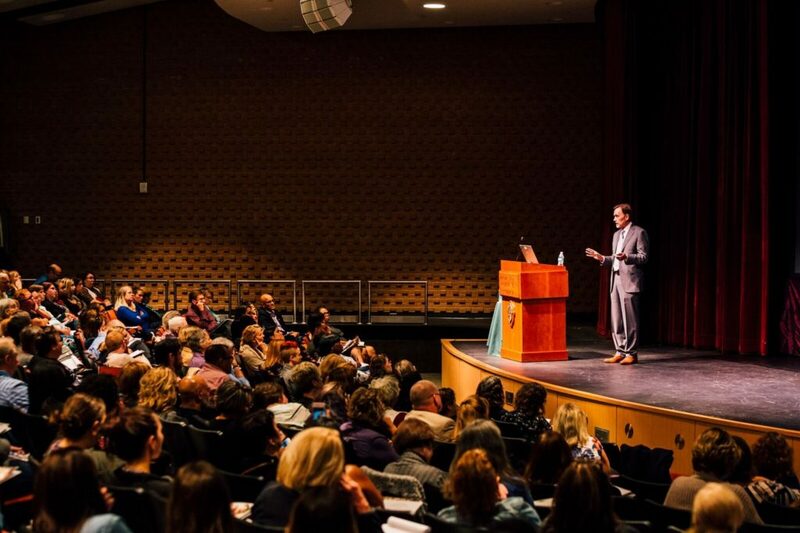 The research, conducted over a 10-year period, by Dr. Vincent Felitti, one of the conference speakers, involved over 17,000 participants and has become influential in demonstrating the need for effectively responding to childhood traumas early. 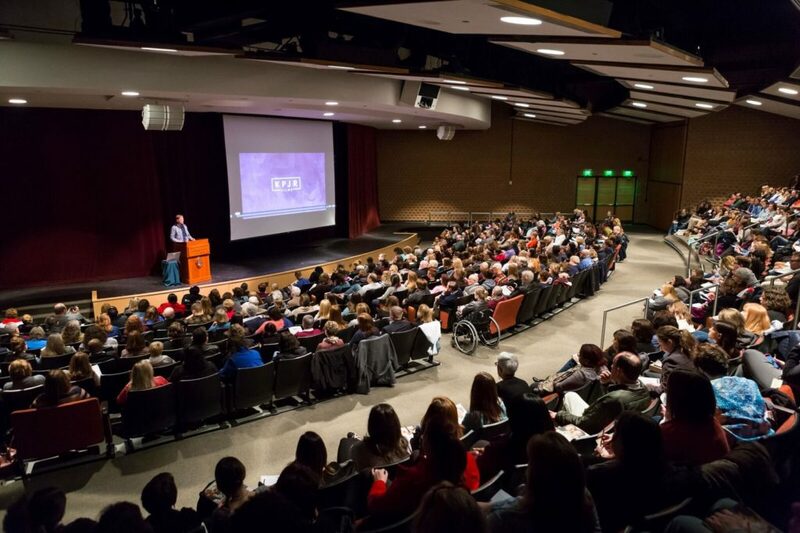 The conference, sponsored by San Mar’s Bester Community of Hope initiative, the Washington County Department of Social Services, Washington County Public Schools, The Alice Virginia and David W. Fletcher Foundation, and Casey Family Programs had over 400 in attendance. 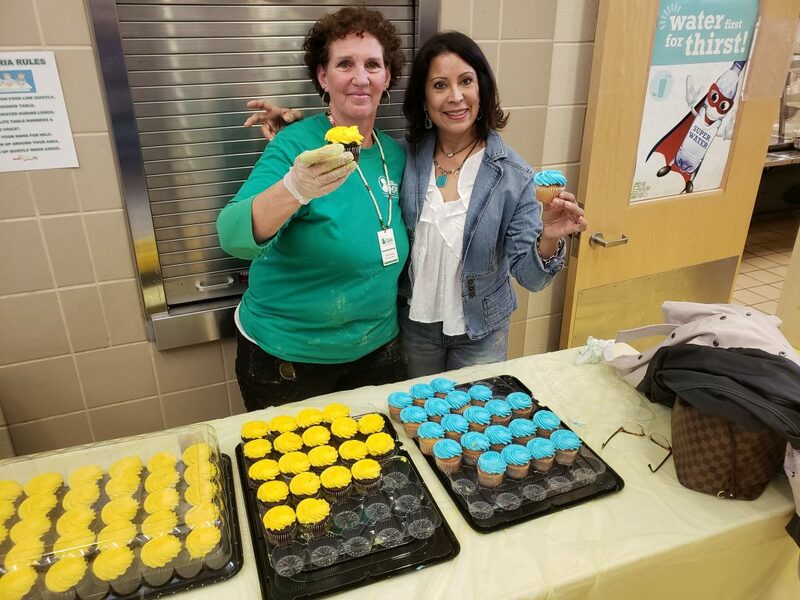 The PTA at Bester Elementary hosted a fundraiser event called “Comfy Cozy Night” for the first time Thursday night. The child-welfare system in America is shifting, and the top executive at San Mar Children’s Home said Monday that research is showing that children tend to respond better to interventions when assistance is made available within existing family and community support systems. 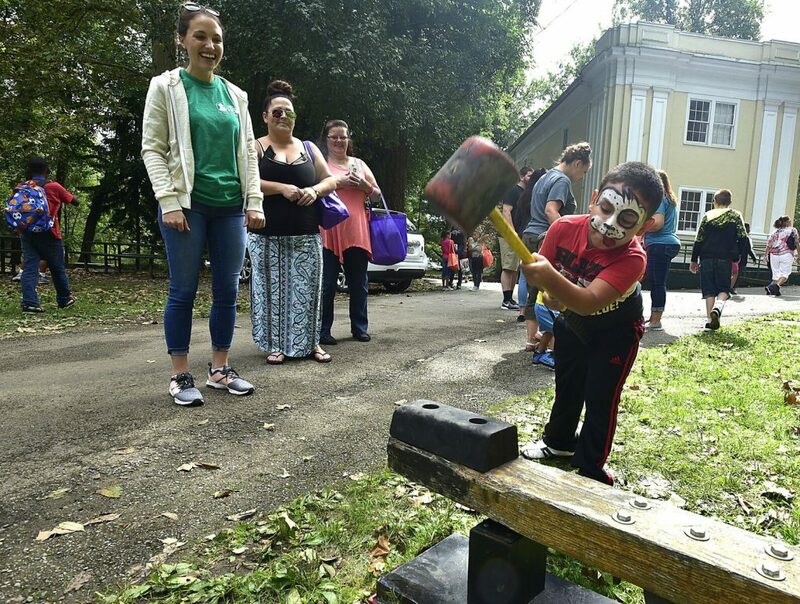 A children’s train, a dunking booth, live music and hot dogs were among the offerings the Alice Virginia and David W. Fletcher Branch offered its neighbors Sunday during the downtown Hagerstown library’s second annual block party. 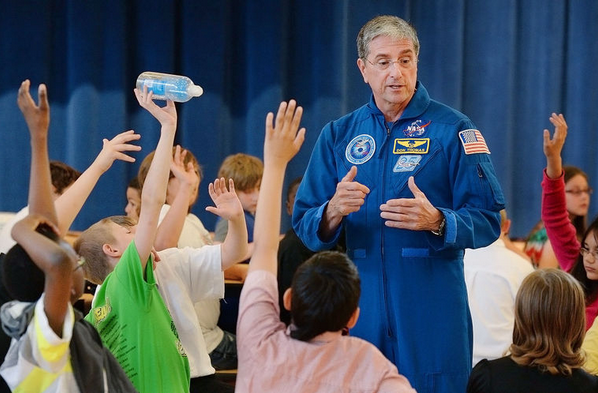 Don Thomas, a former NASA astronaut, touched down Wednesday at Bester Elementary School in Hagerstown’s South End to talk about his experiences in space and offer words of wisdom to the outgoing fifth-grade class. A former NFL player and a Paralympic silver medalist visited Hagerstown Friday to speak to students at Bester Elementary School. 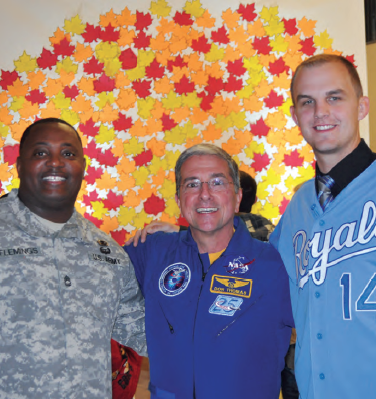 Bester Elementary School’s Homecoming showcased the hopes, dreams, and possibilities of committing to your goals. 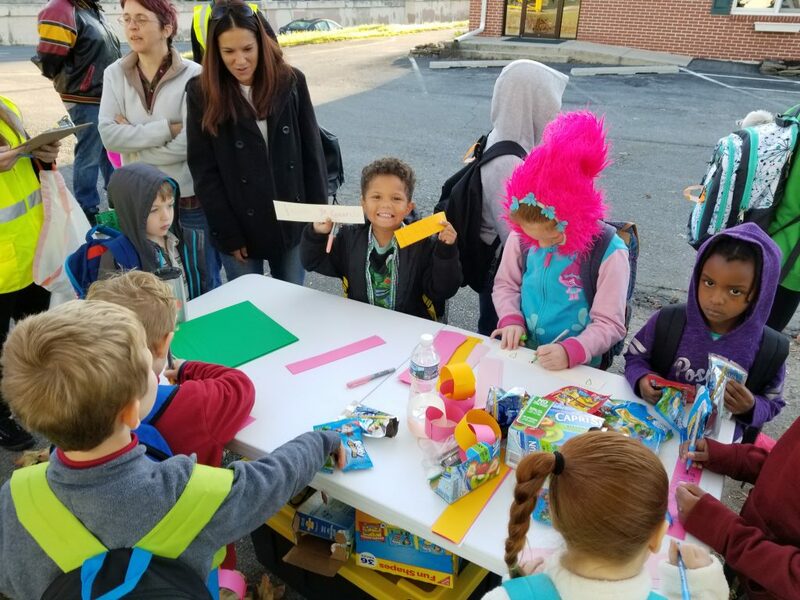 Close to 900 people passed through the doors of Bester Elementary School on Nov. 13 for a unique elementary school event with a homecoming theme to celebrate a building, and renewed hope for their neighborhood. 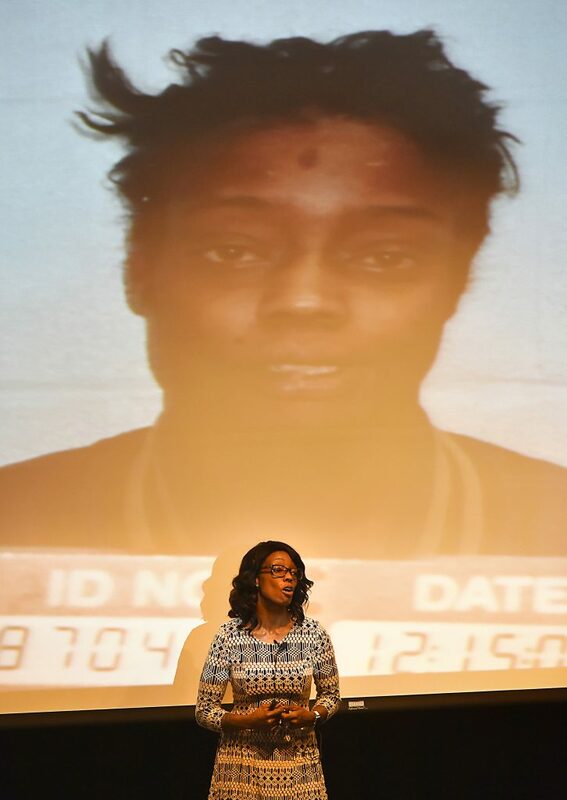 Children, families, and community stakeholders alike enjoyed a free dinner together, followed by a diverse program of speakers and special guests, as well as a video montage with voices of the children of the school describing their hopes and dreams not only for their lives but also for their community.